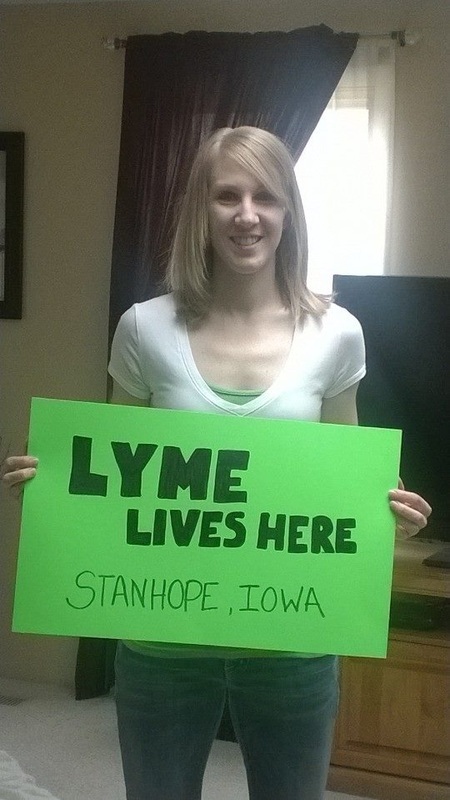 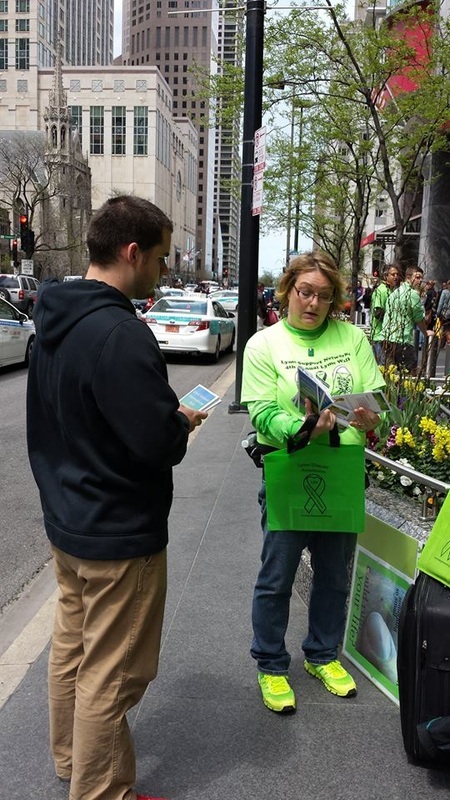 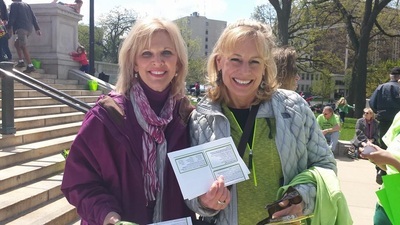 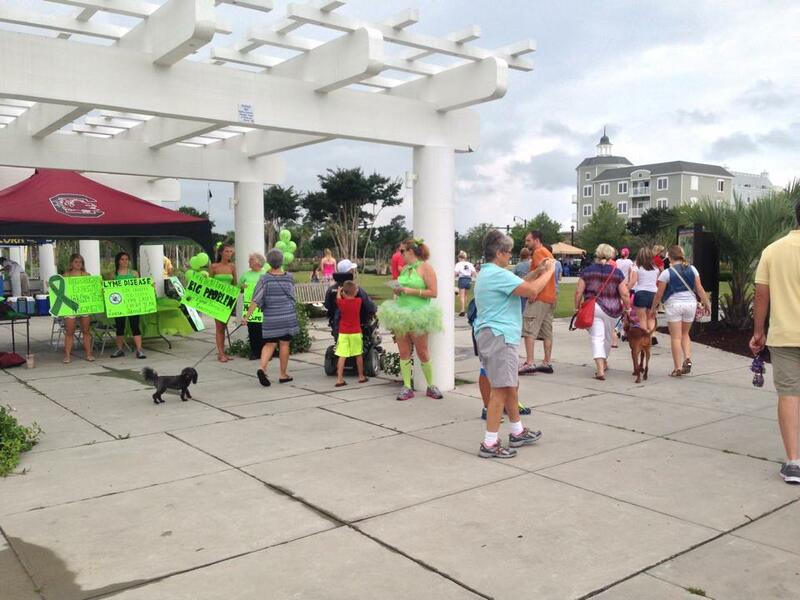 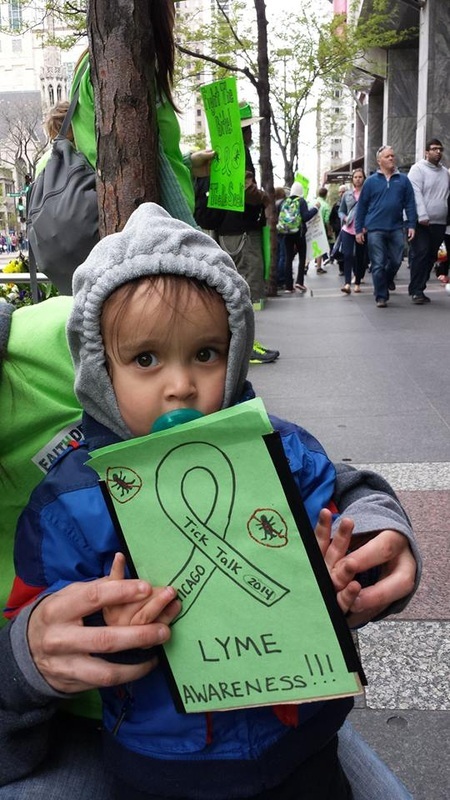 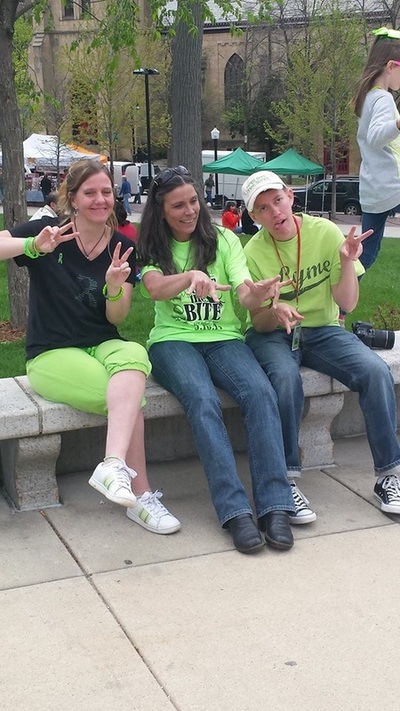 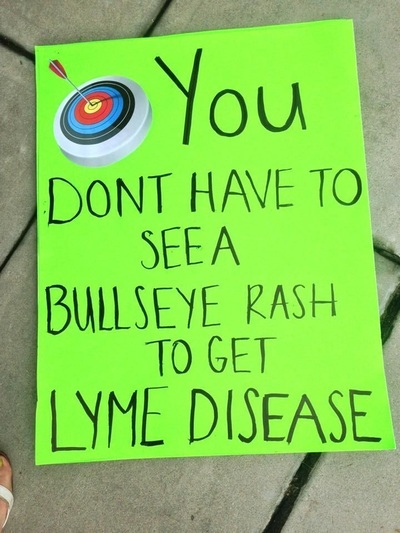 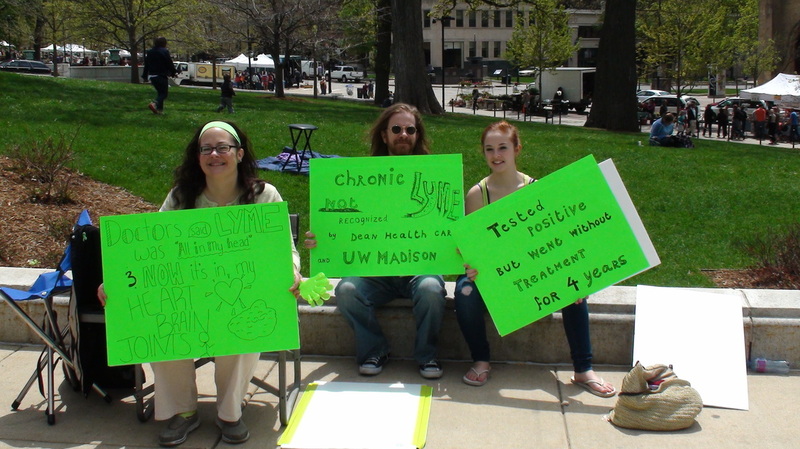 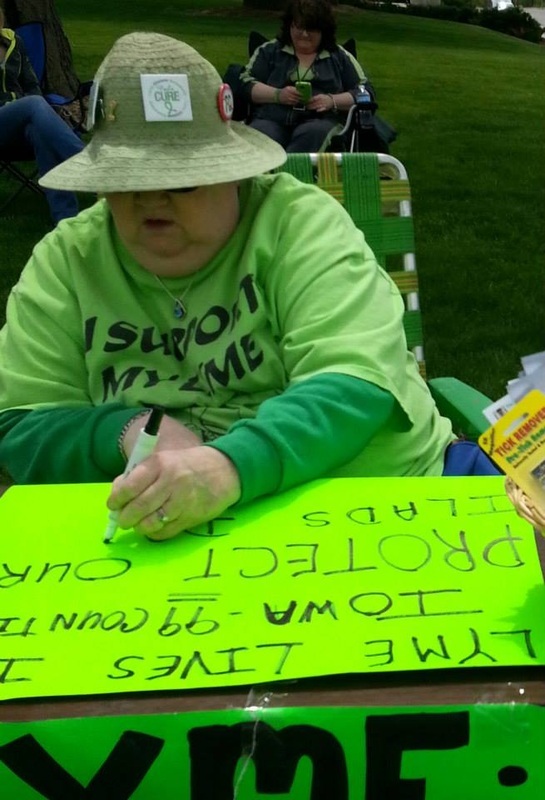 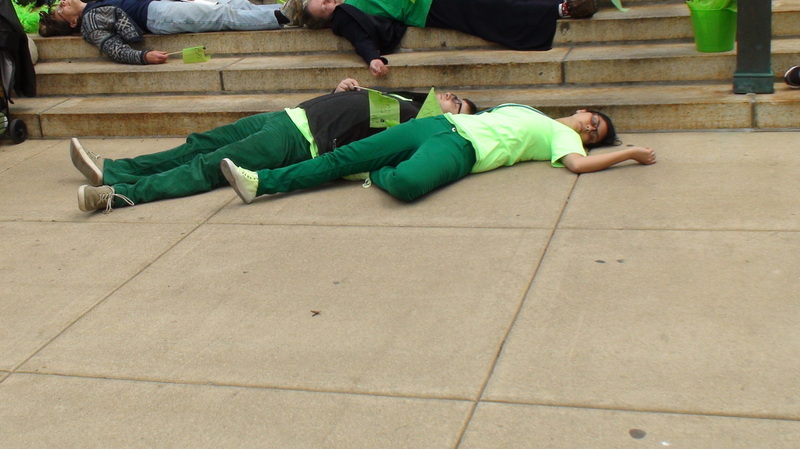 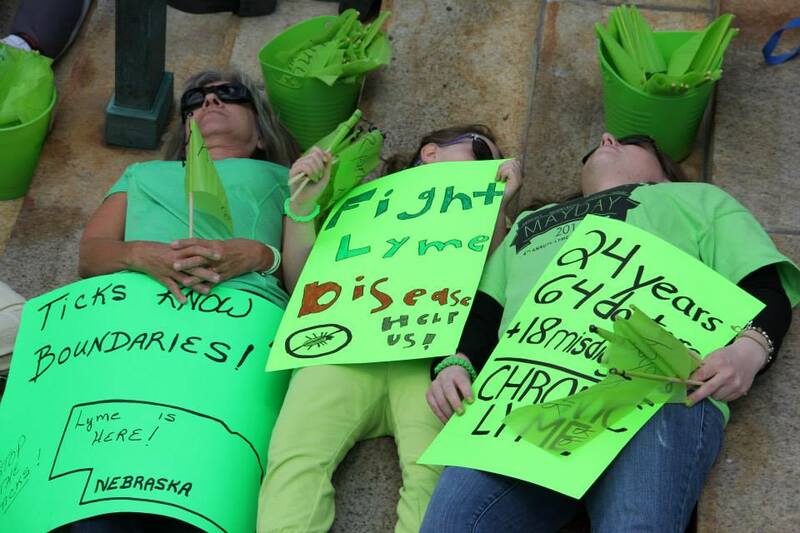 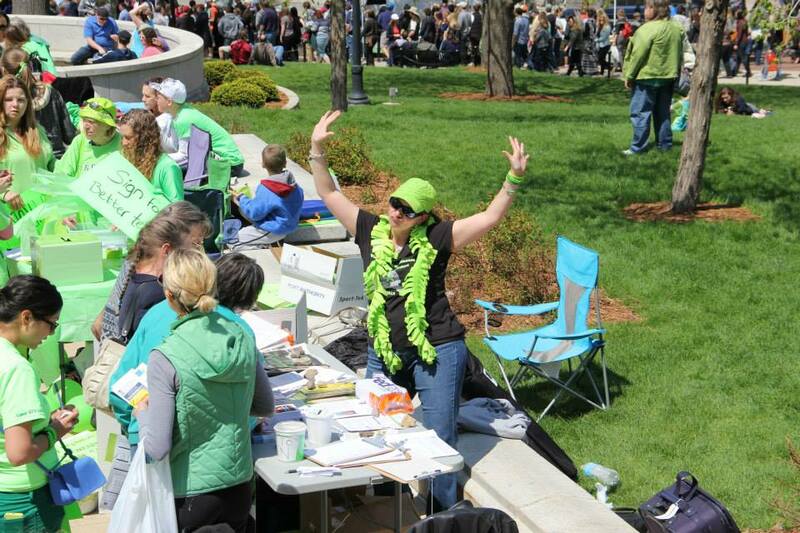 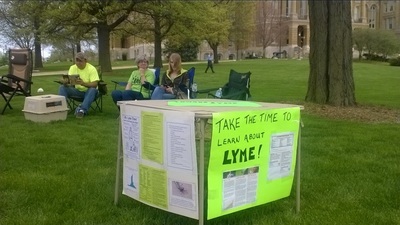 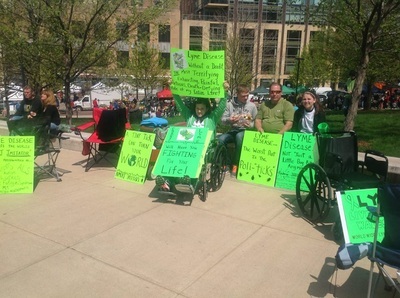 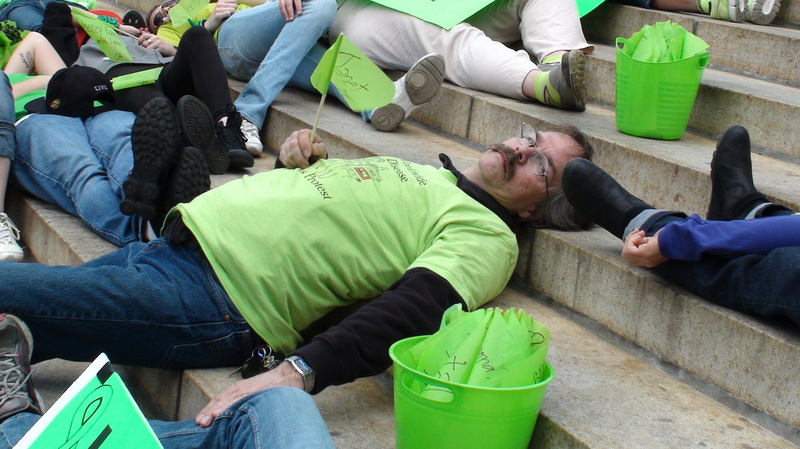 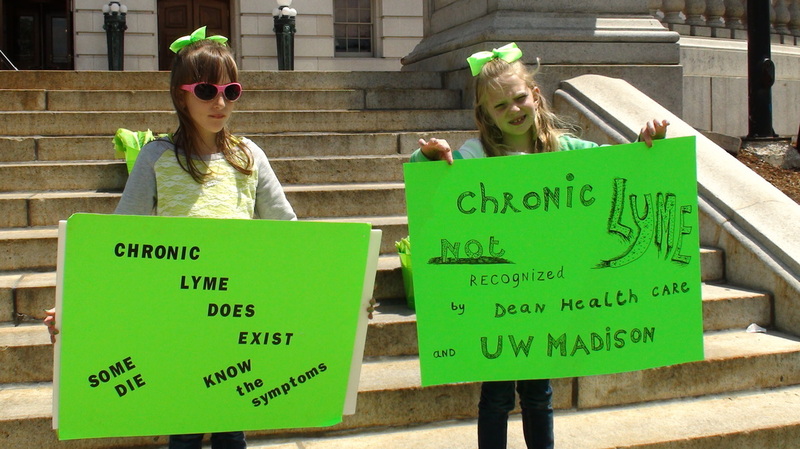 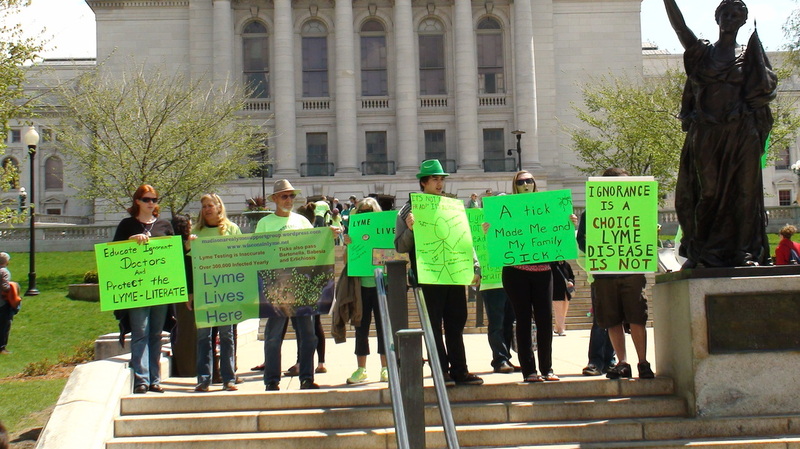 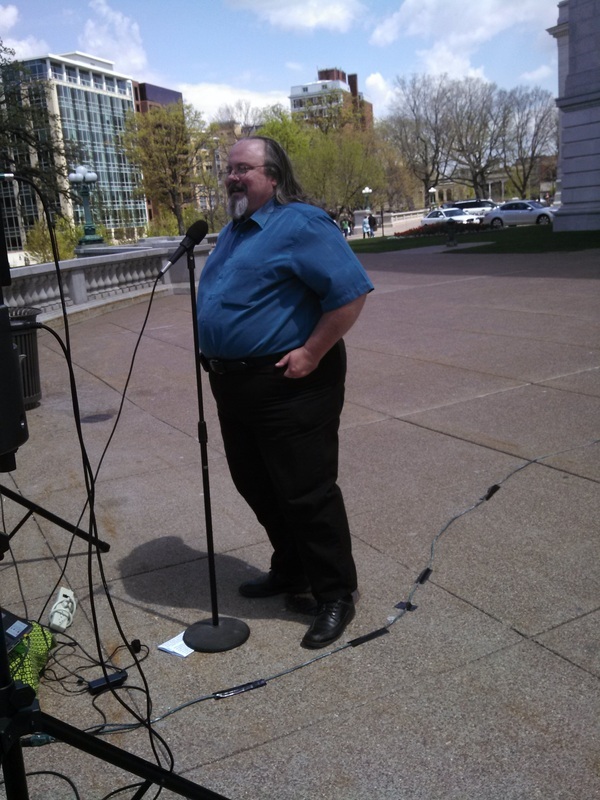 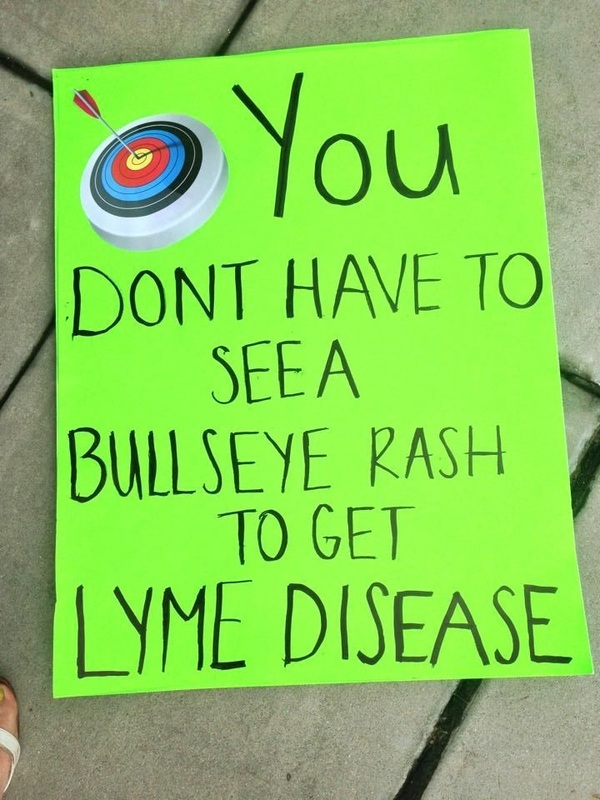 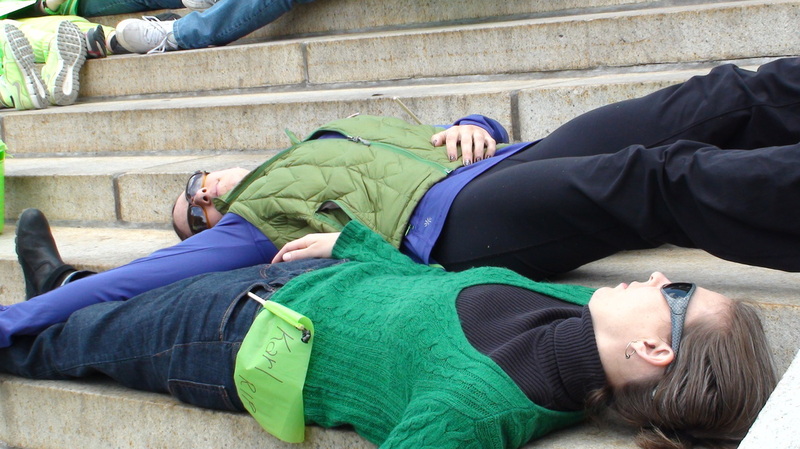 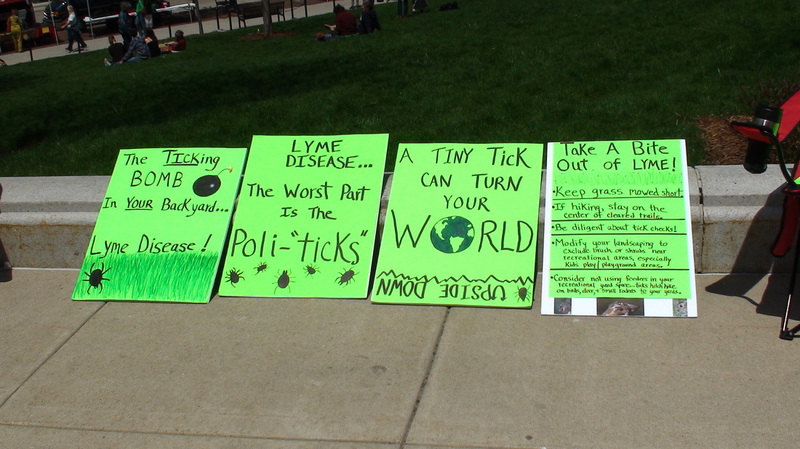 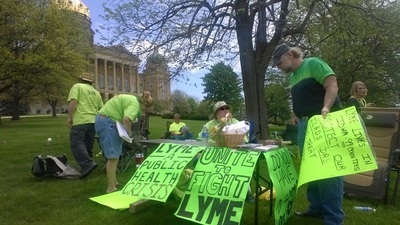 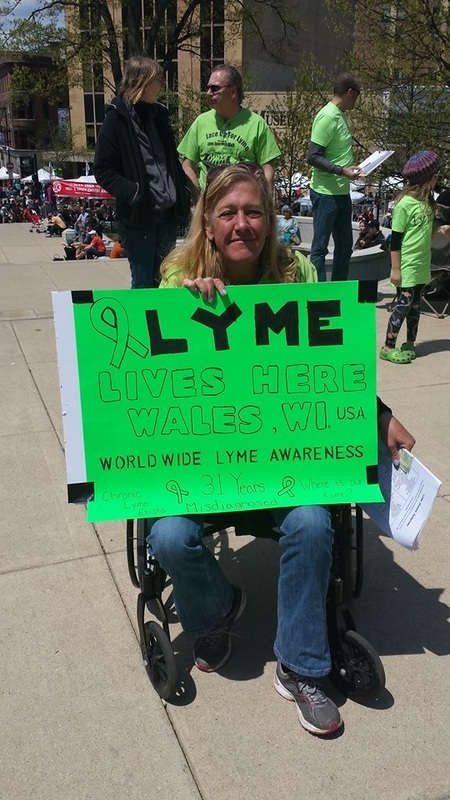 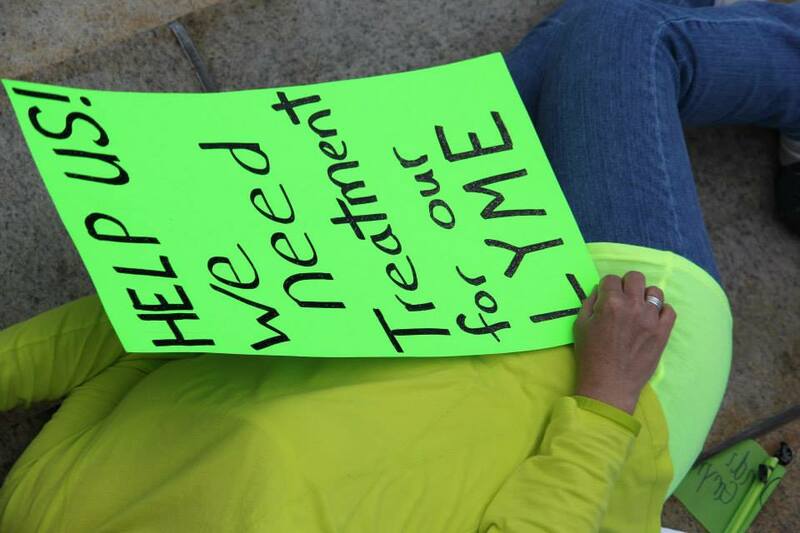 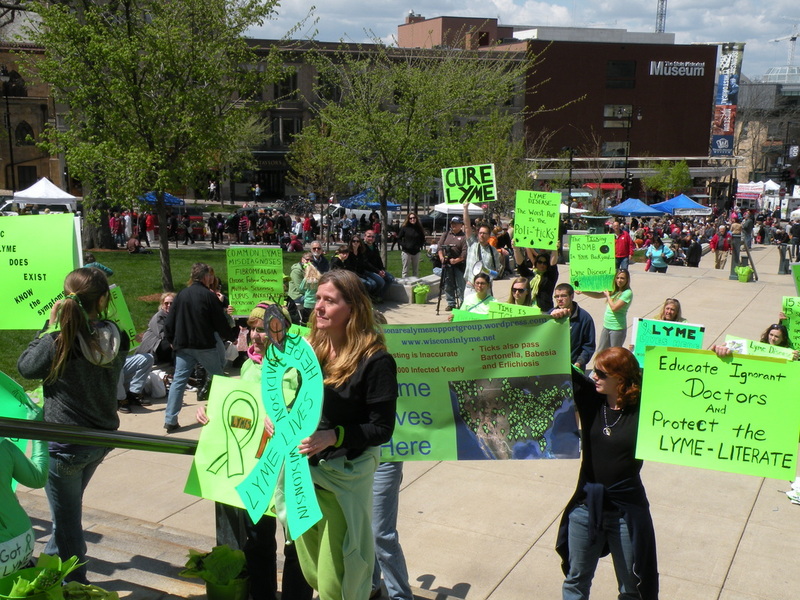 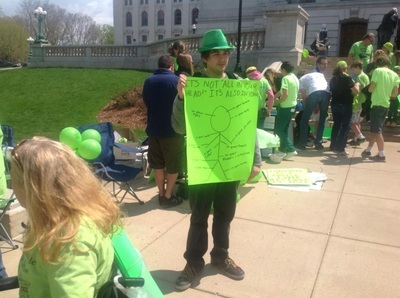 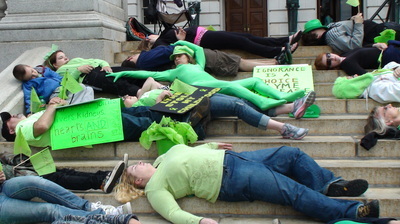 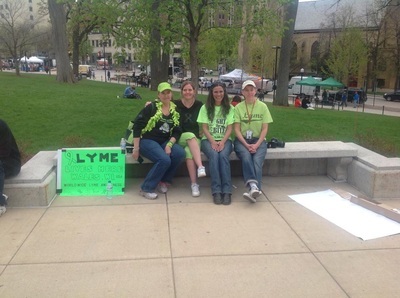 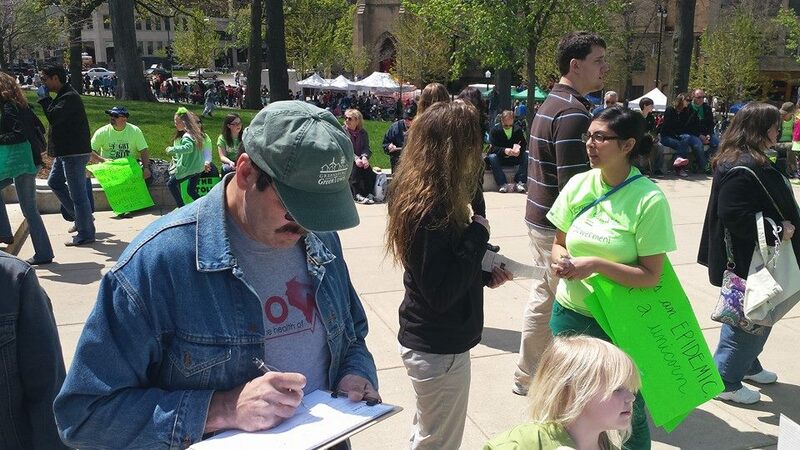 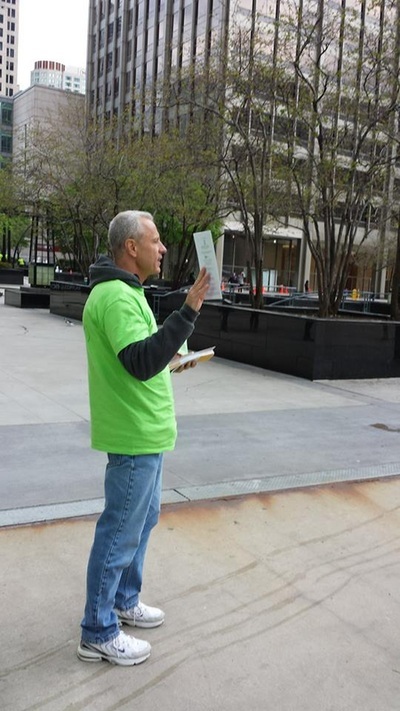 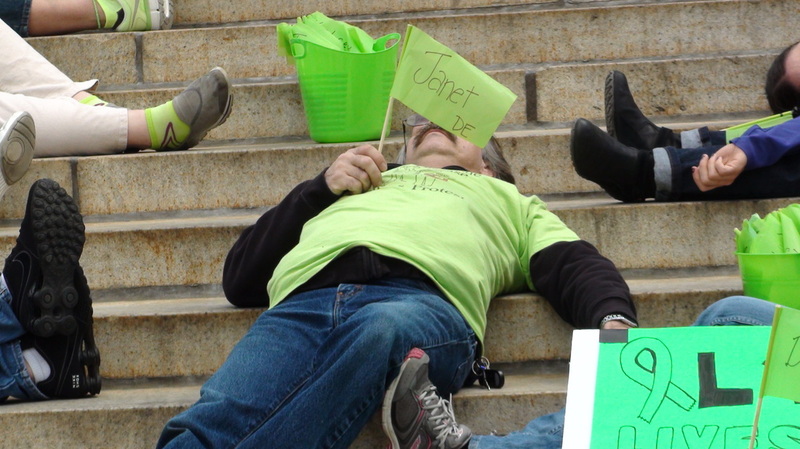 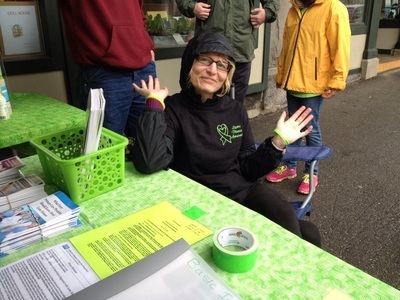 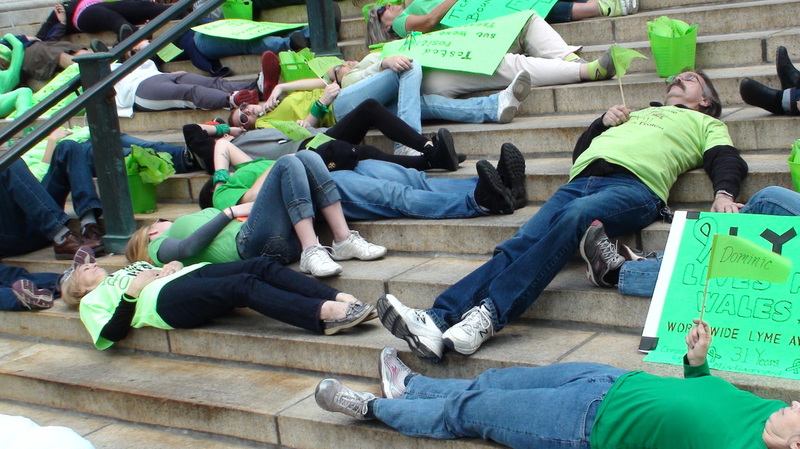 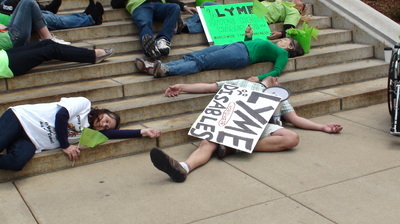 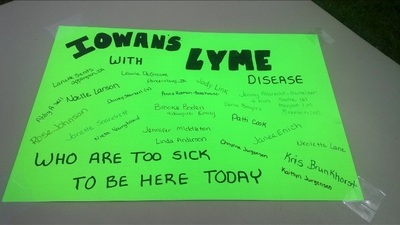 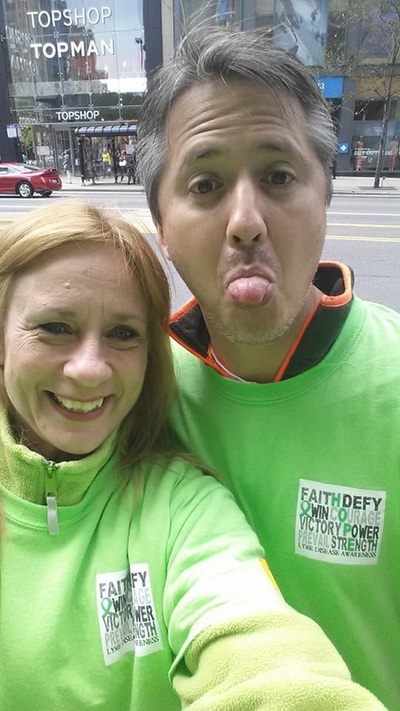 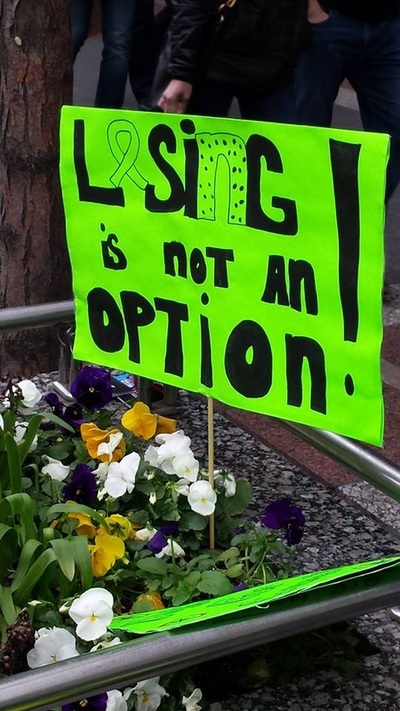 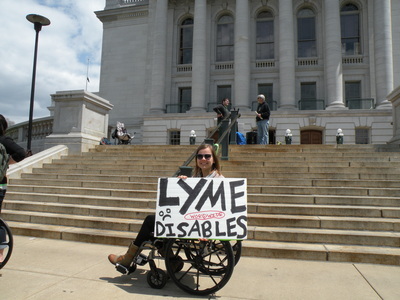 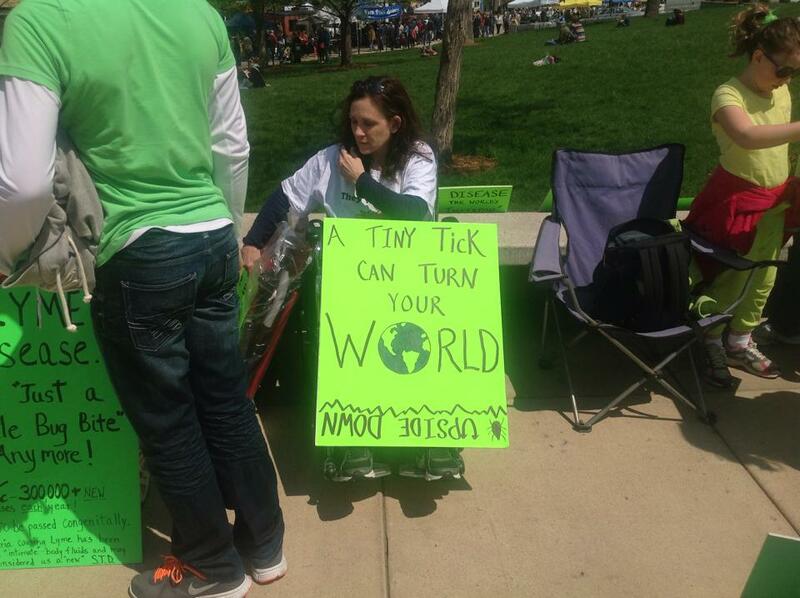 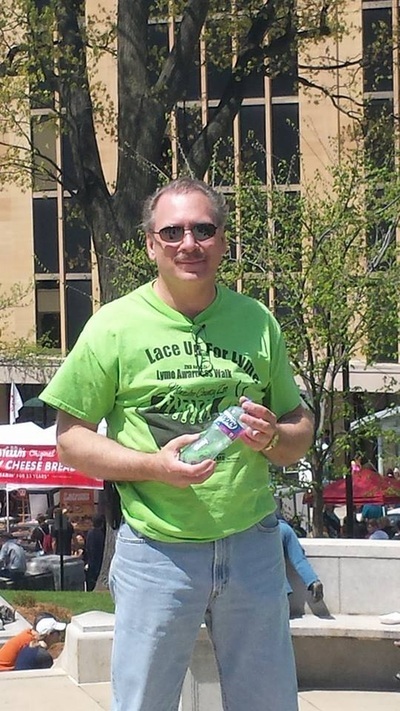 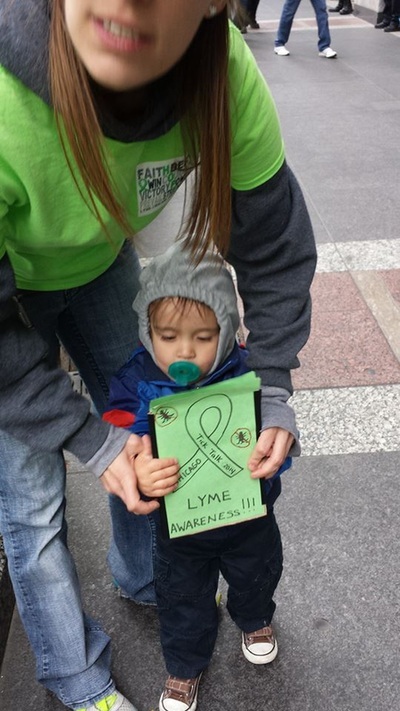 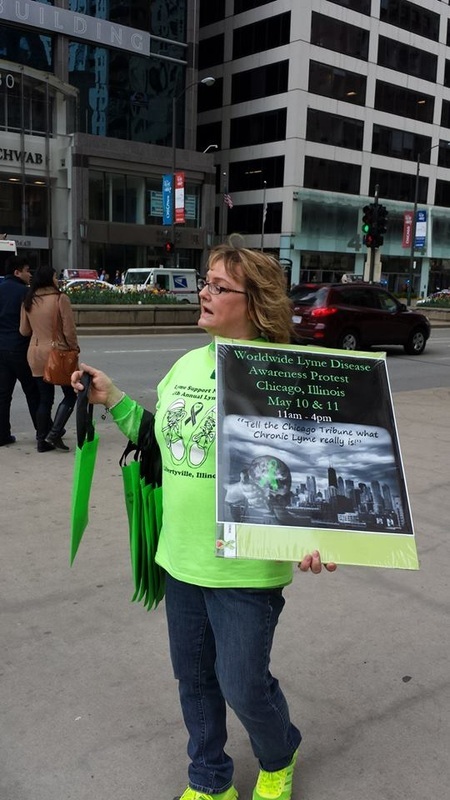 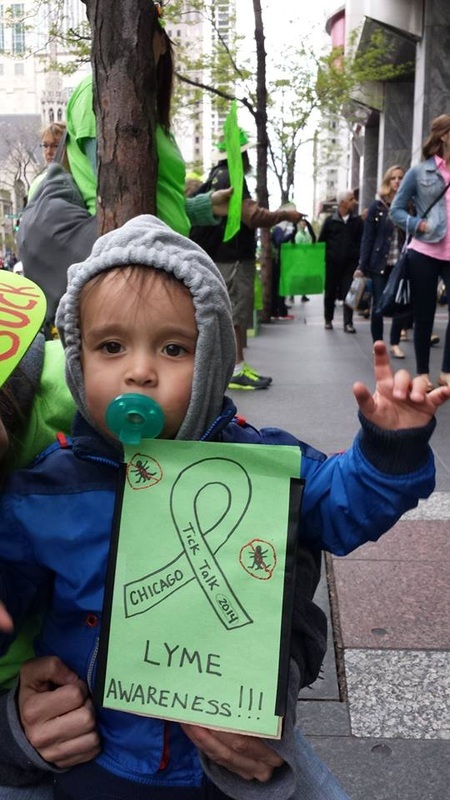 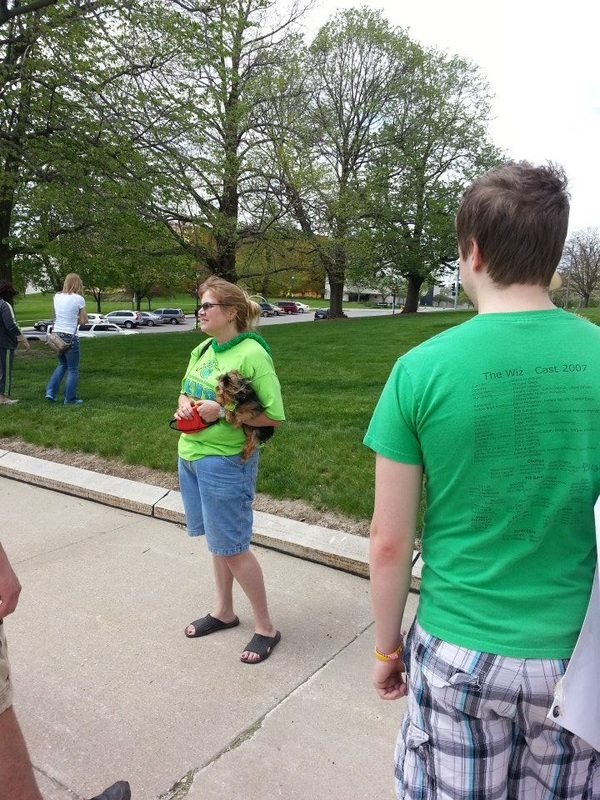 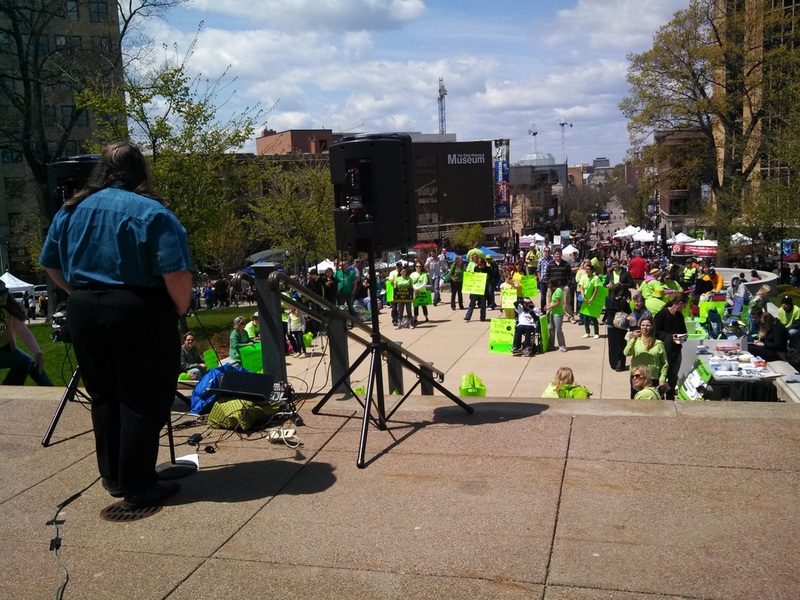 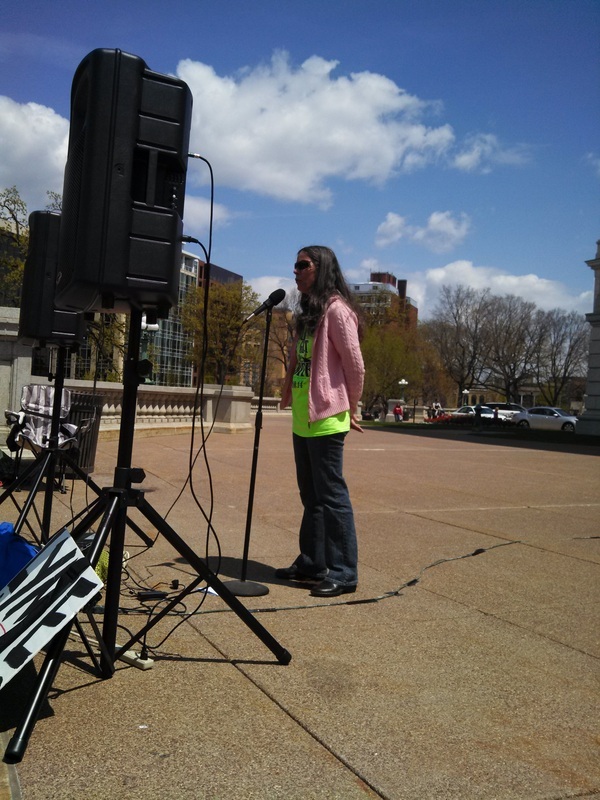 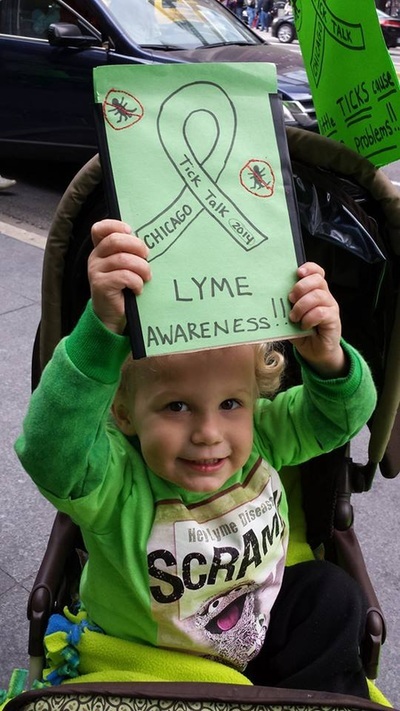 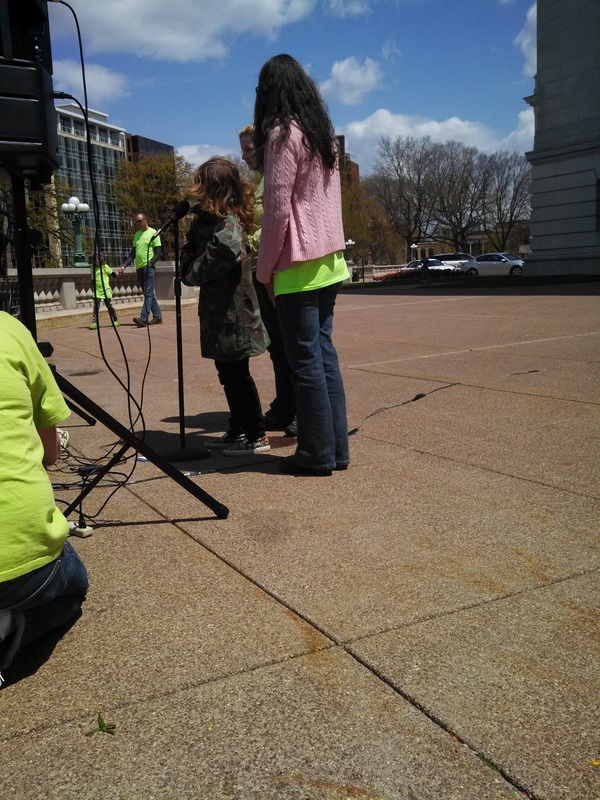 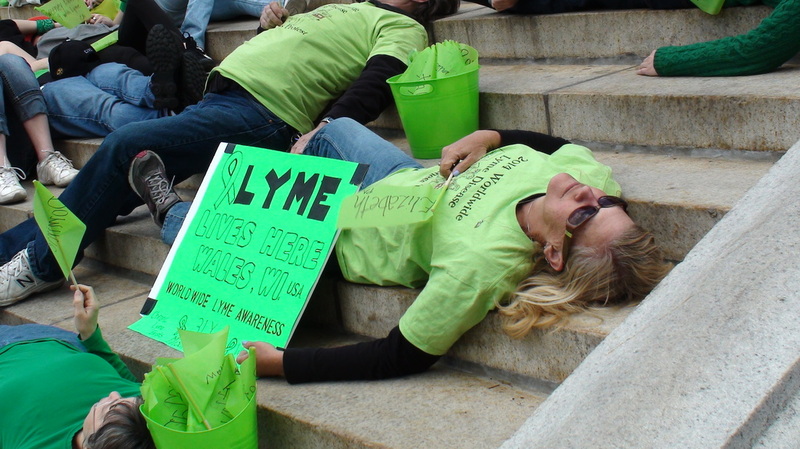 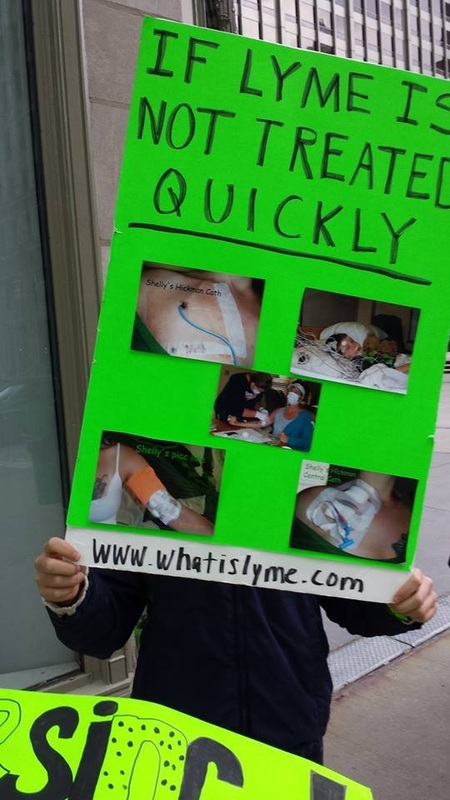 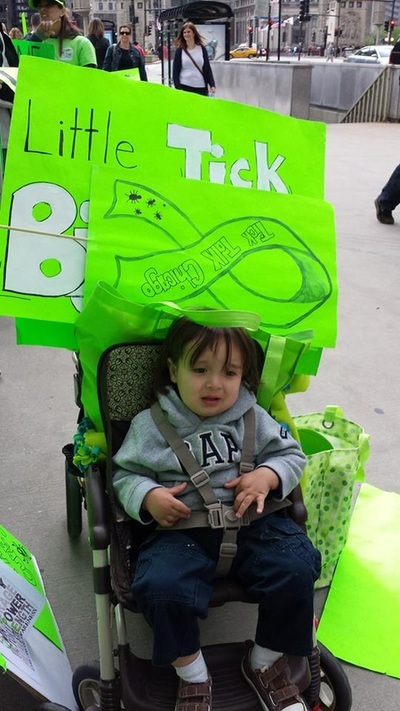 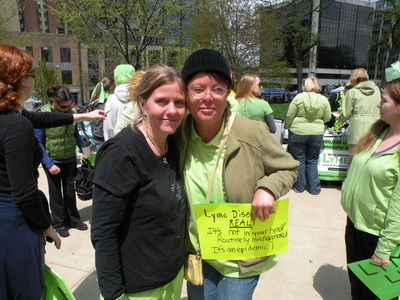 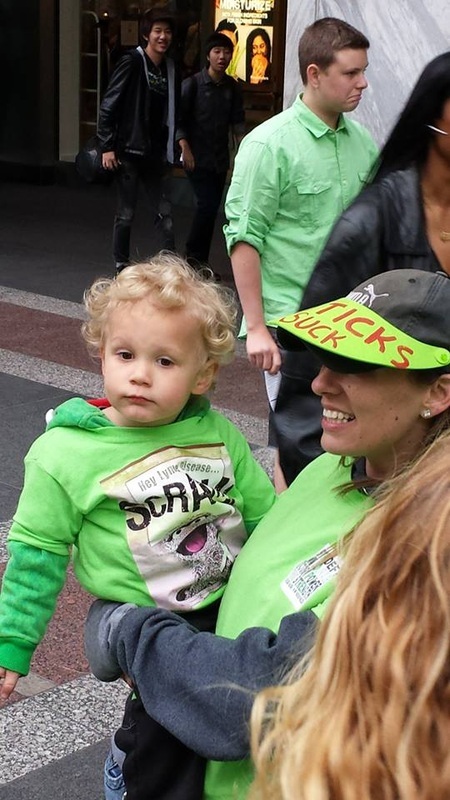 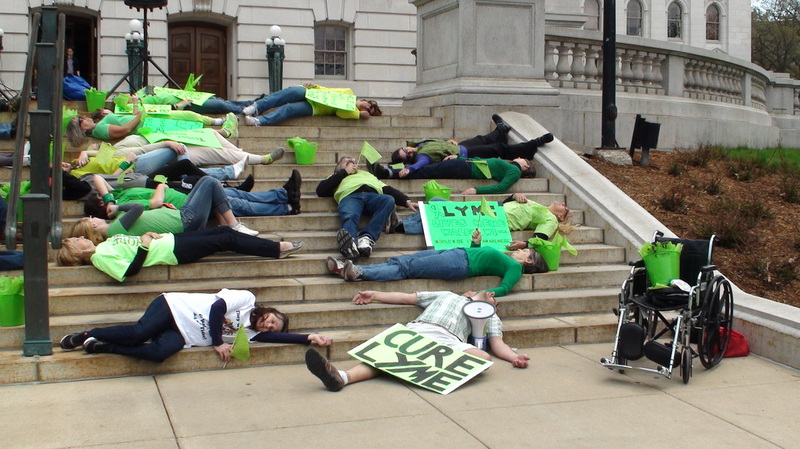 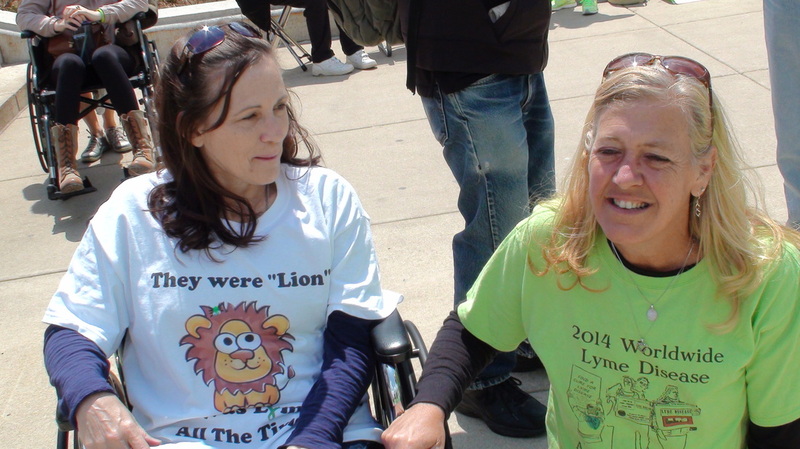 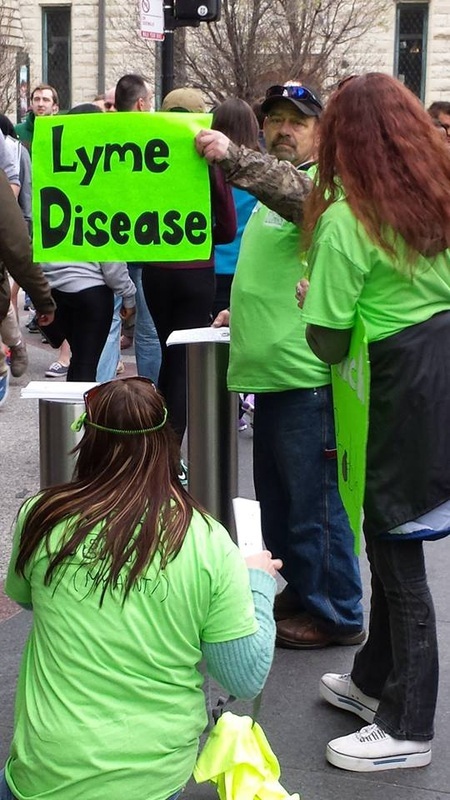 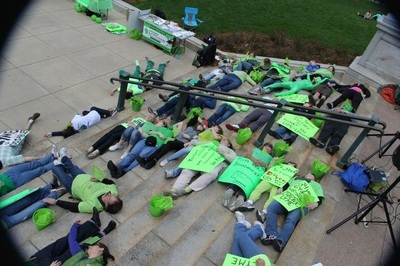 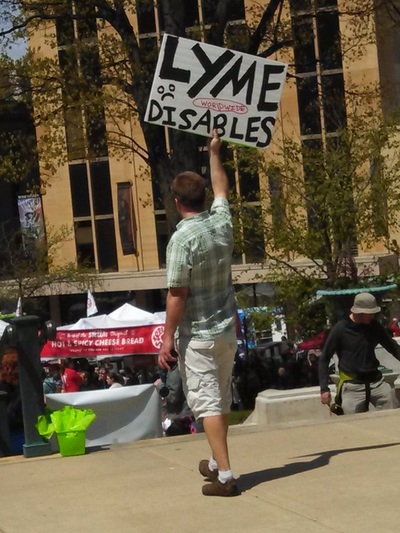 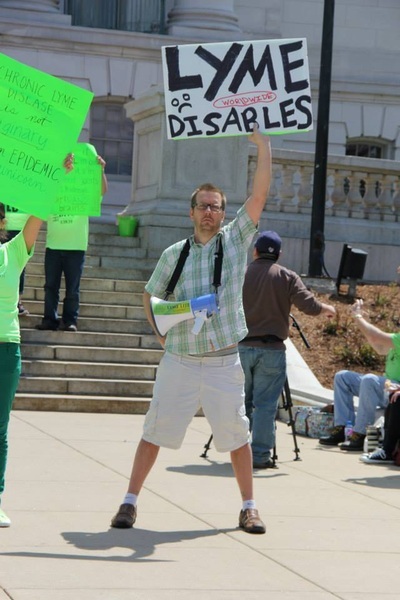 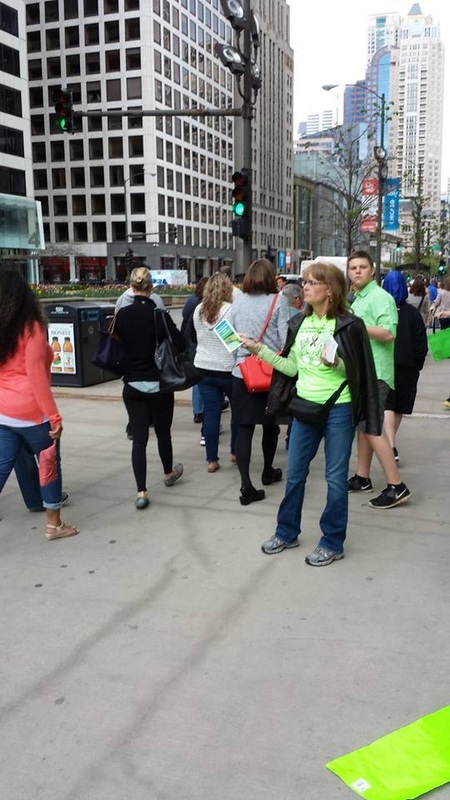 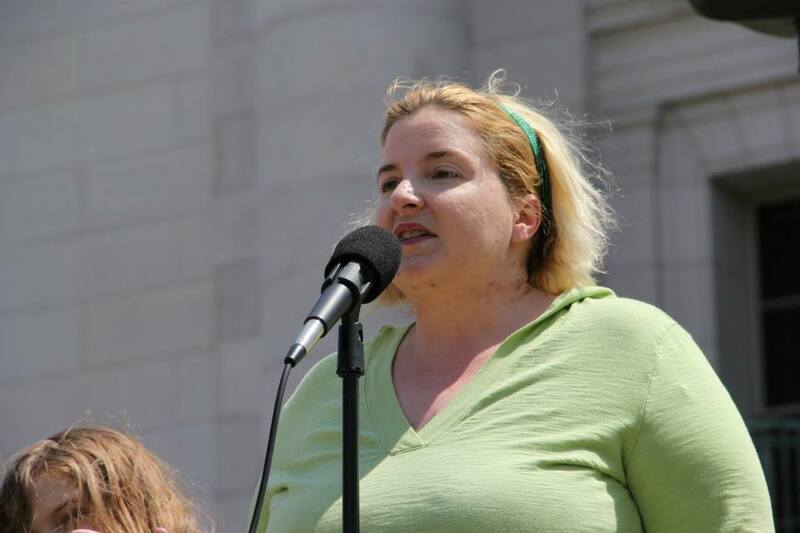 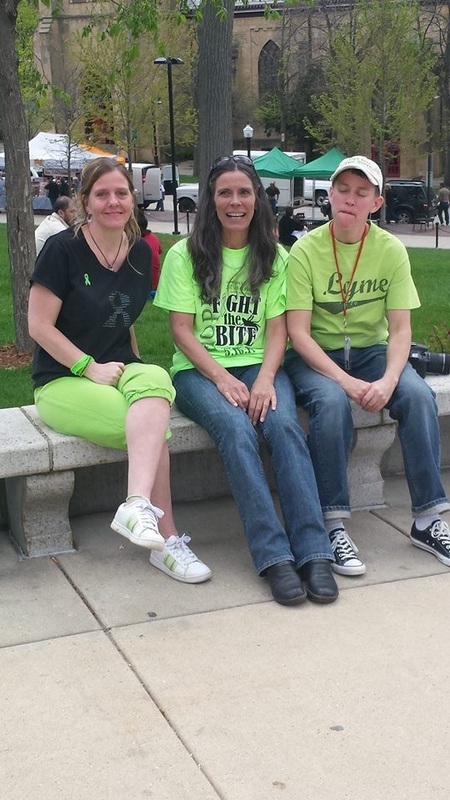 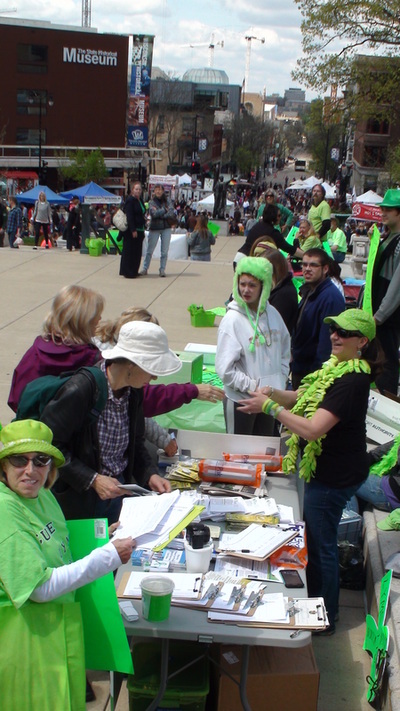 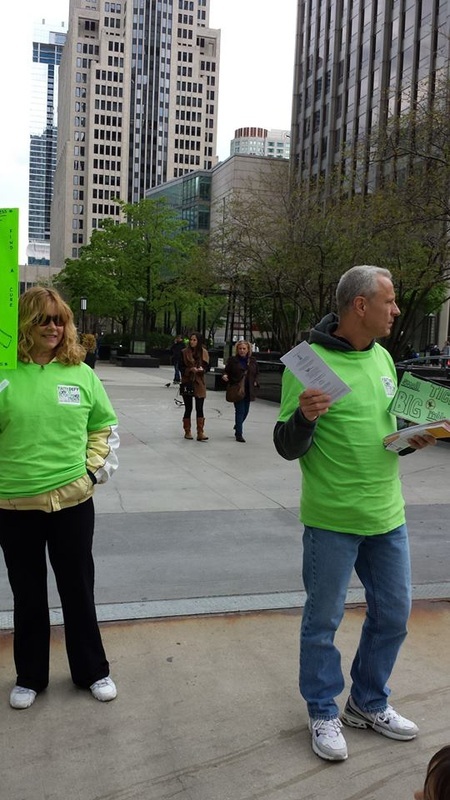 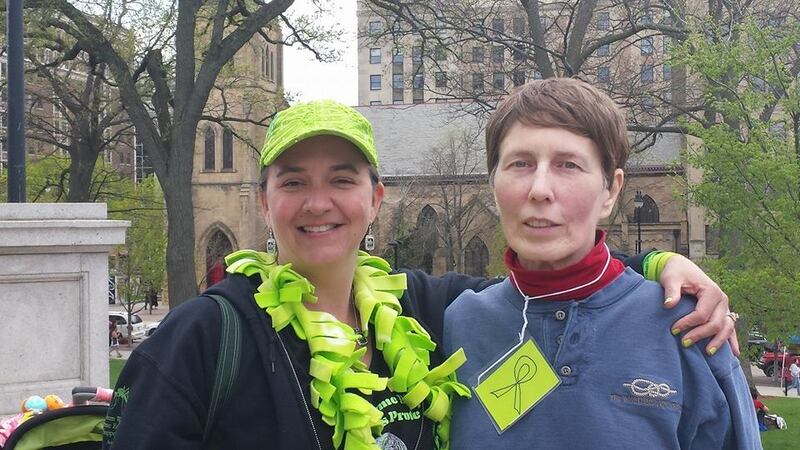 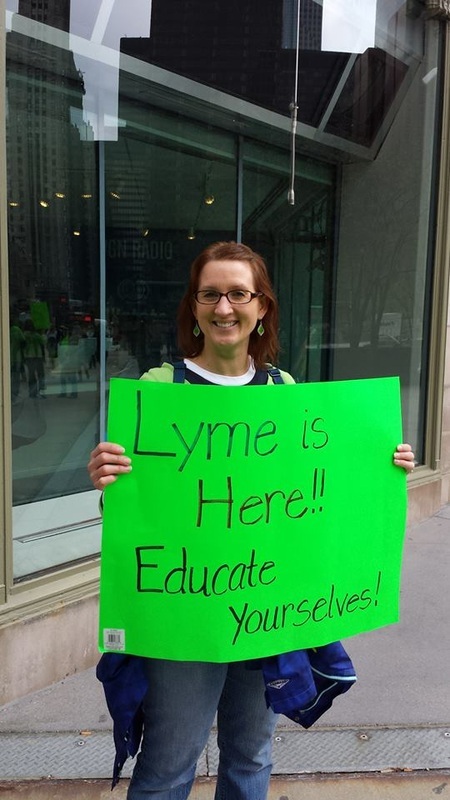 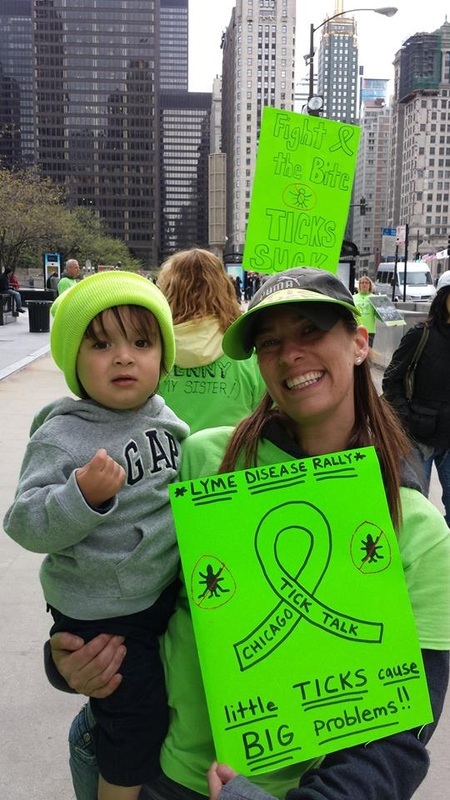 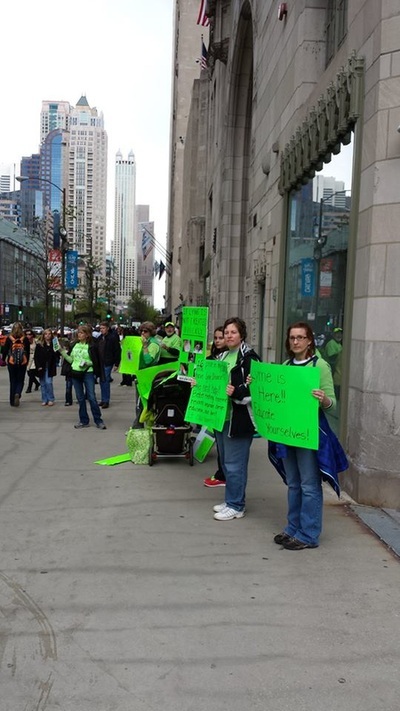 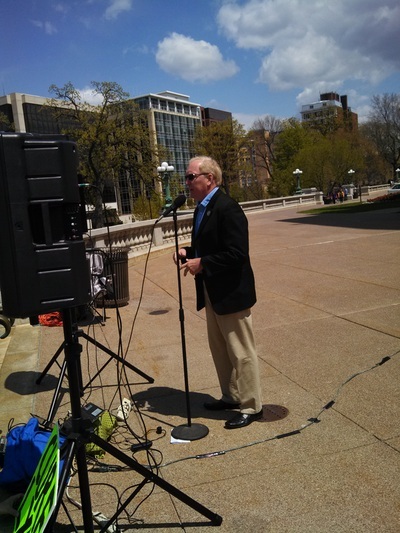 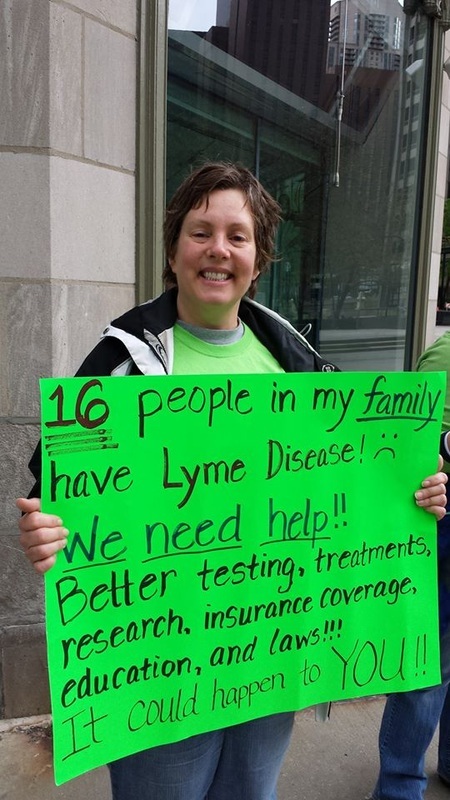 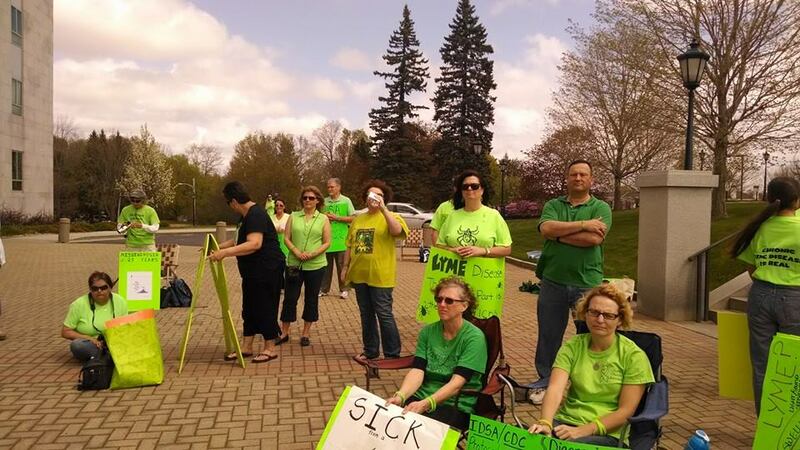 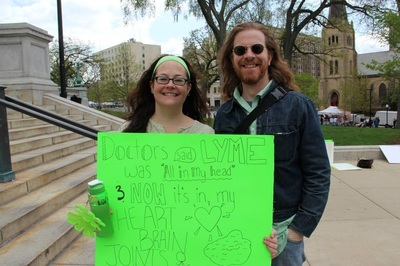 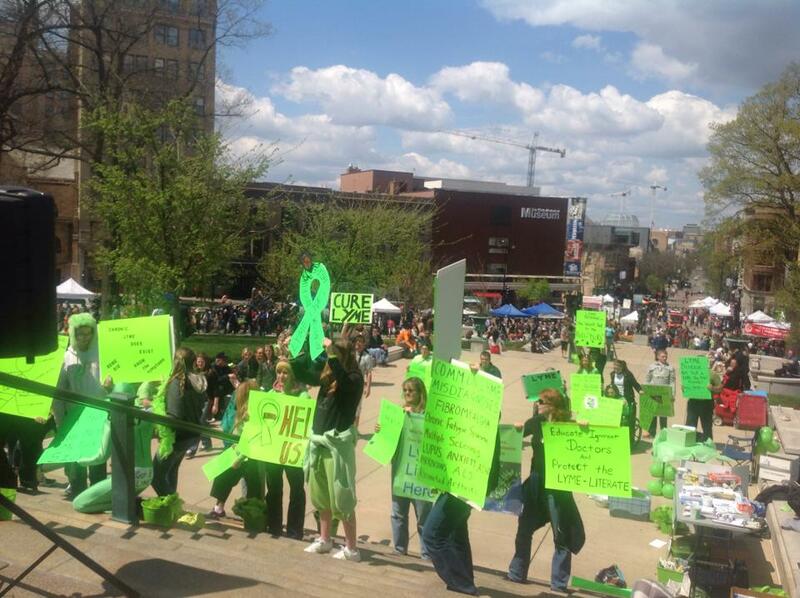 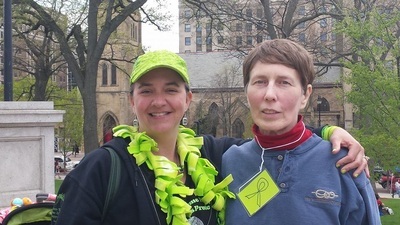 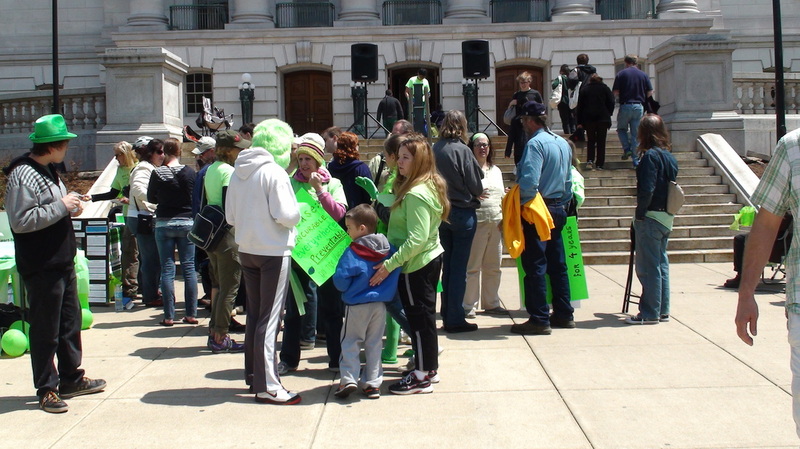 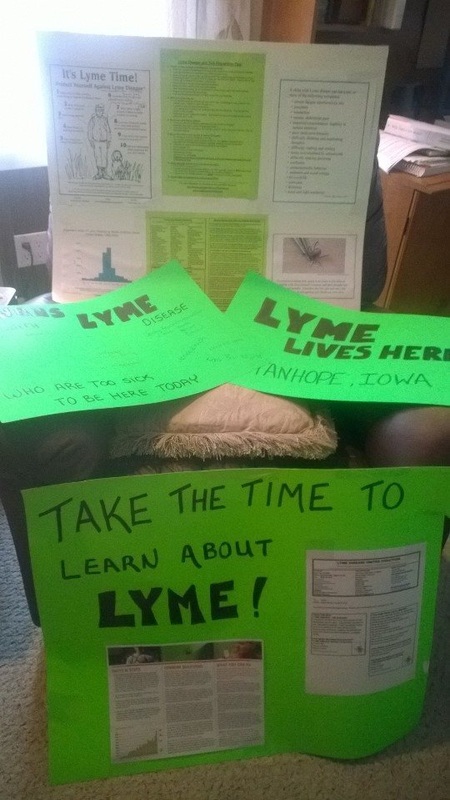 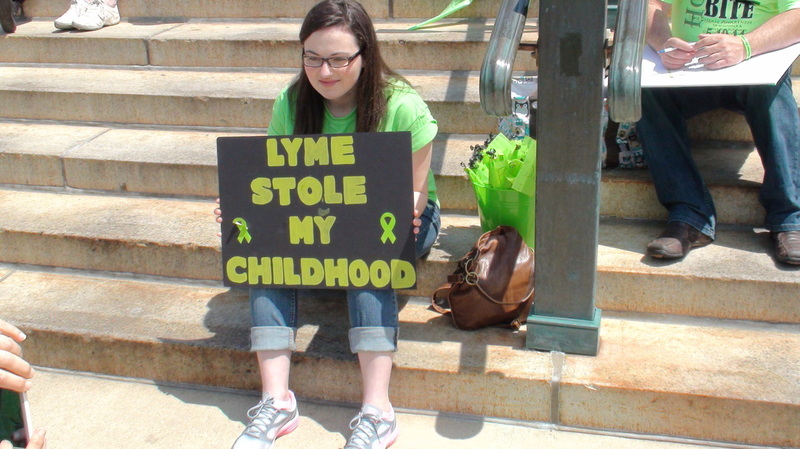 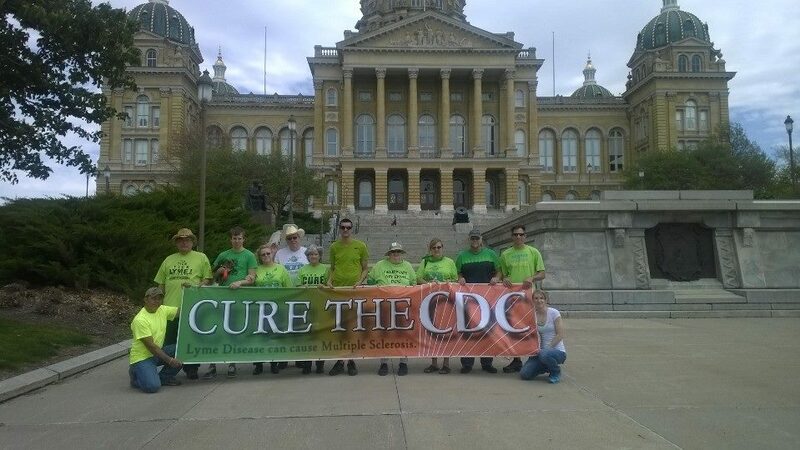 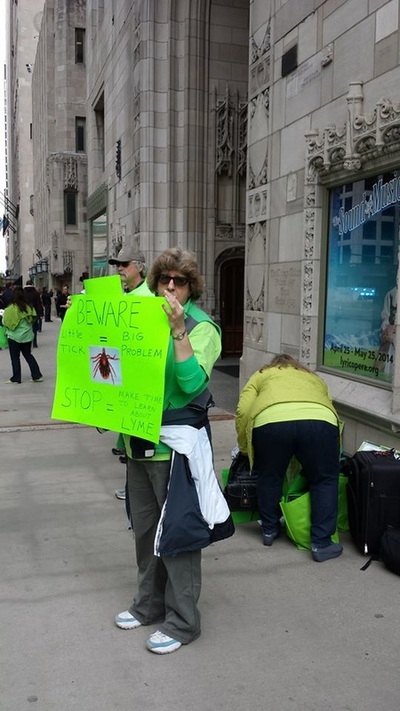 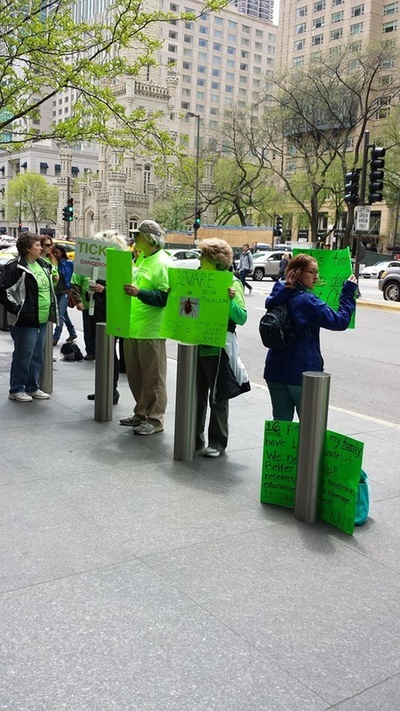 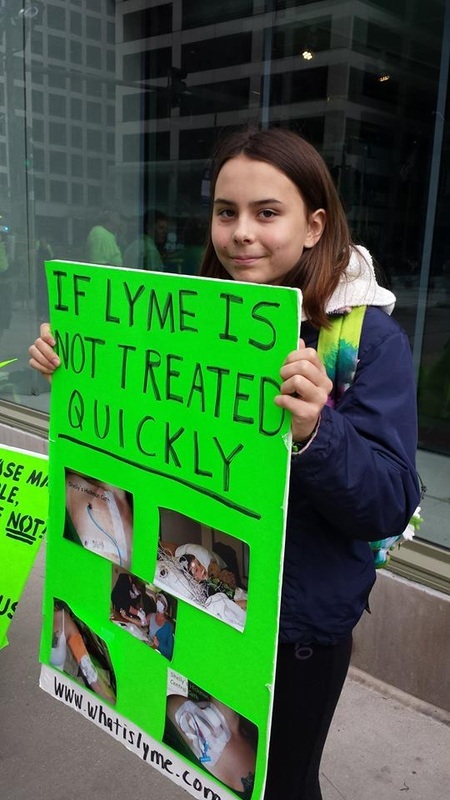 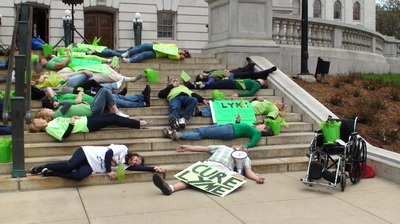 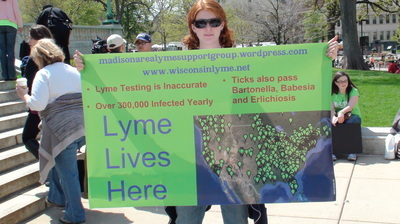 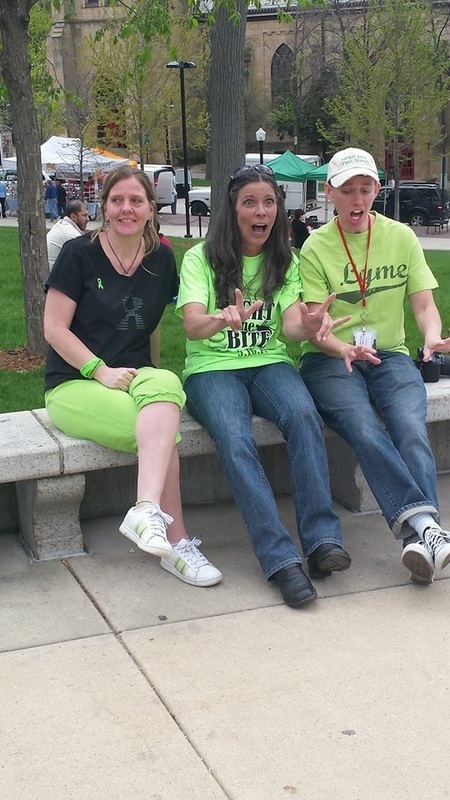 " Thank You All Lyme Warriors, I believe the Chicago Lyme Awareness Protests were a huge success. 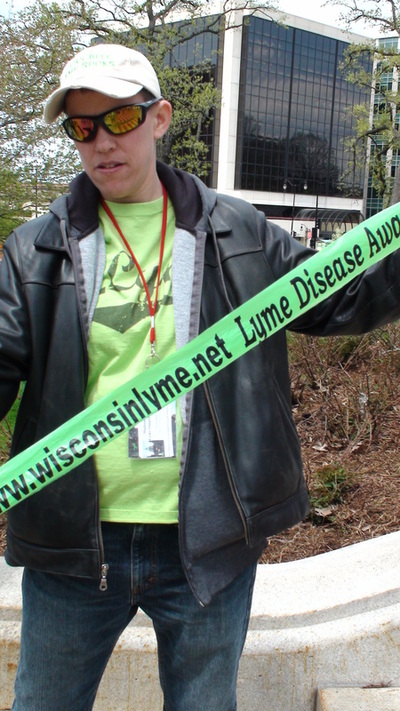 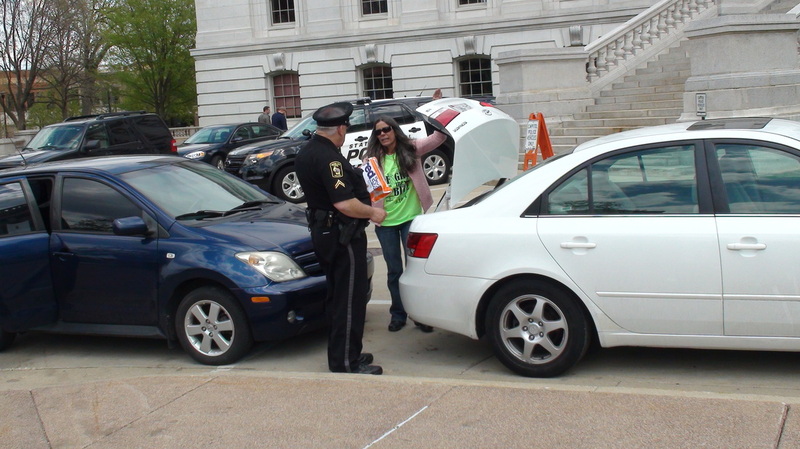 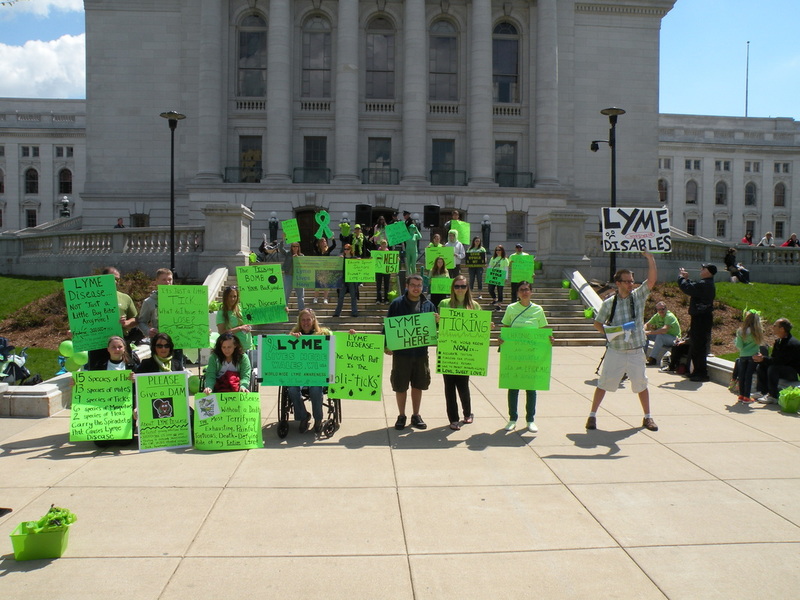 Well over a thousand (close to 1500) bags of Lyme Literature and/or Lyme Awareness pamphlets were disseminated to interested people. 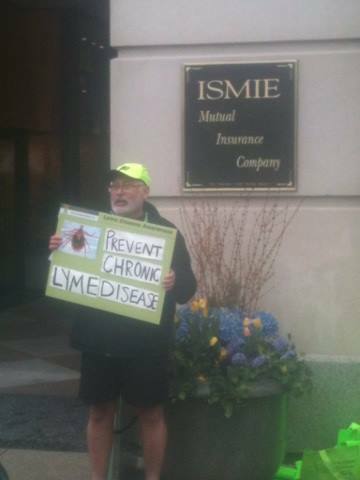 The highlight was our visit to the IL State Medical Society (ISMS) and the obvious threat felt by the medical doctors there. Throughout the protest, first the doorman and then a security guard came by to keep us off their store front property. Finally, the Chief of Security came down demanding to know under what authority we had to be there. 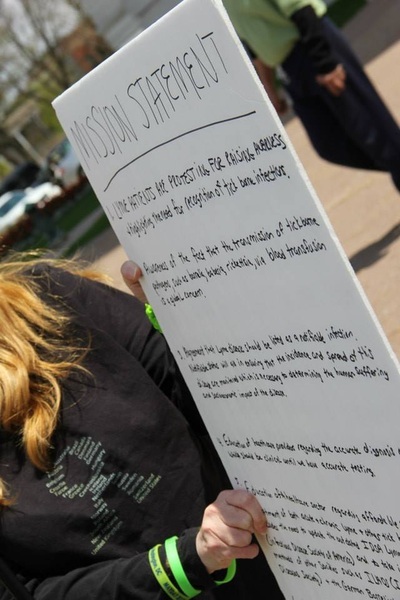 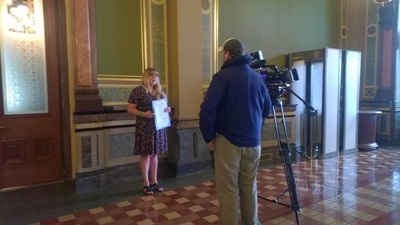 I was able to pull out a letter from the City of Chicago authorizing our public assembly on the streets of Chicago to promote Lyme Disease Awareness. My good friend Dave assured them we would be back again next year! 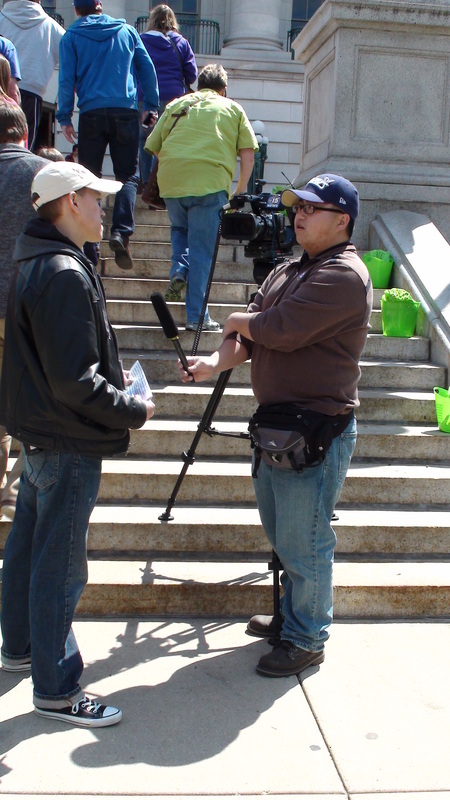 At the Tribune Building a WGN radio reporter came out and talked with Dave at length. 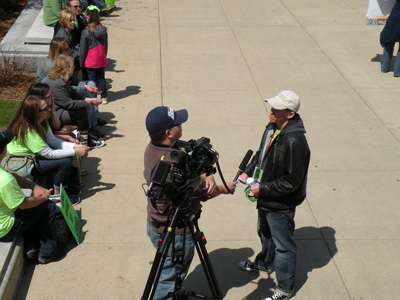 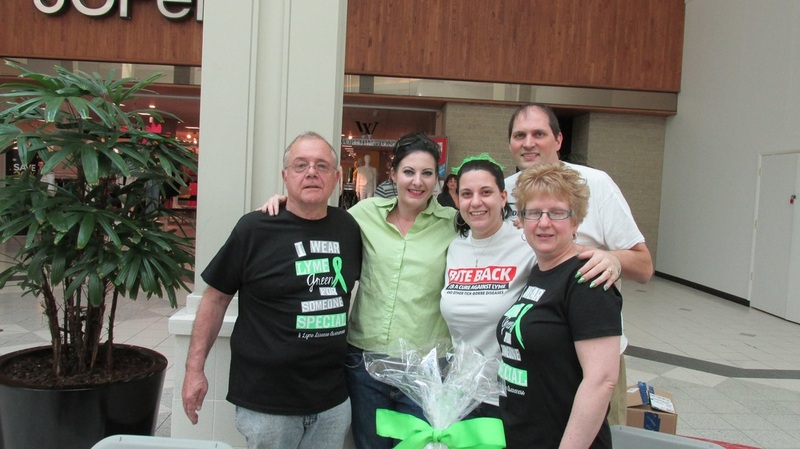 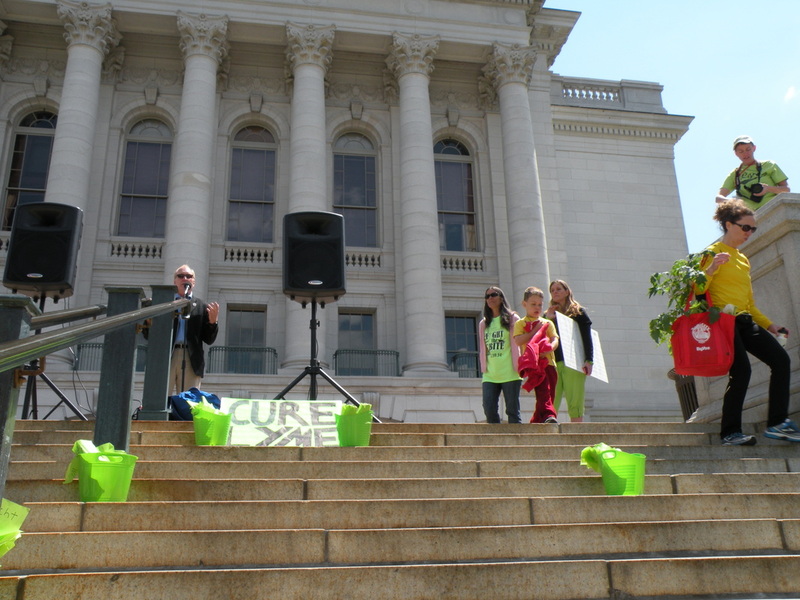 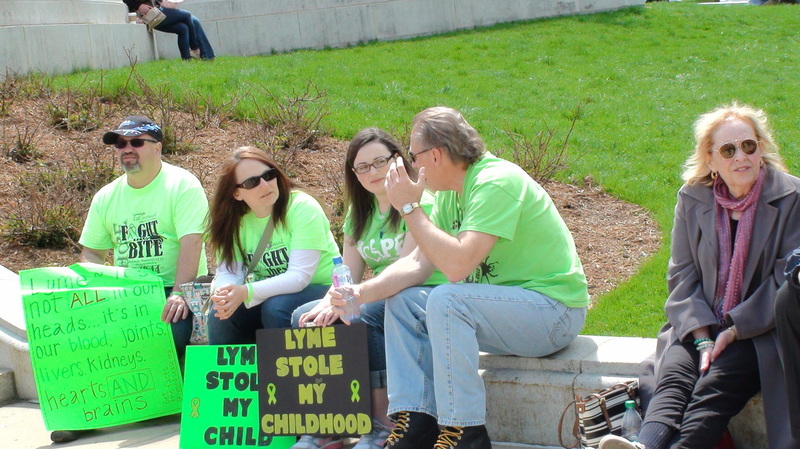 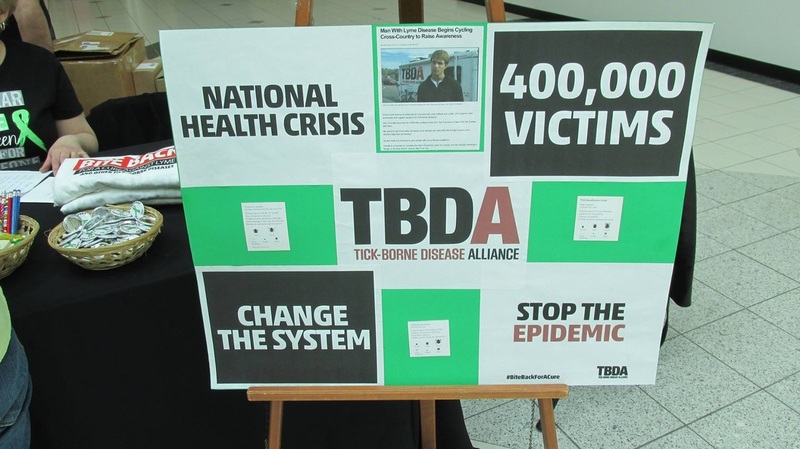 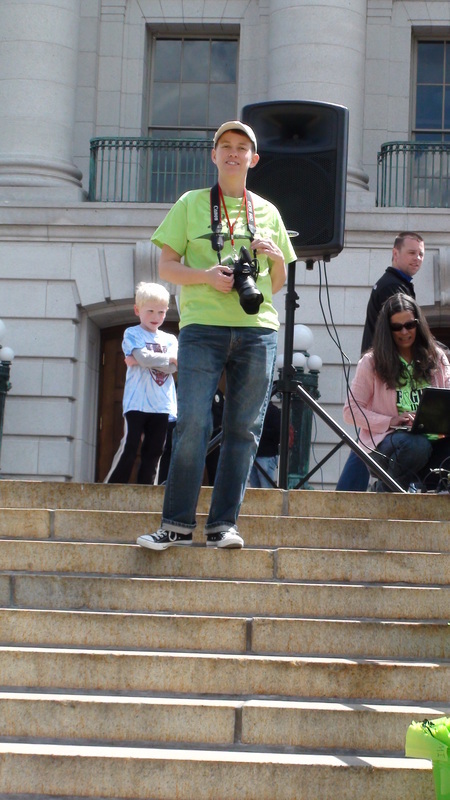 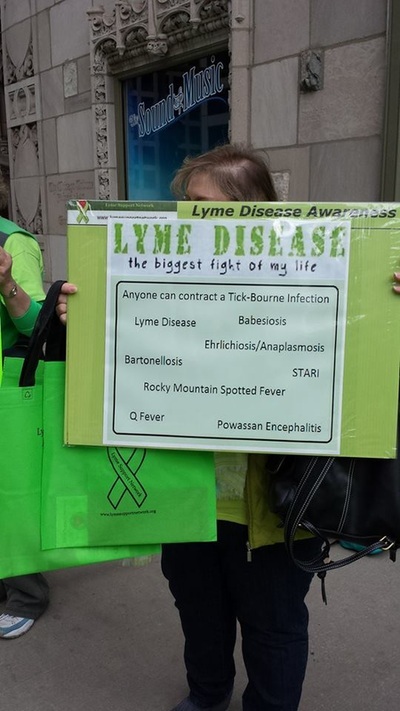 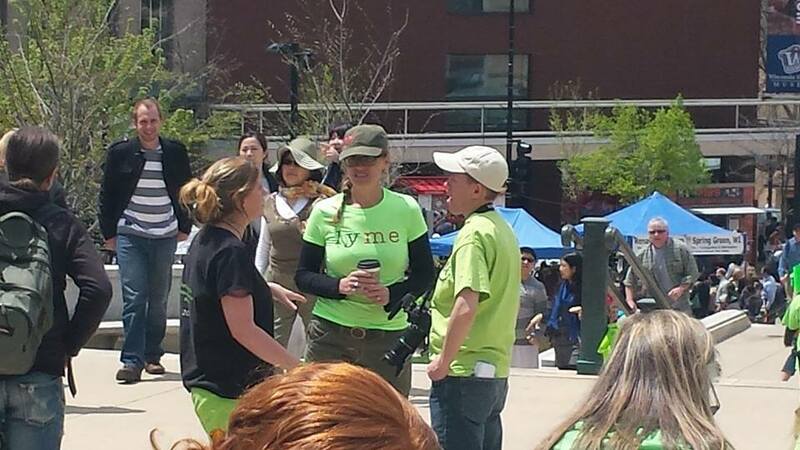 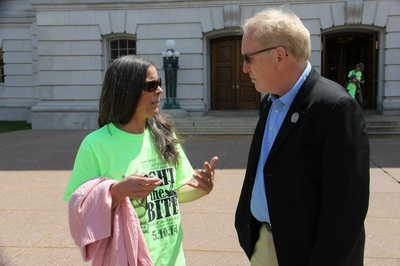 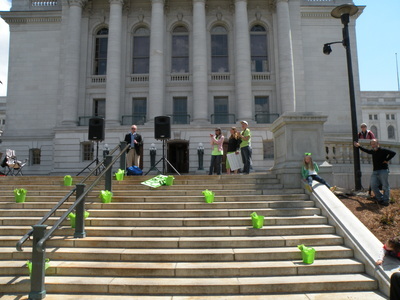 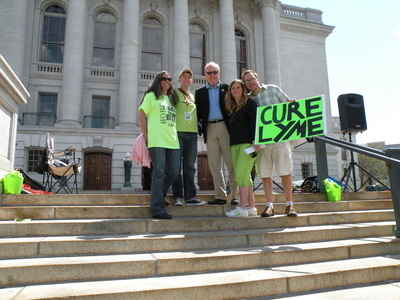 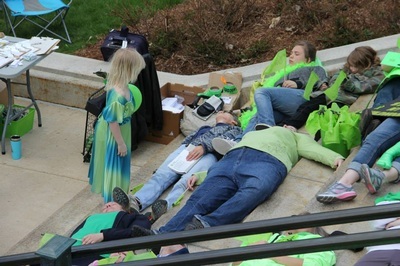 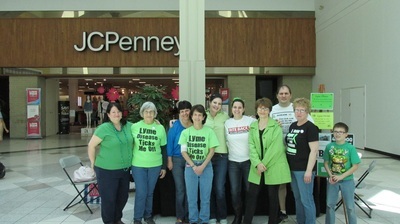 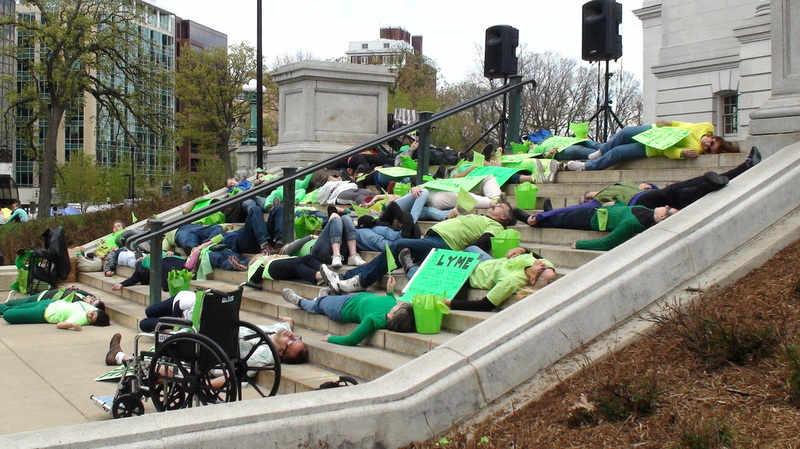 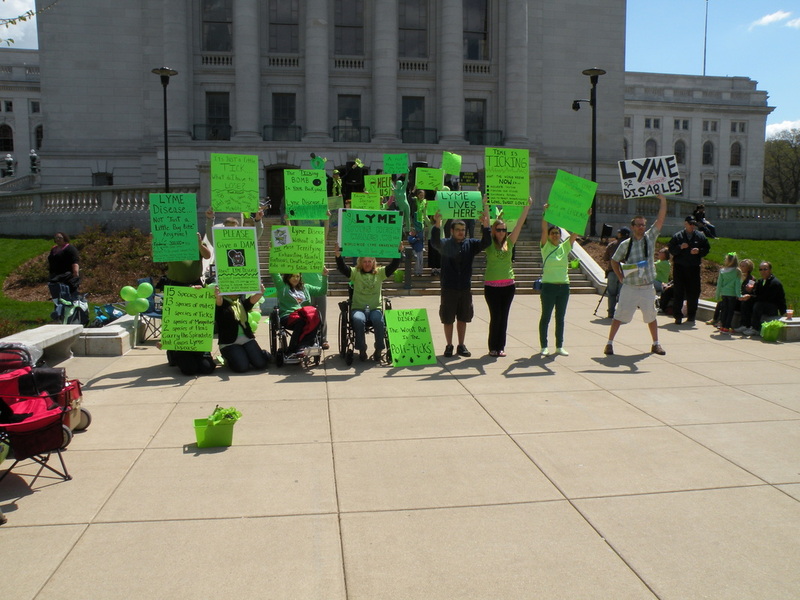 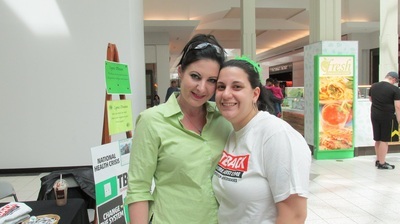 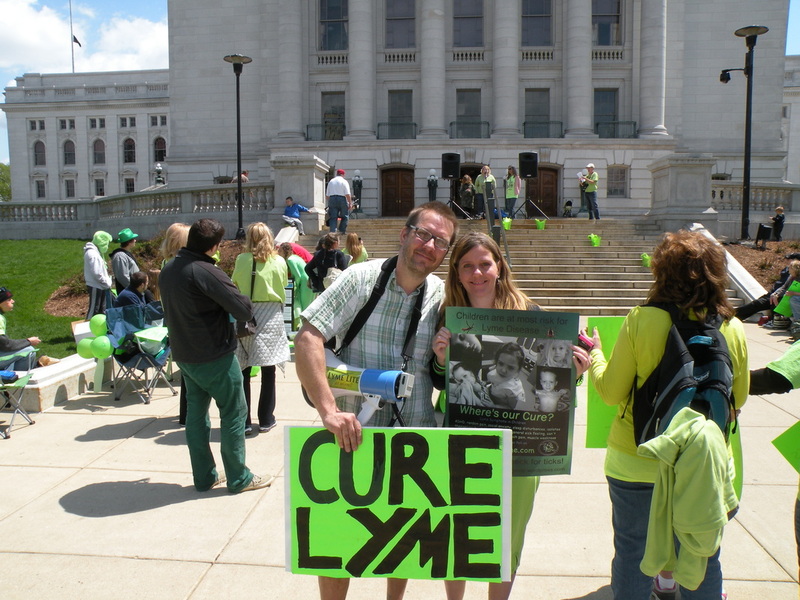 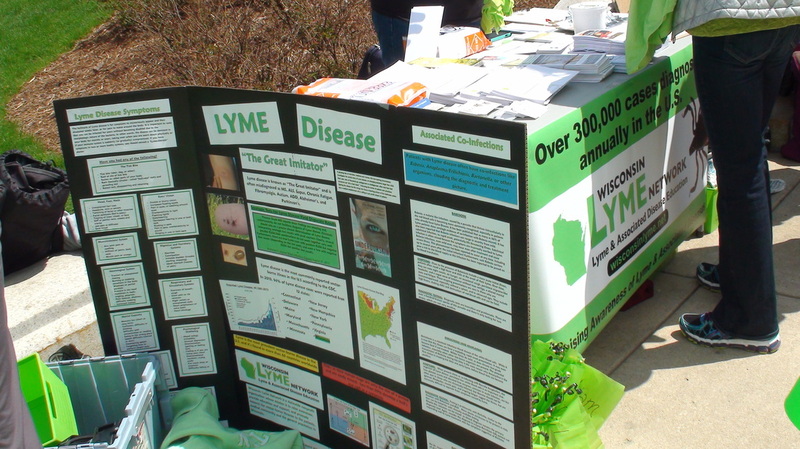 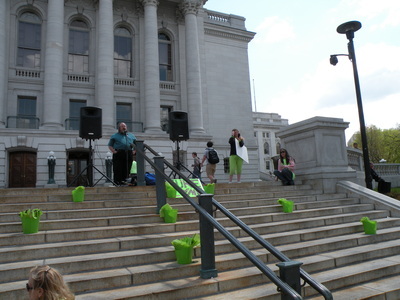 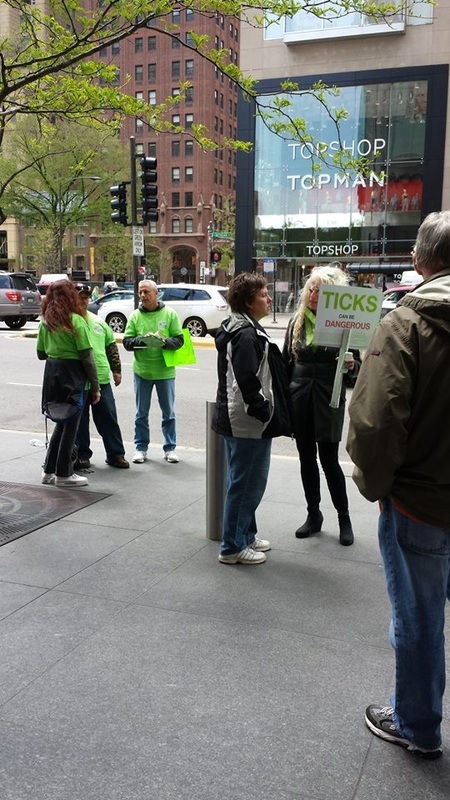 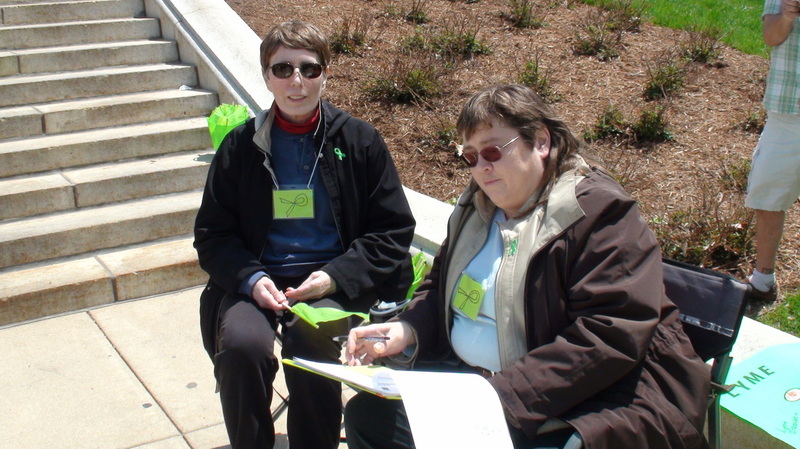 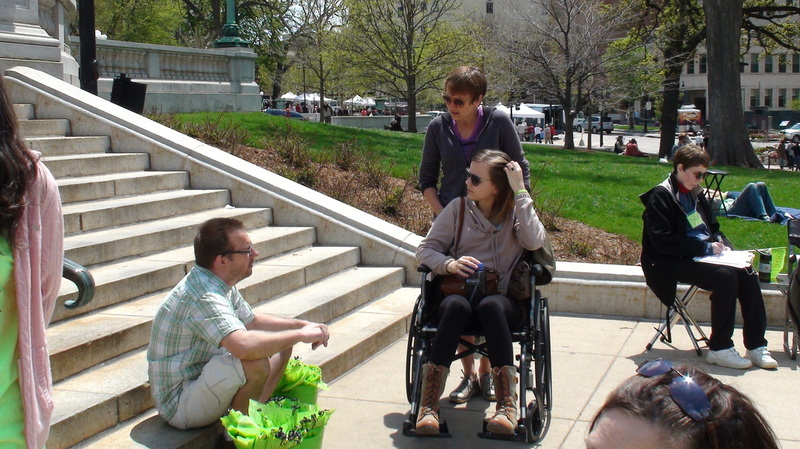 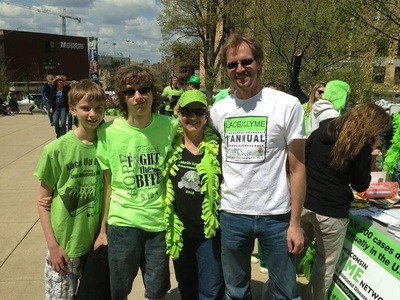 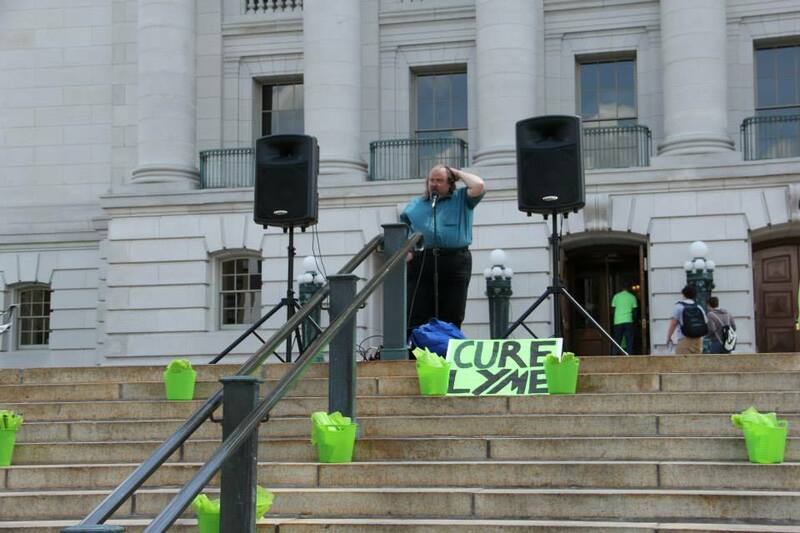 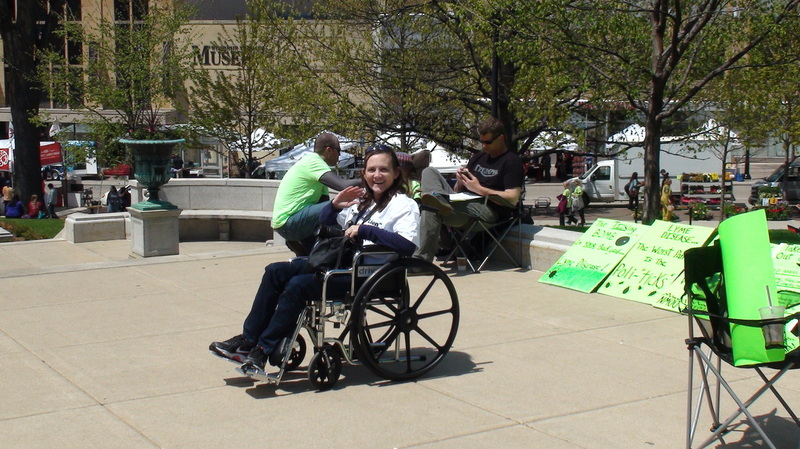 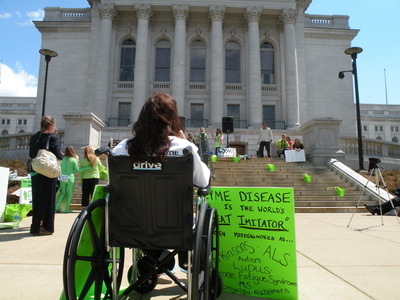 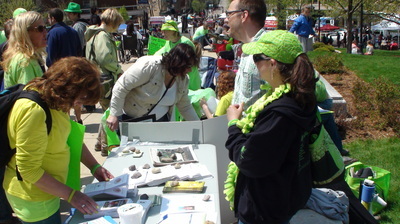 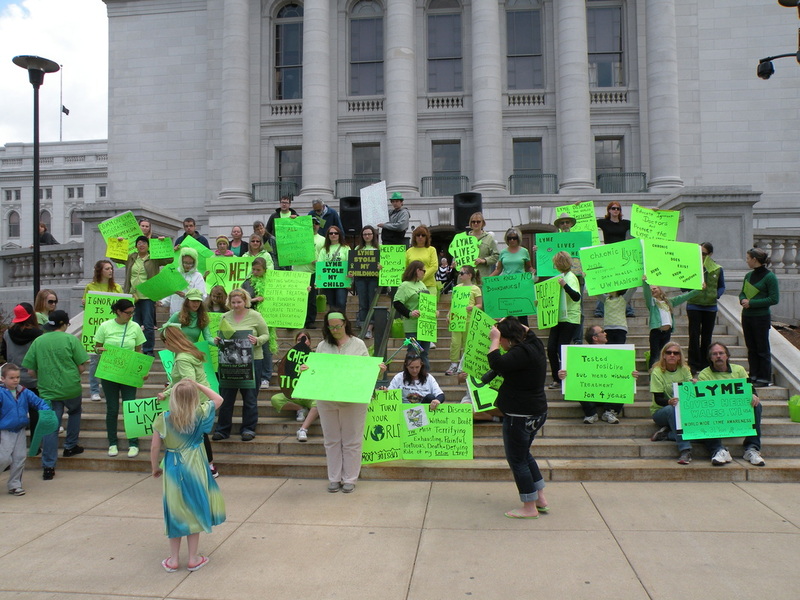 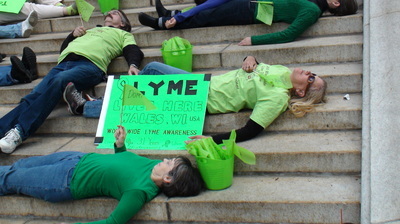 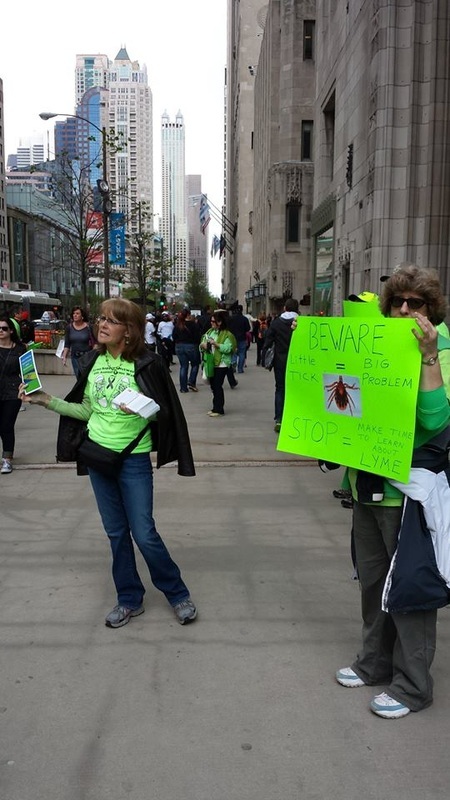 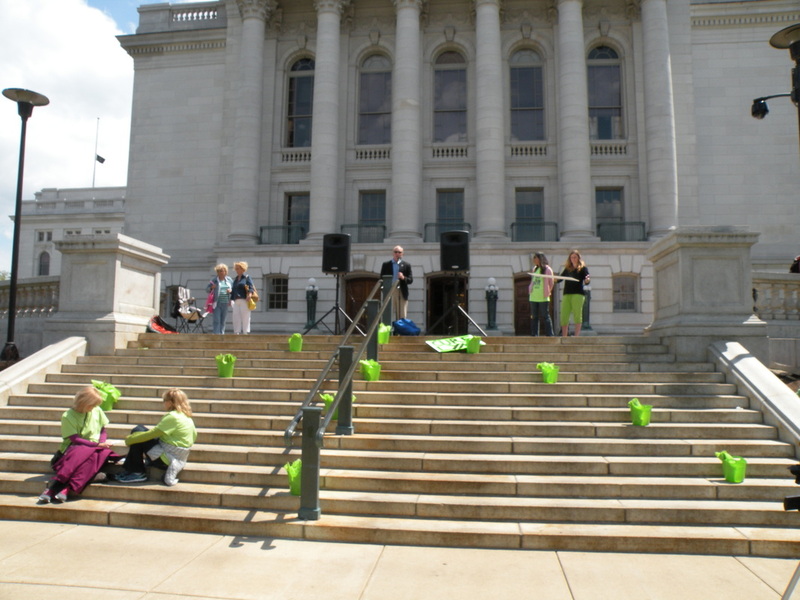 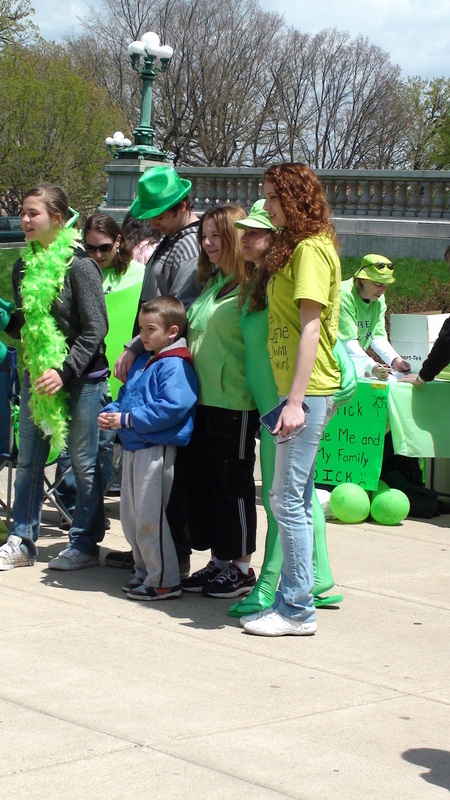 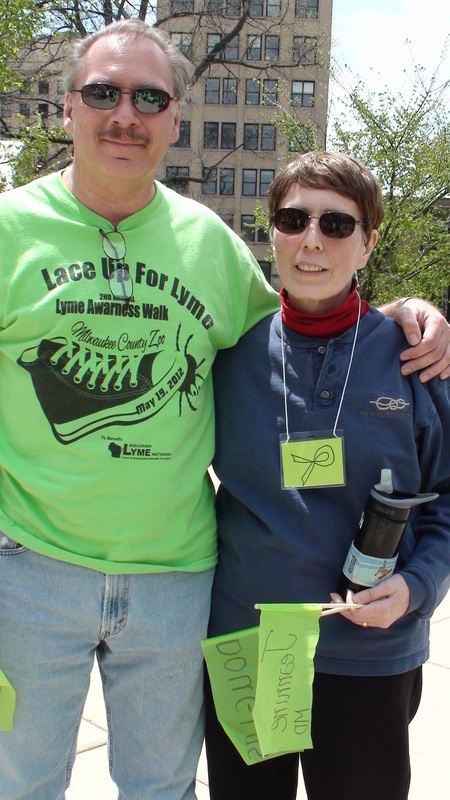 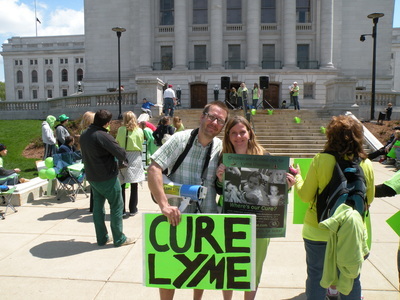 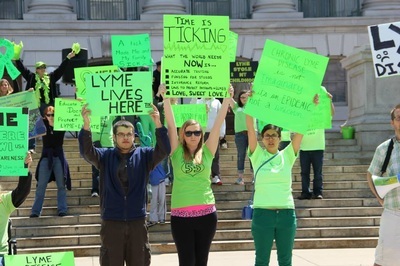 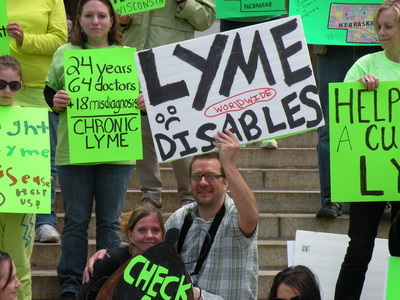 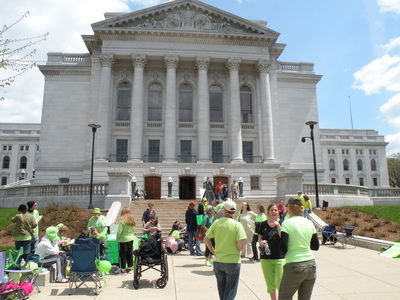 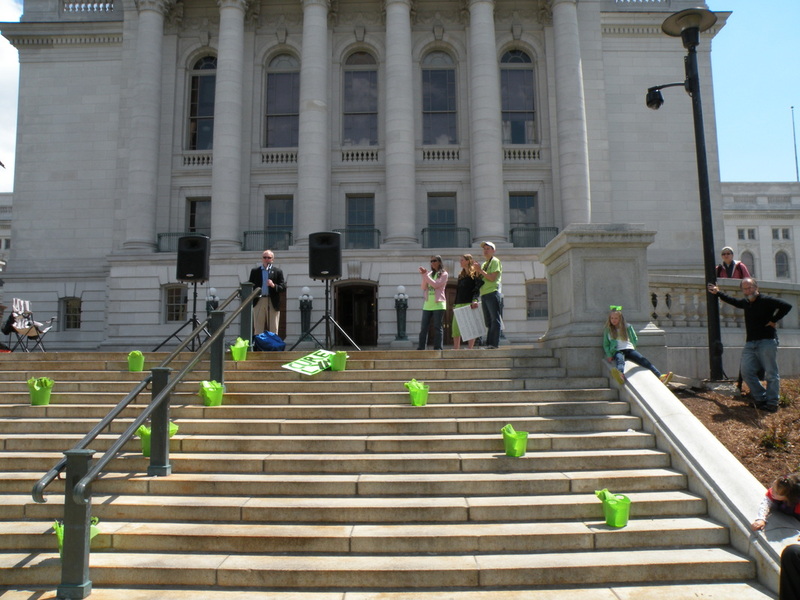 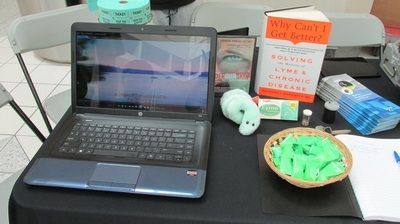 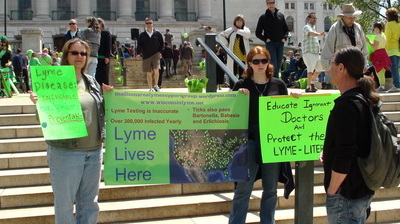 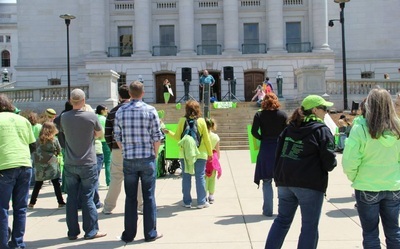 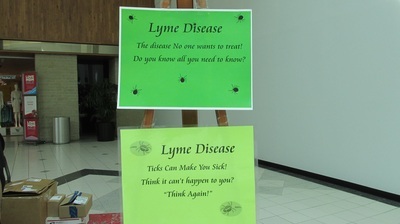 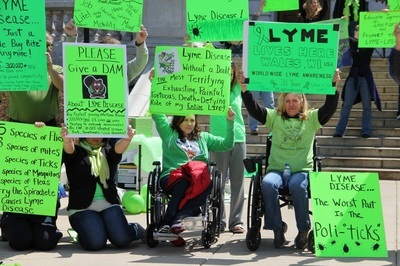 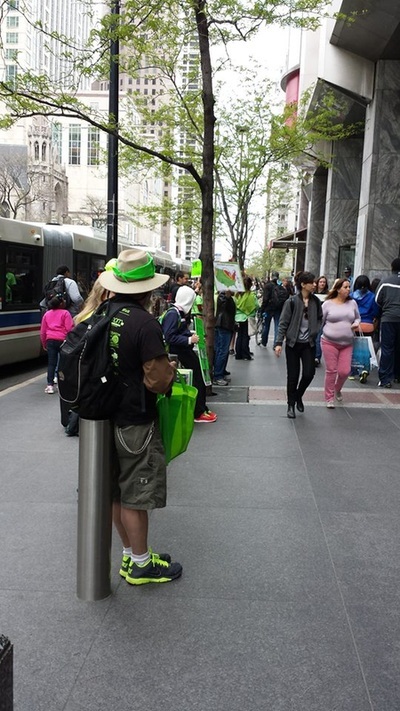 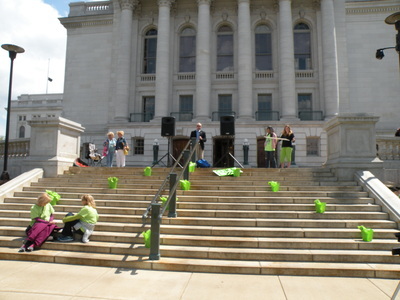 At Water Tower Place, thousands of people became aware of our fight for Lyme awareness prevention and proper treatment. 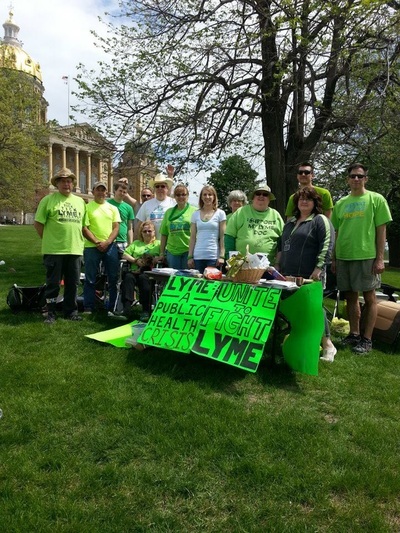 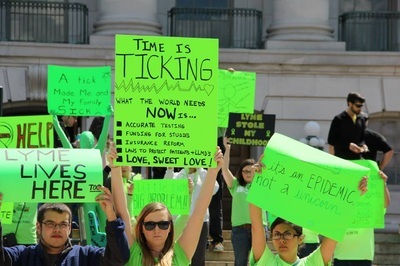 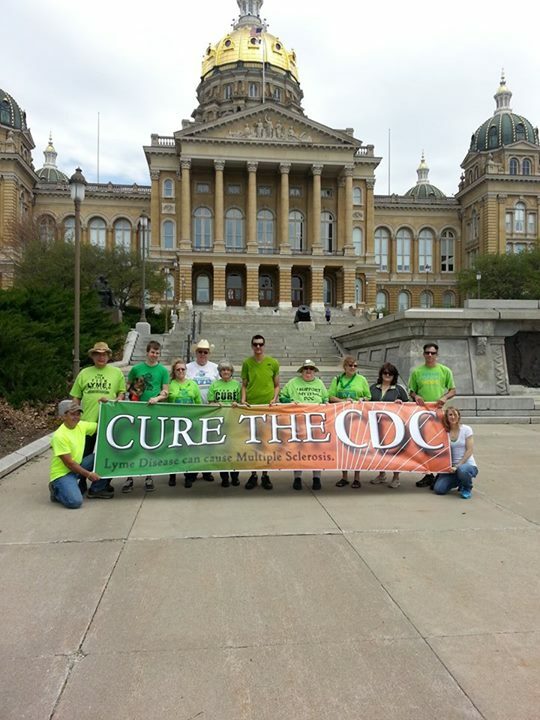 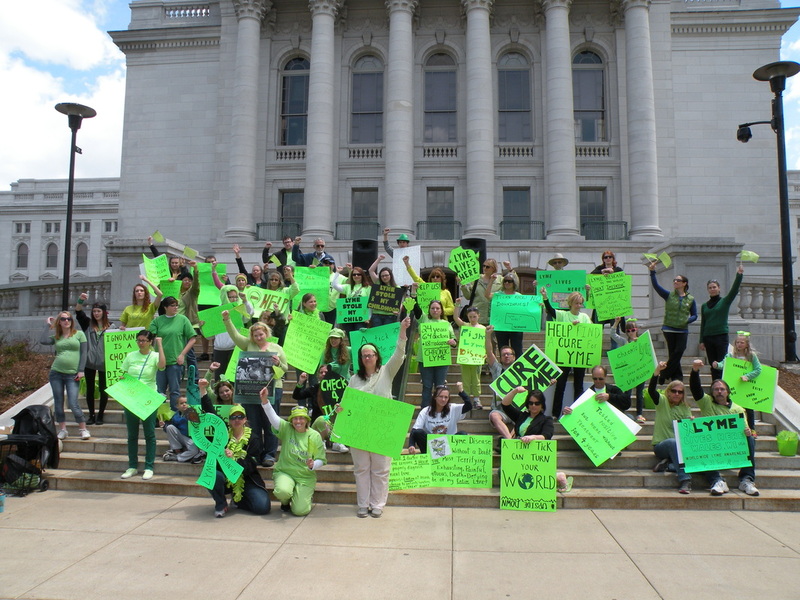 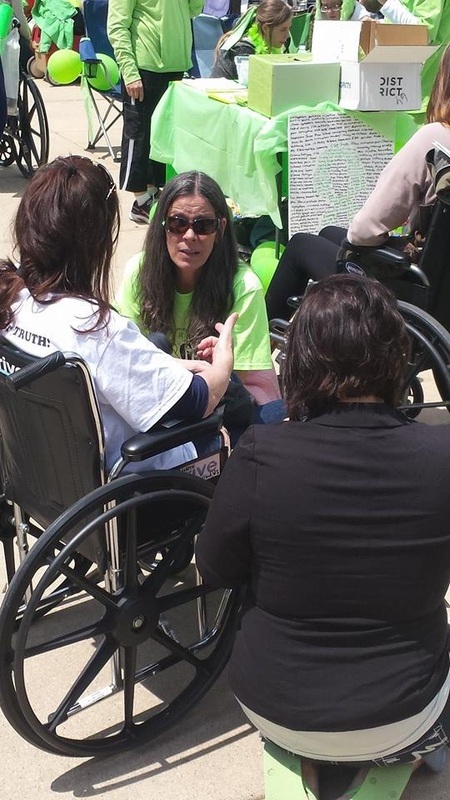 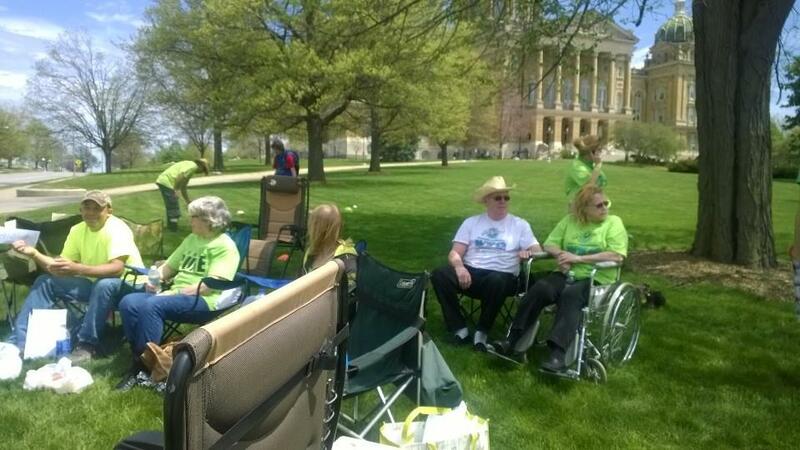 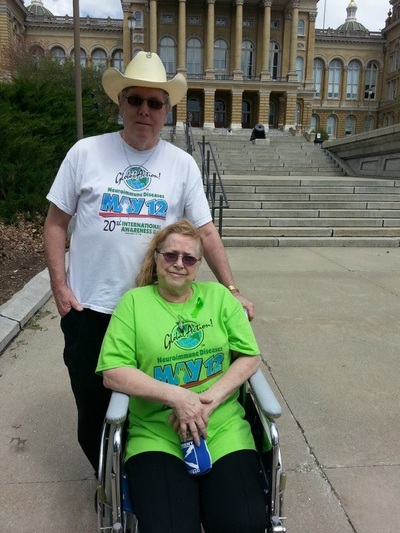 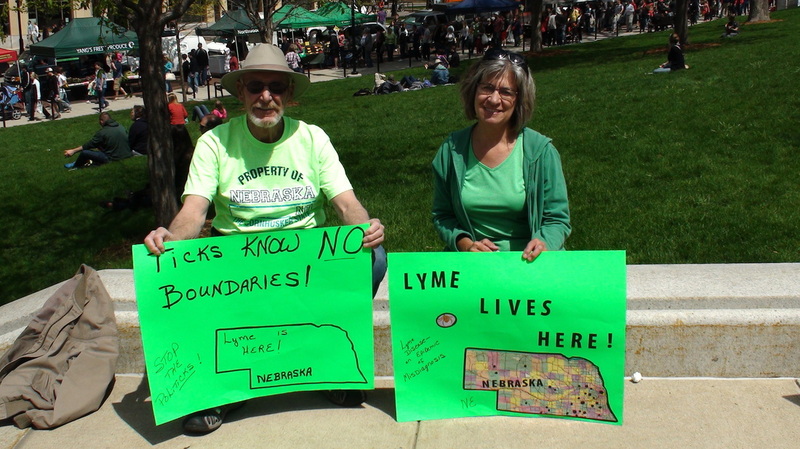 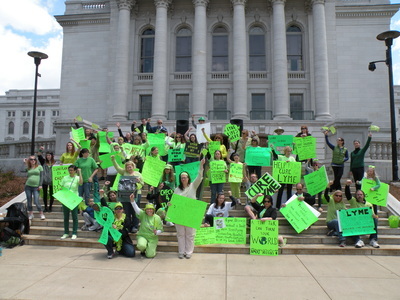 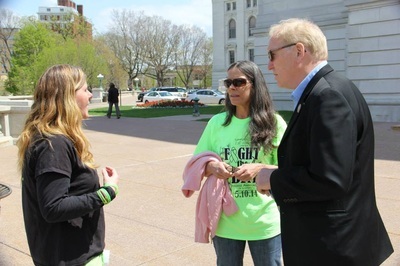 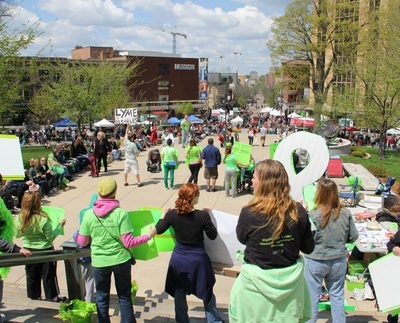 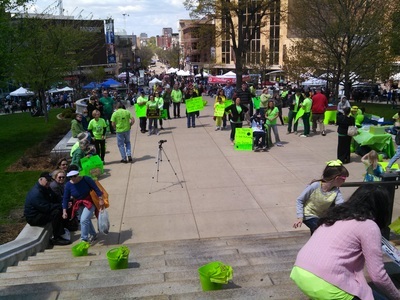 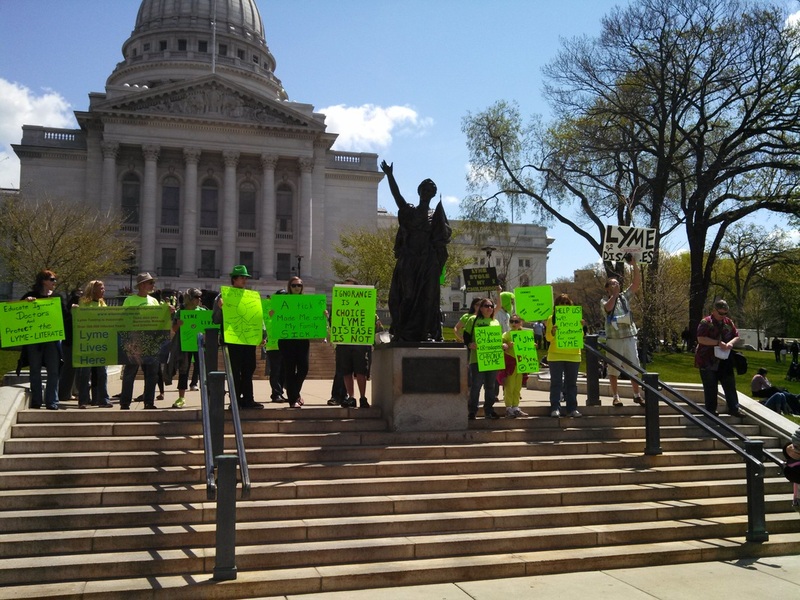 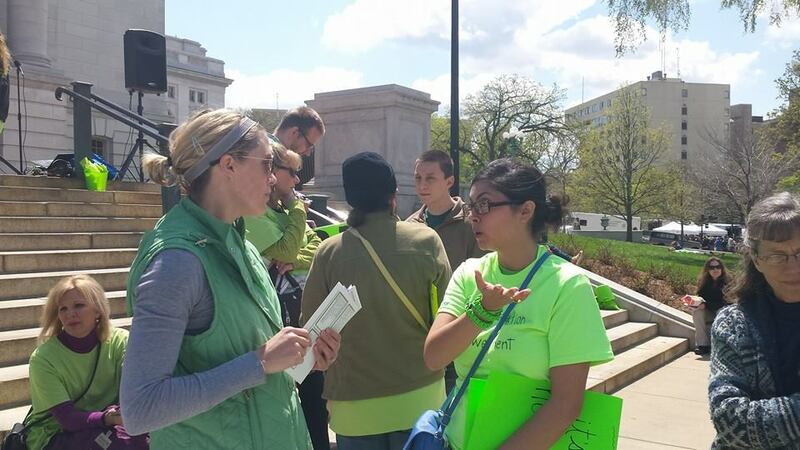 And again the fantastic and enthusiastic effort by Lyme warriors from Illinois and Indiana brought up to date and accurate information on Lyme Disease prevention to literally hundreds of people. 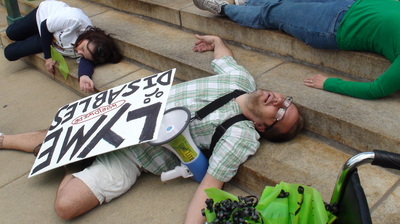 Hoo...ah!!!" 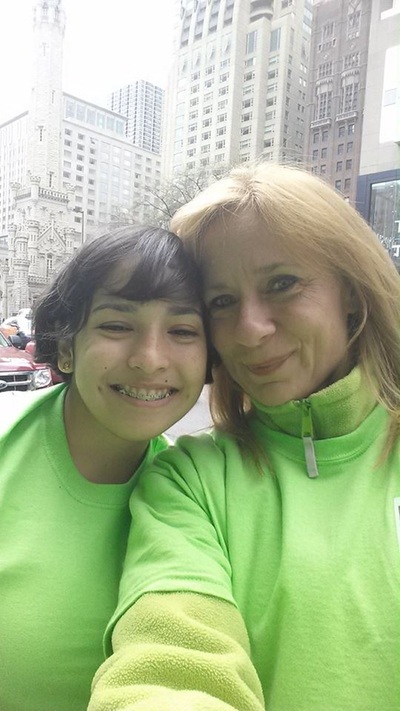 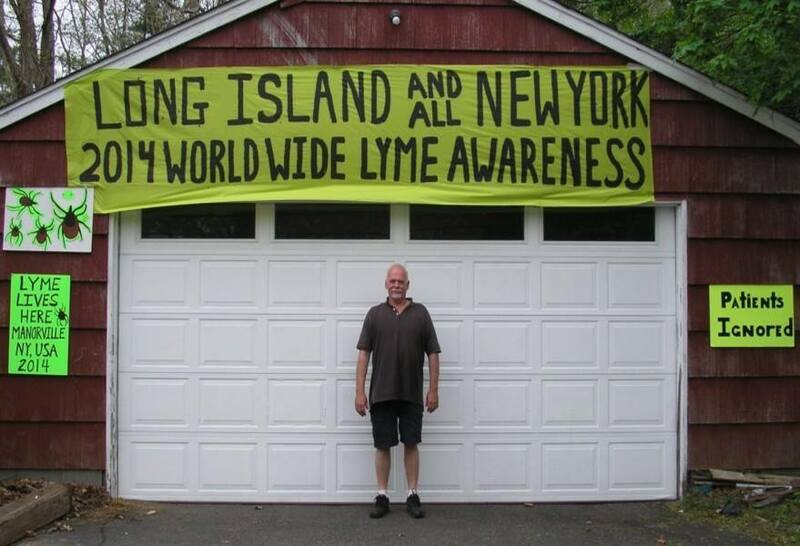 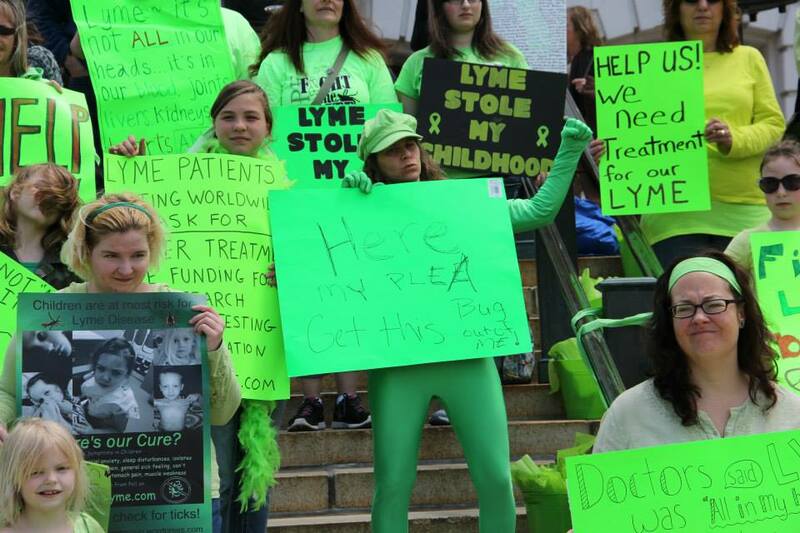 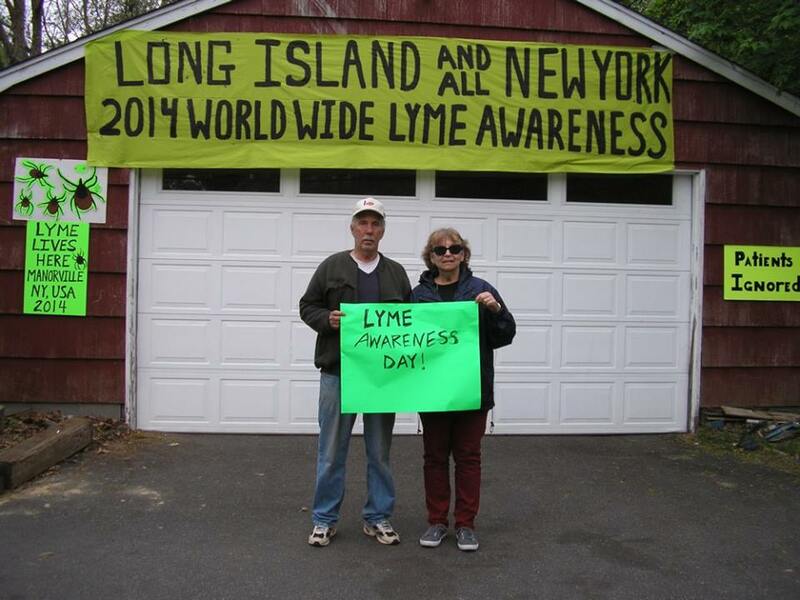 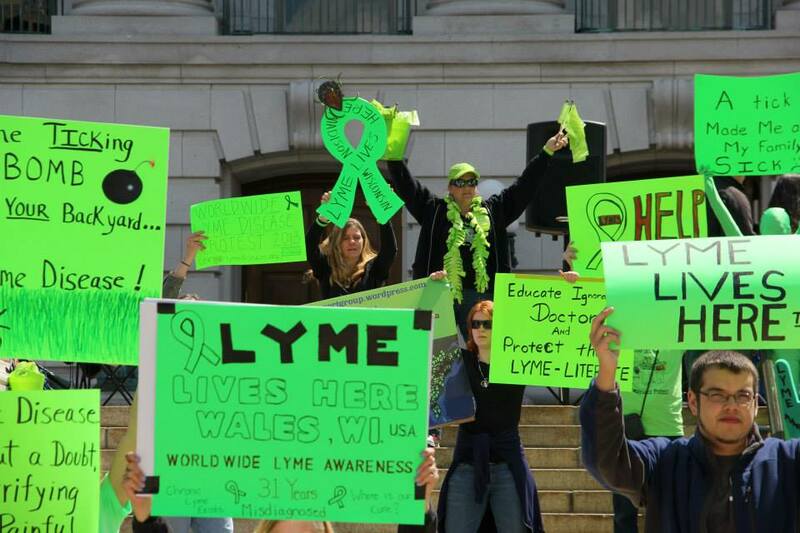 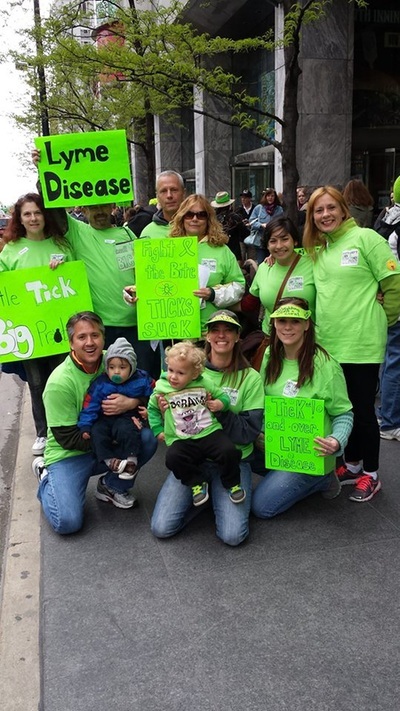 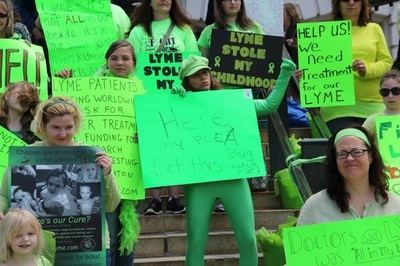 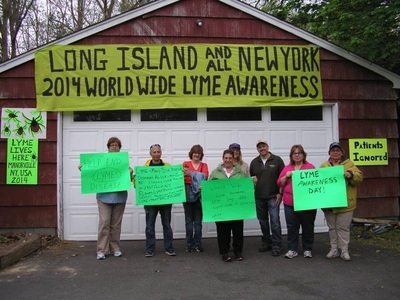 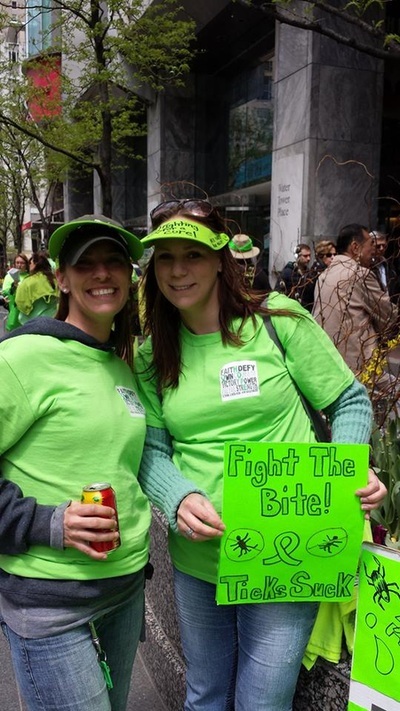 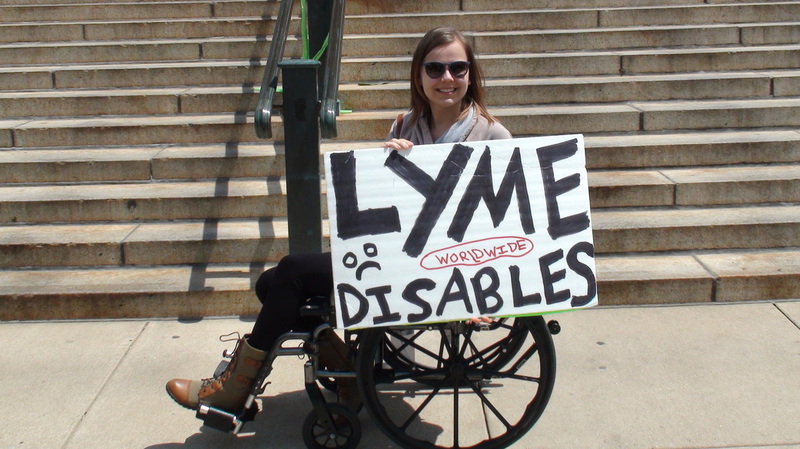 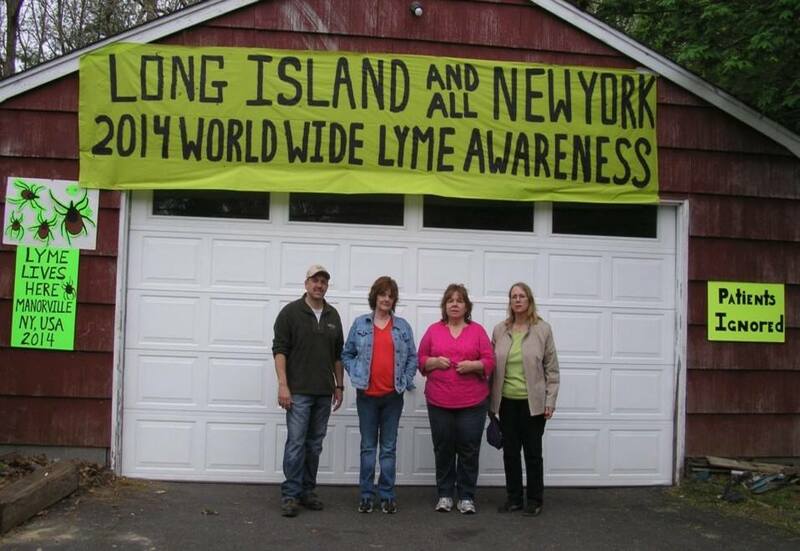 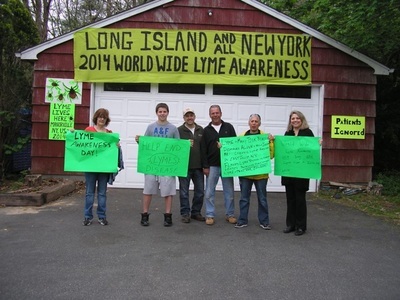 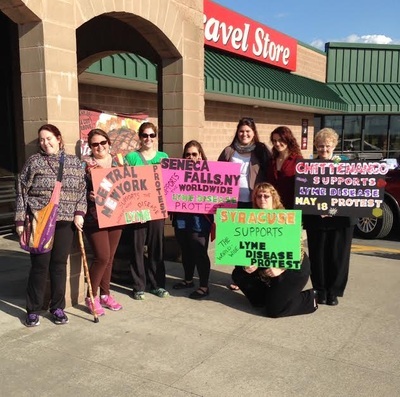 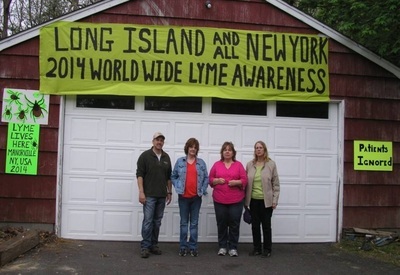 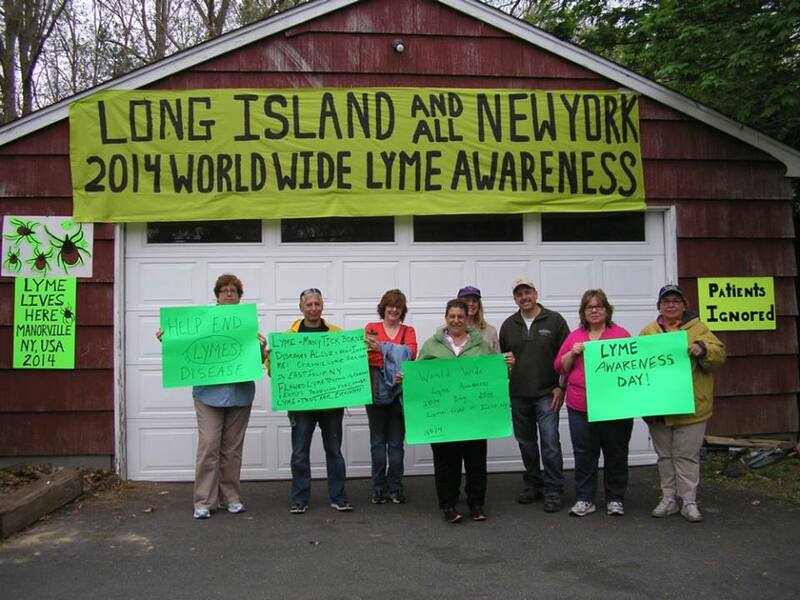 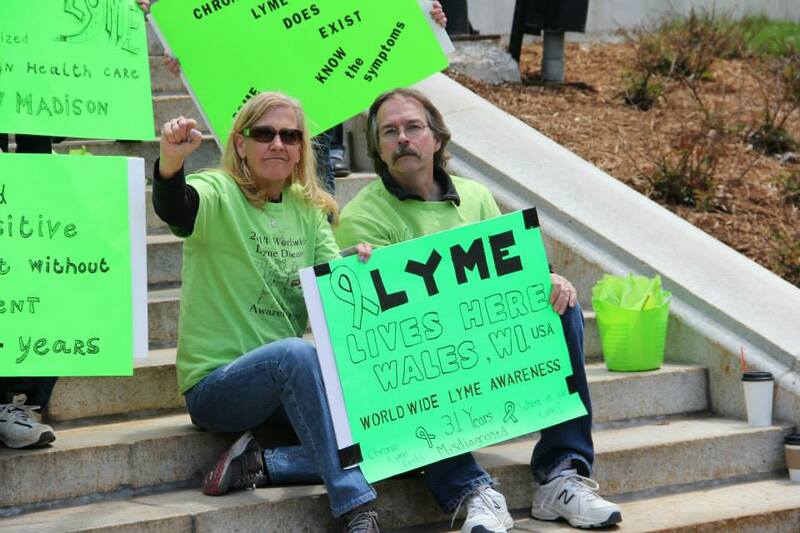 From Empire State: NEW YORK SUPPORTS THE SECOND ANNUAL WWLAP & LYME LIVES HERE! 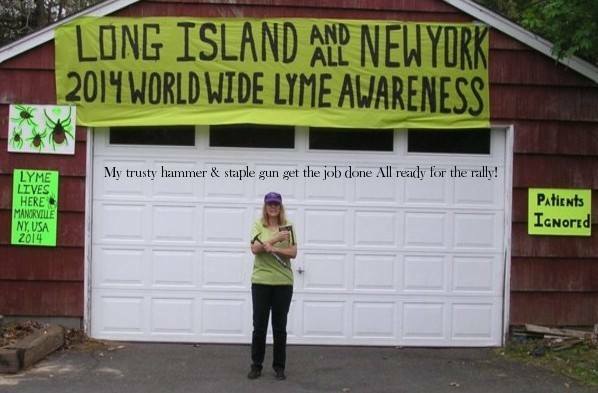 Email empirestatelyme@aol.com to attend, volunteer or announce NY events & lisahilton4@gmail.com for other states. 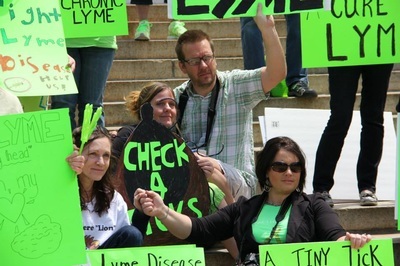 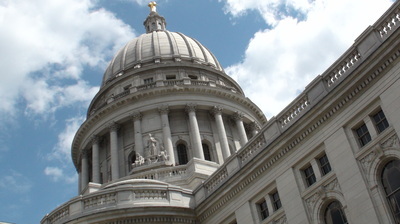 It will be great to see how many patients and advocates are able to participate. 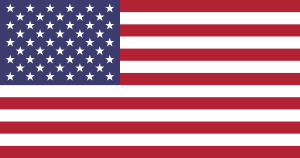 After the WWP, there will be several reports that will include all world wide efforts. 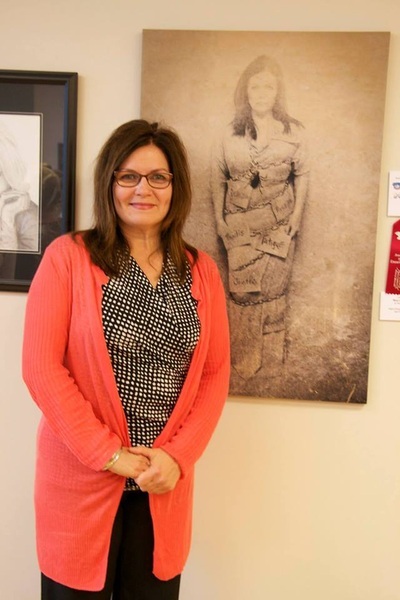 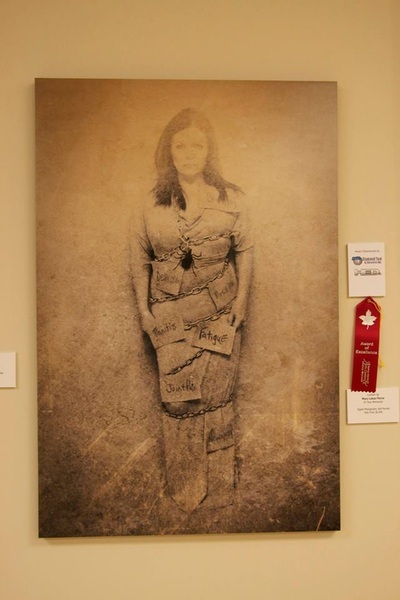 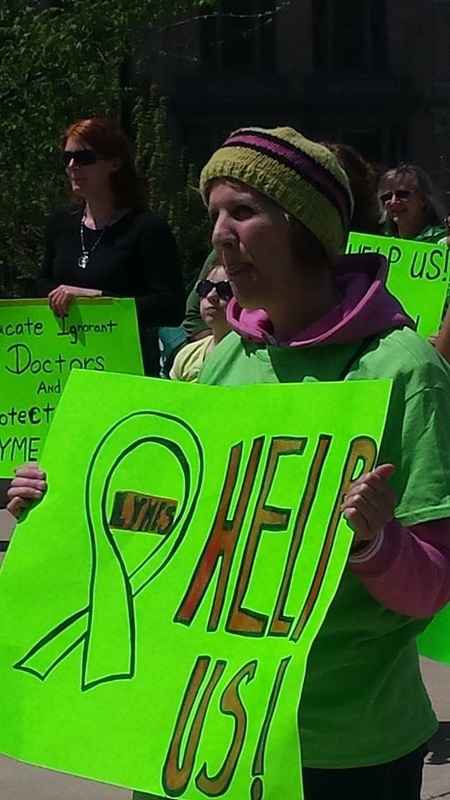 Deborah is a registered nurse and medical advocate. 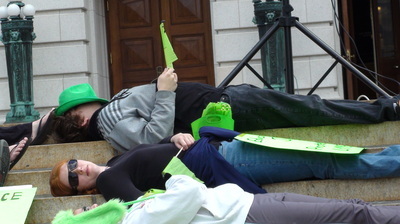 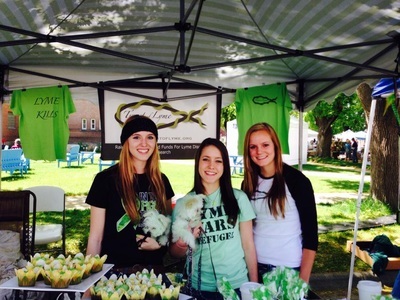 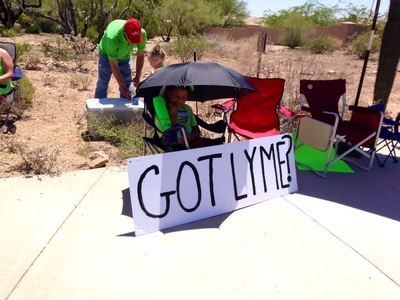 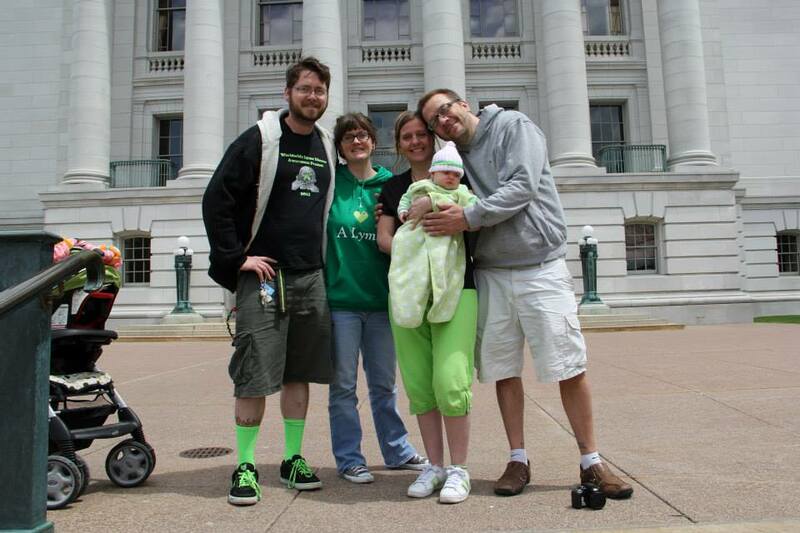 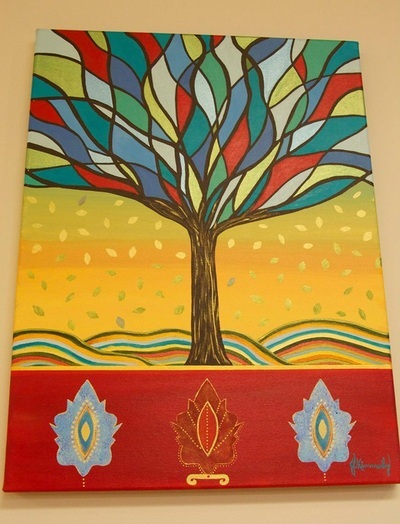 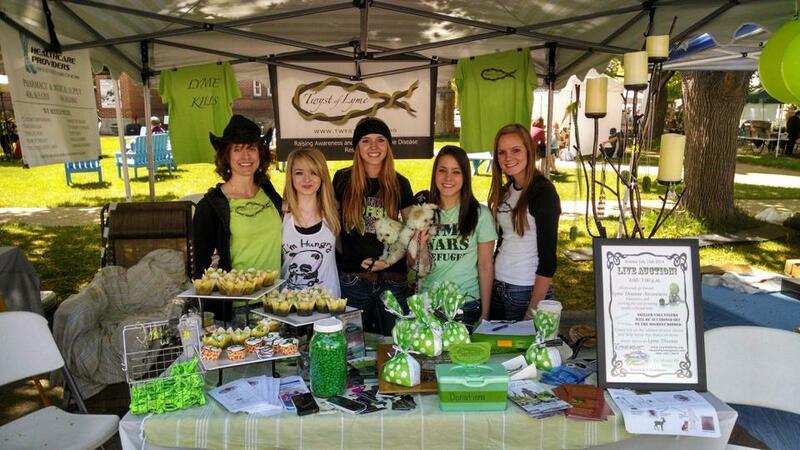 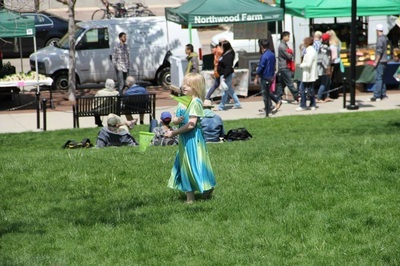 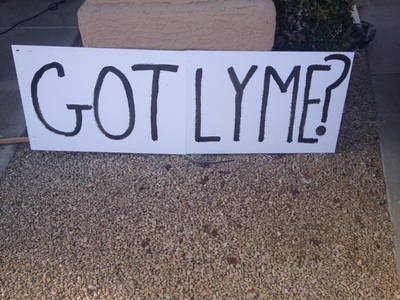 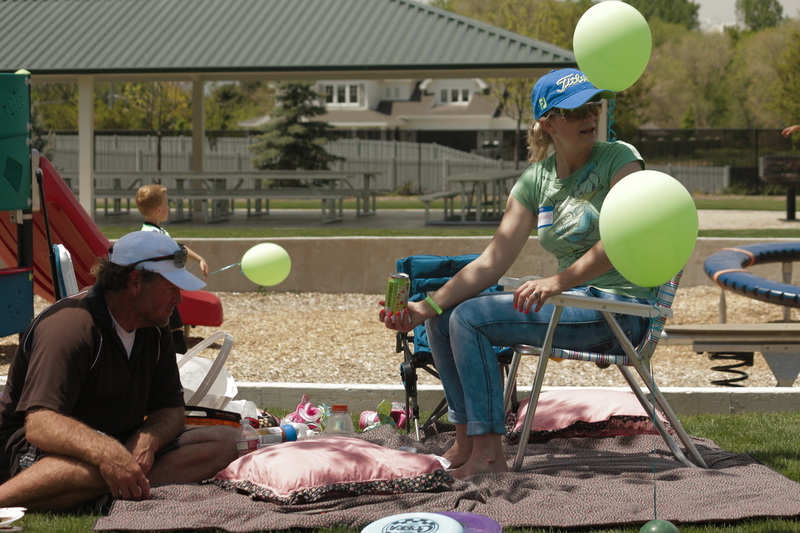 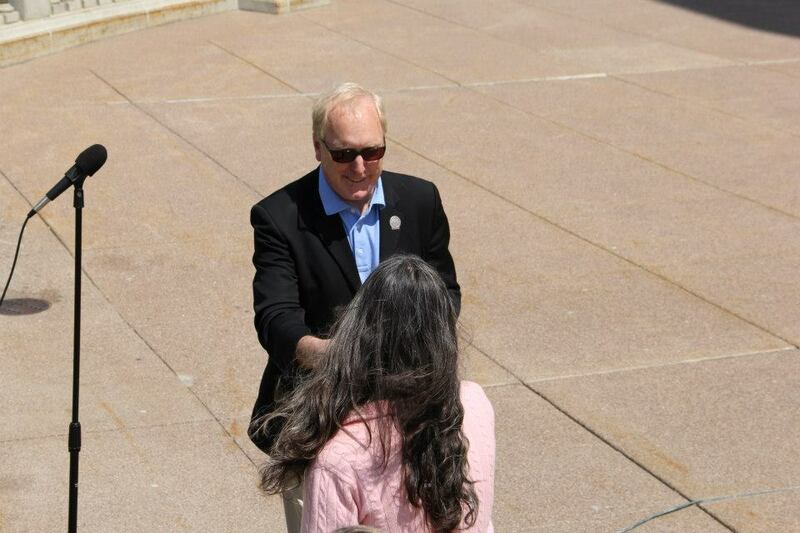 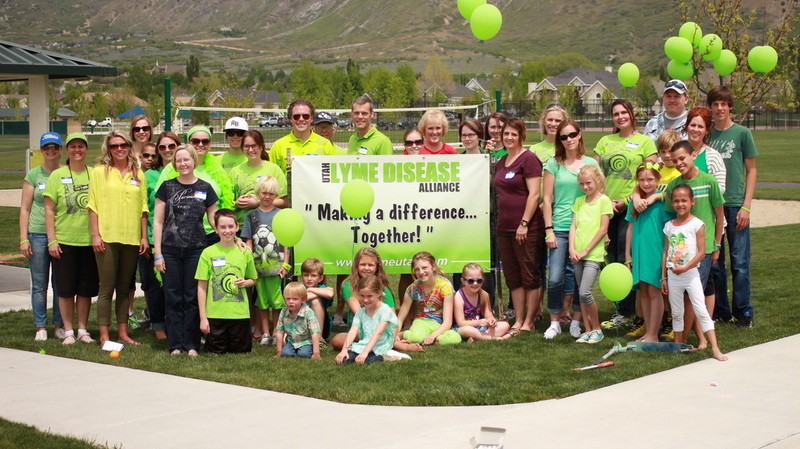 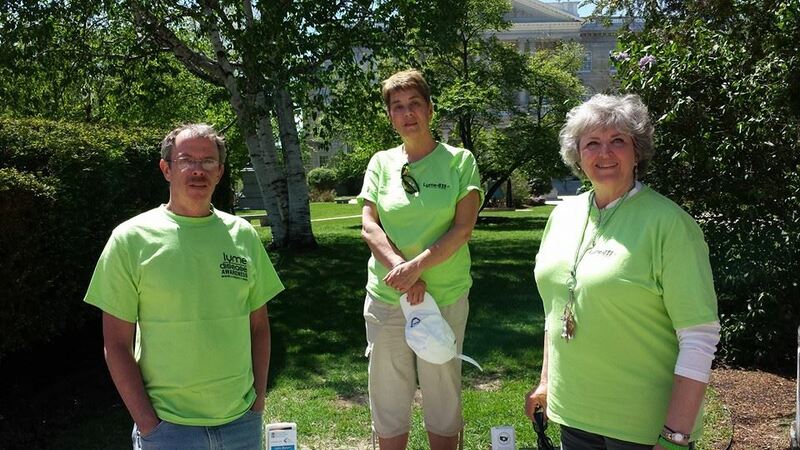 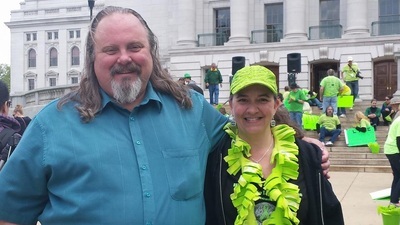 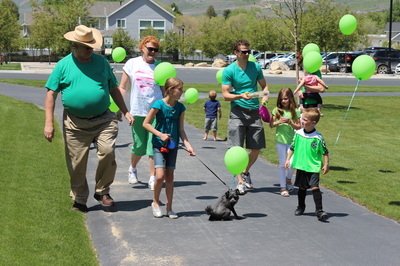 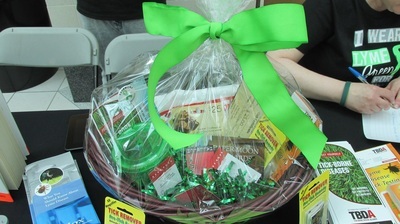 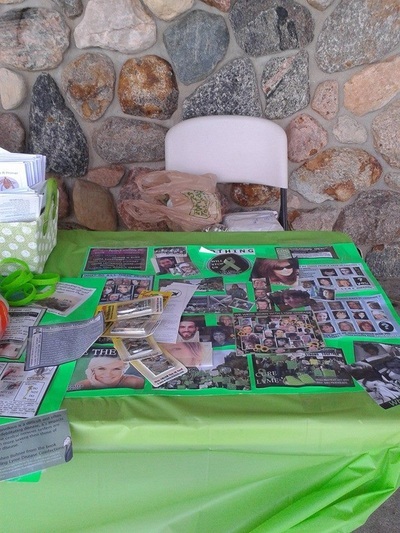 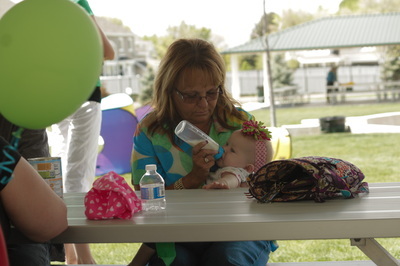 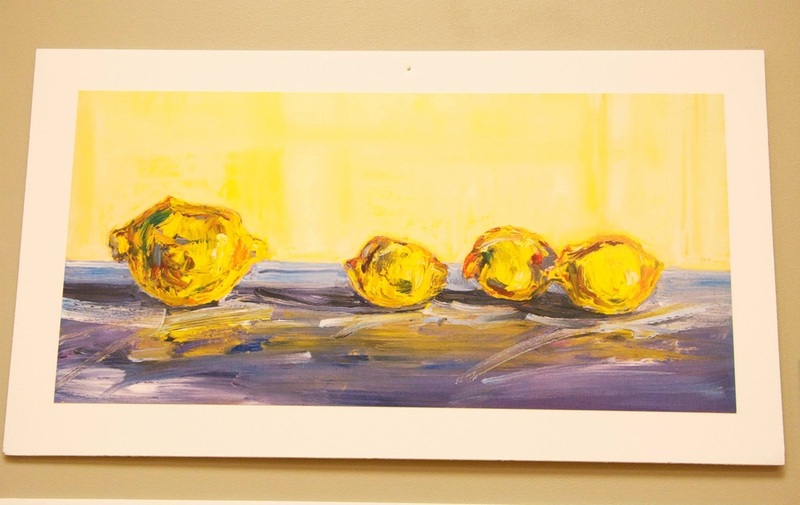 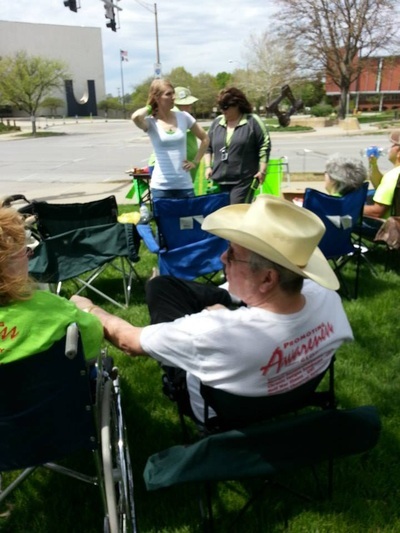 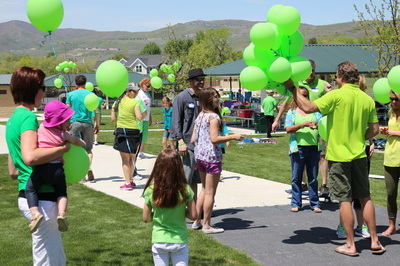 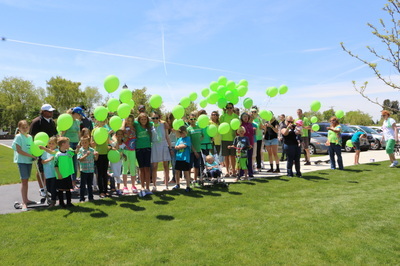 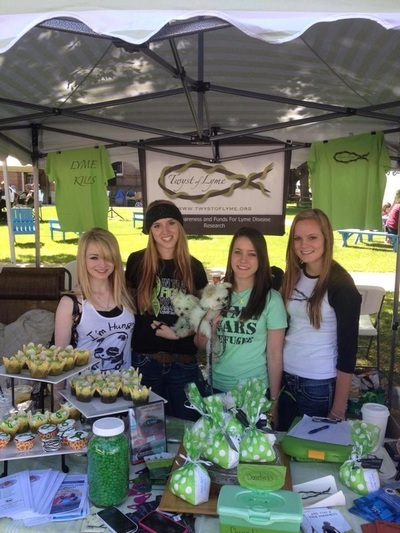 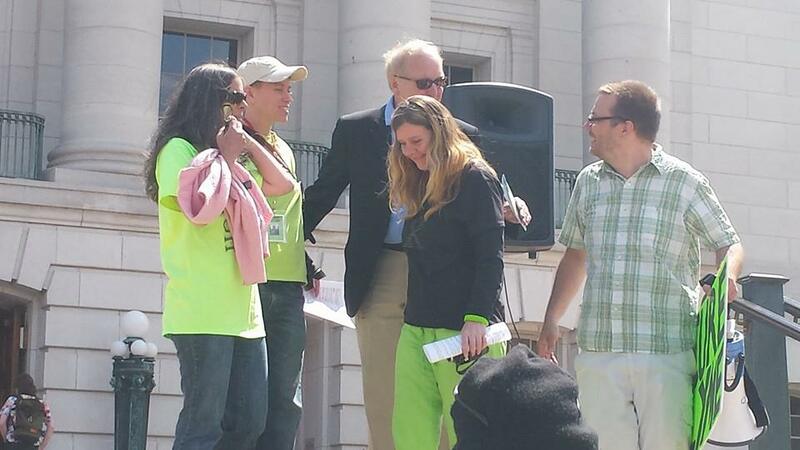 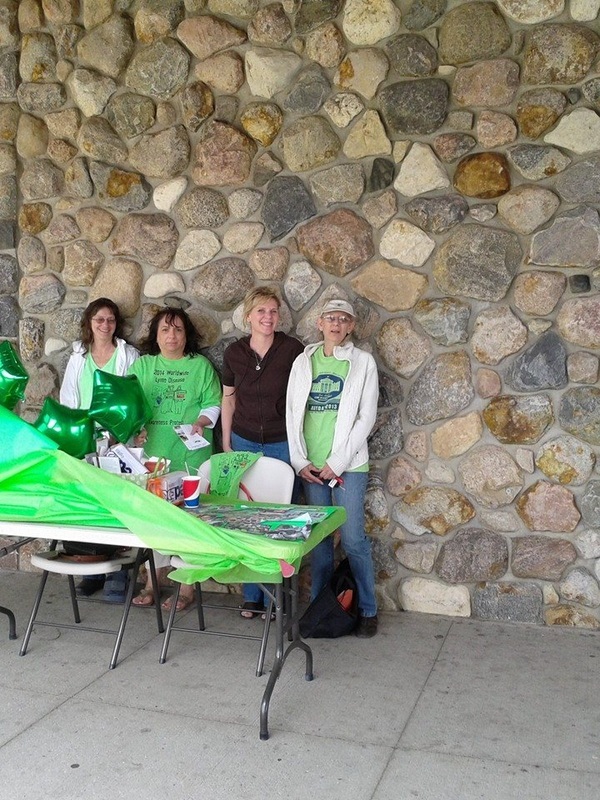 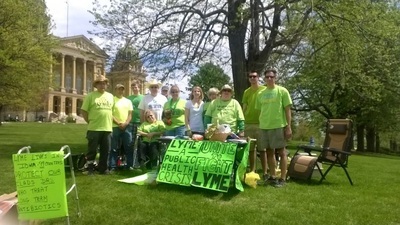 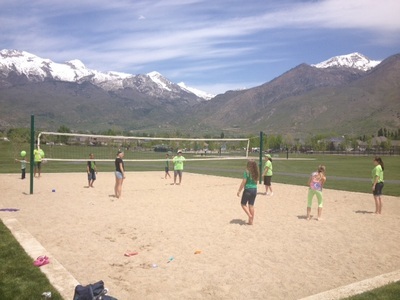 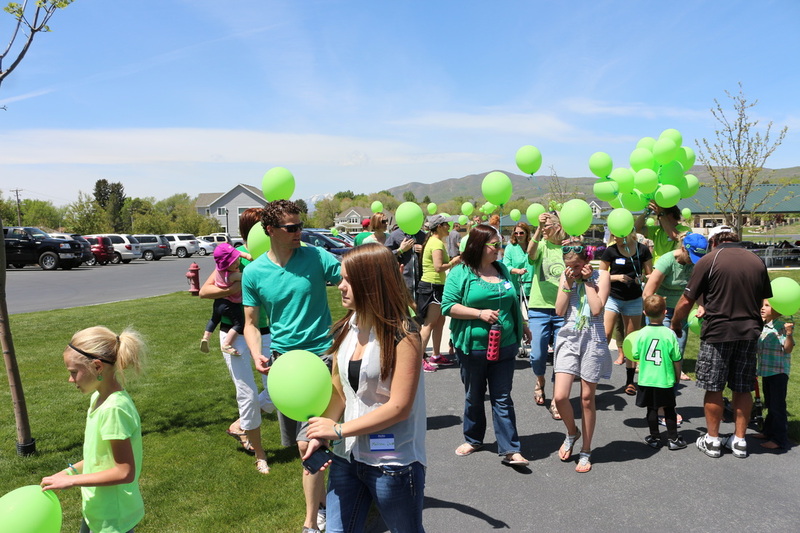 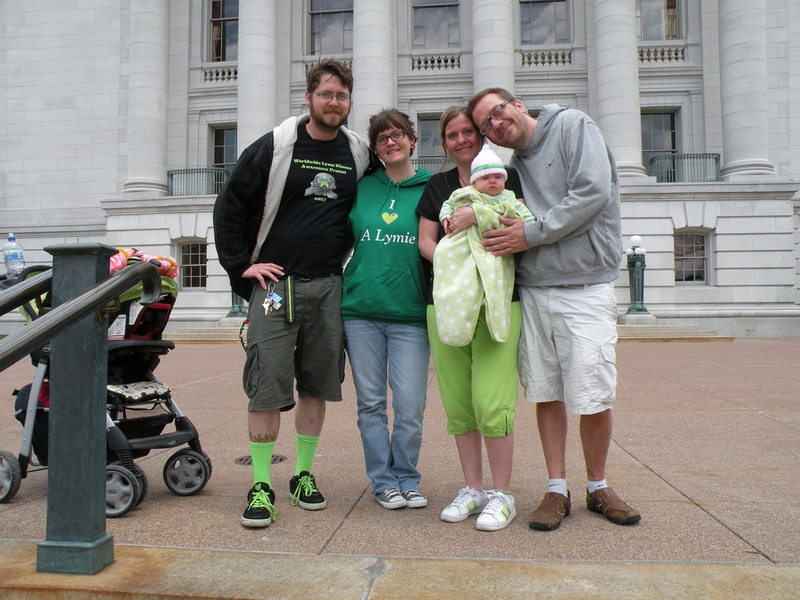 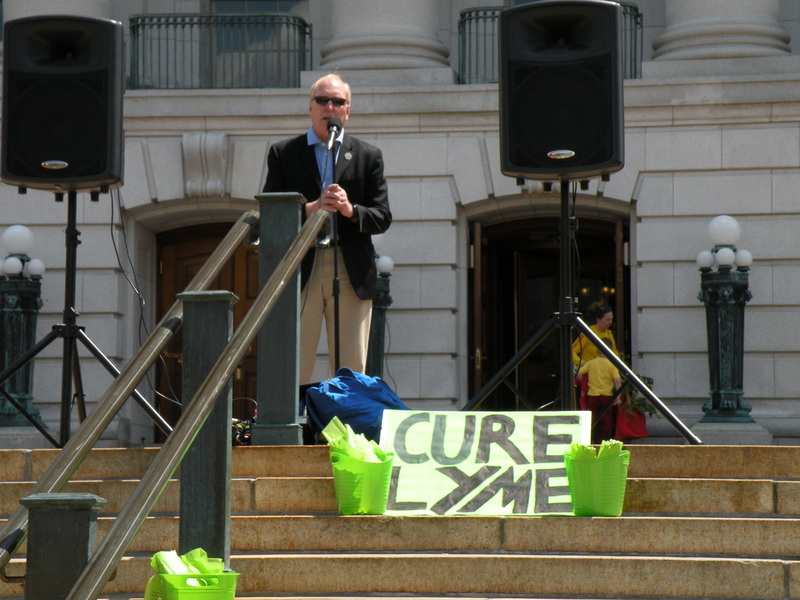 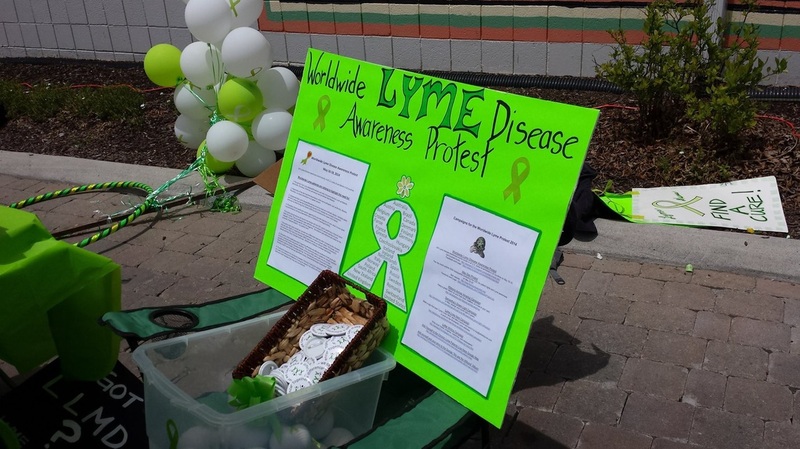 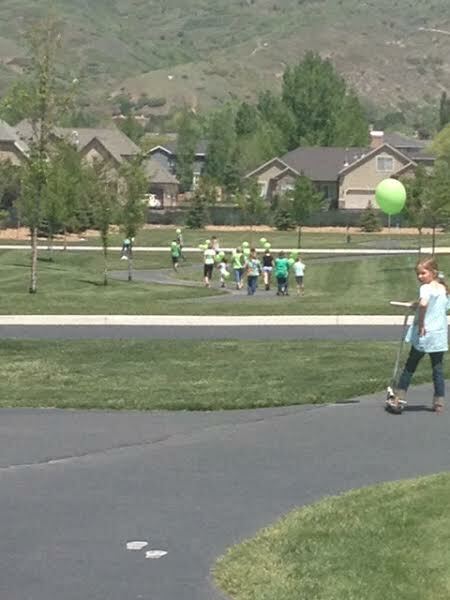 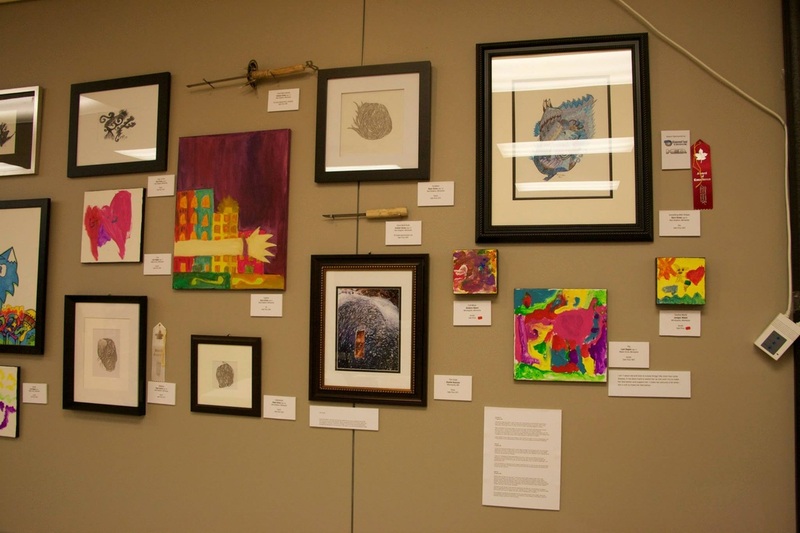 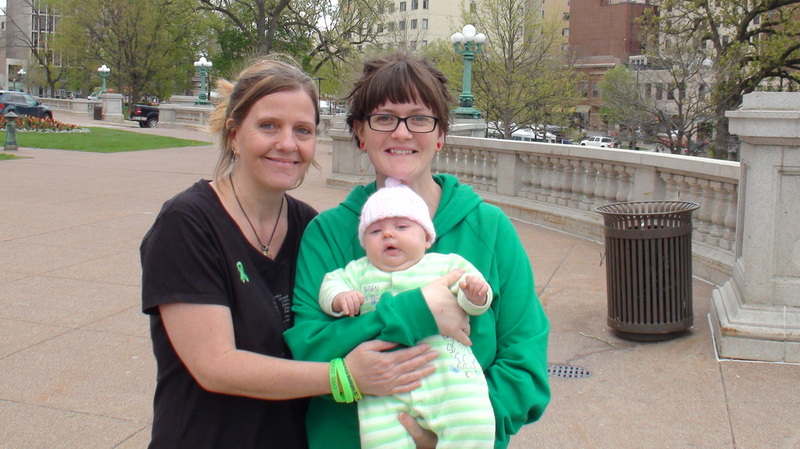 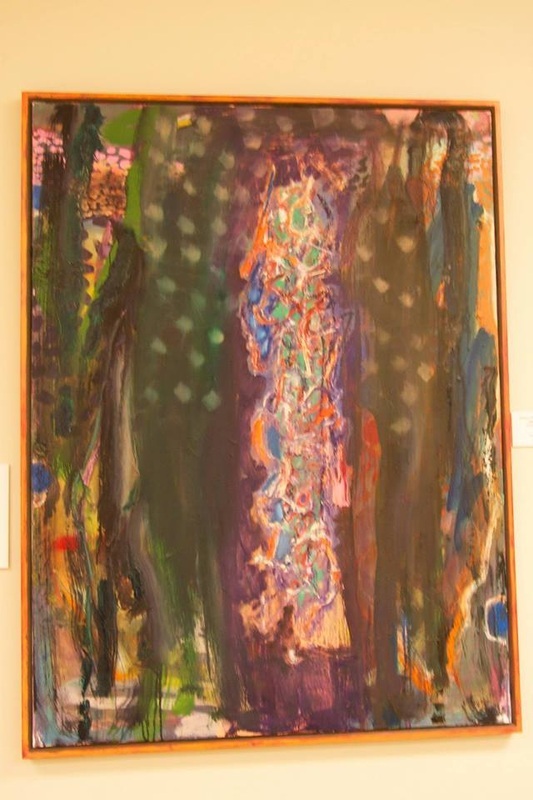 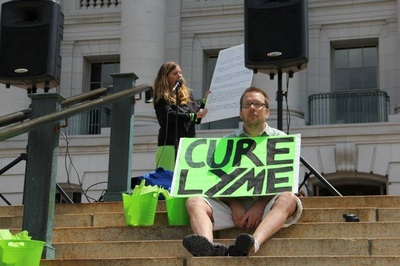 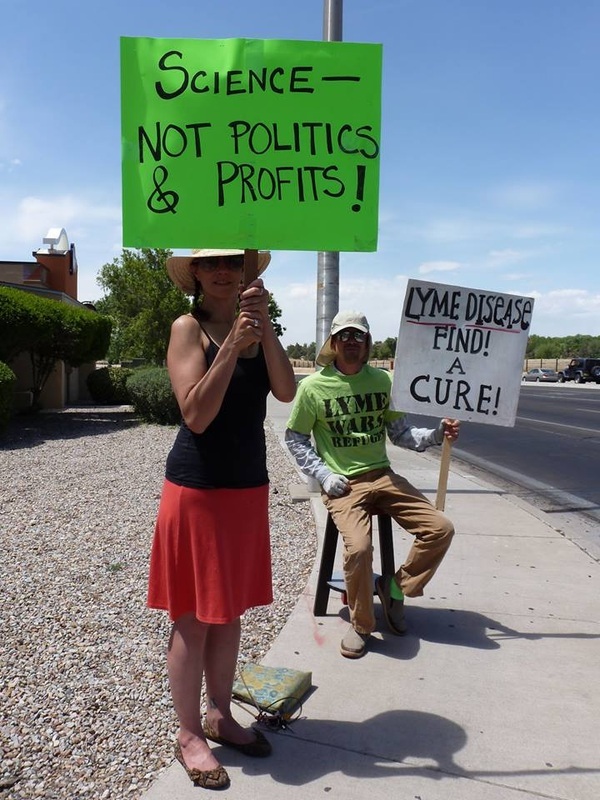 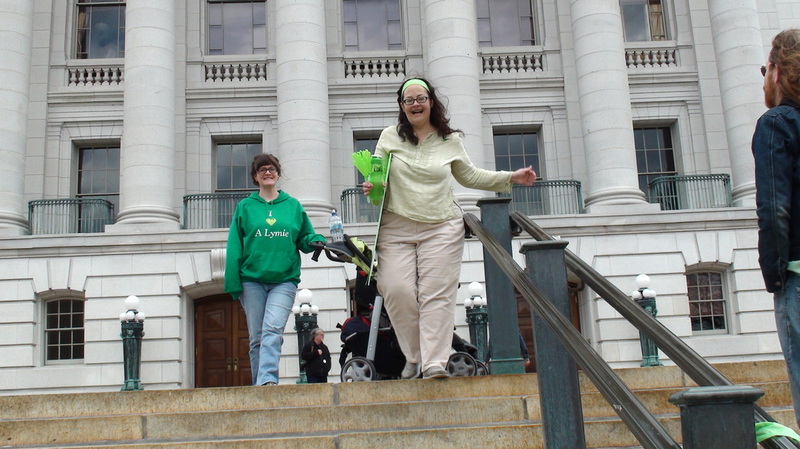 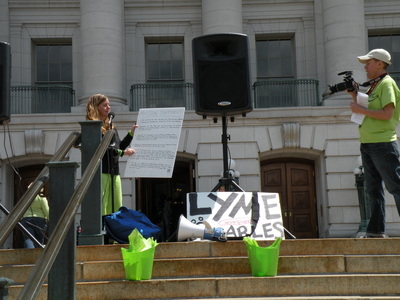 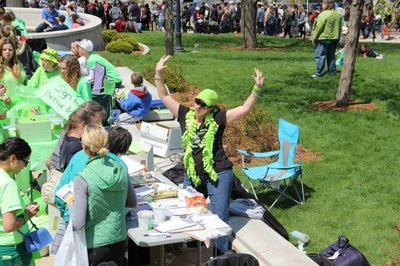 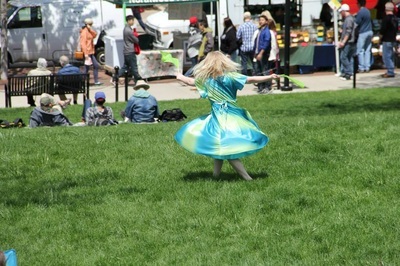 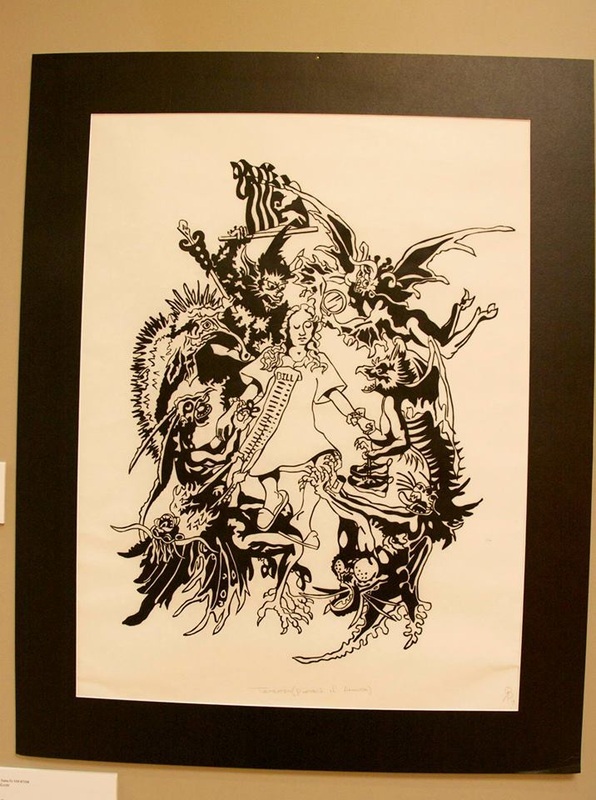 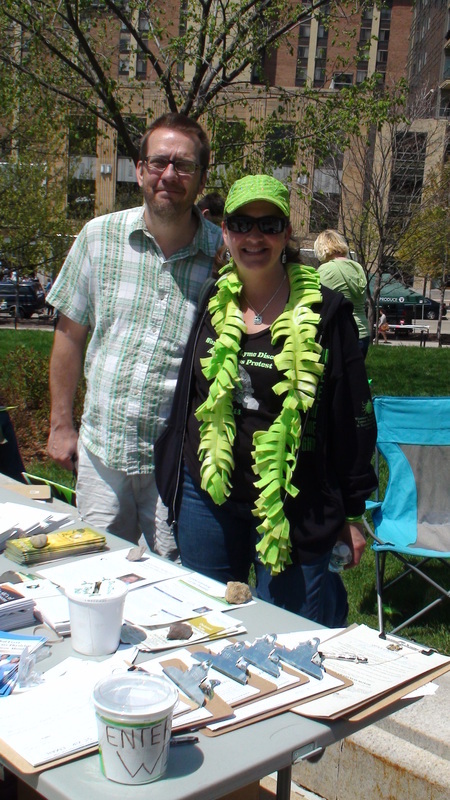 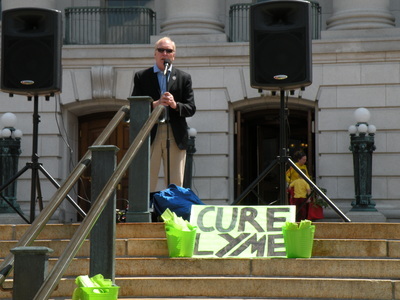 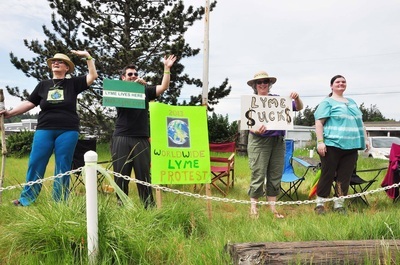 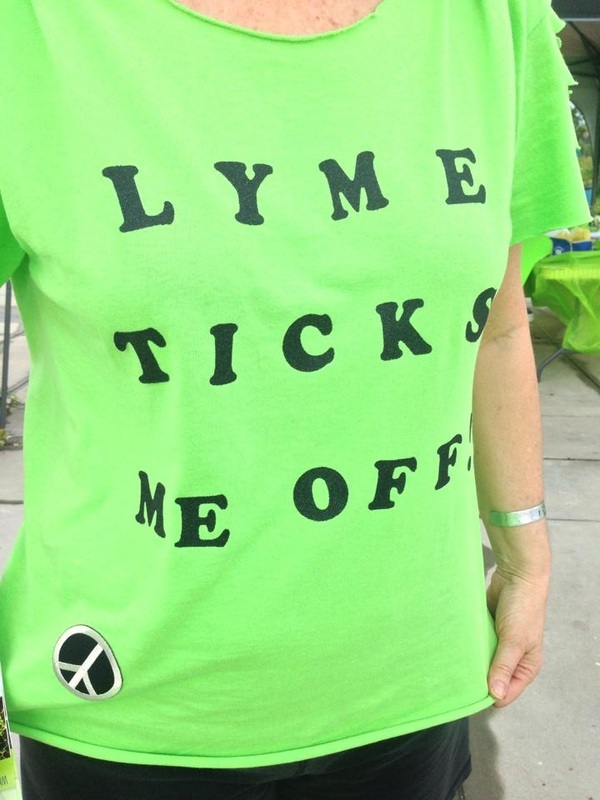 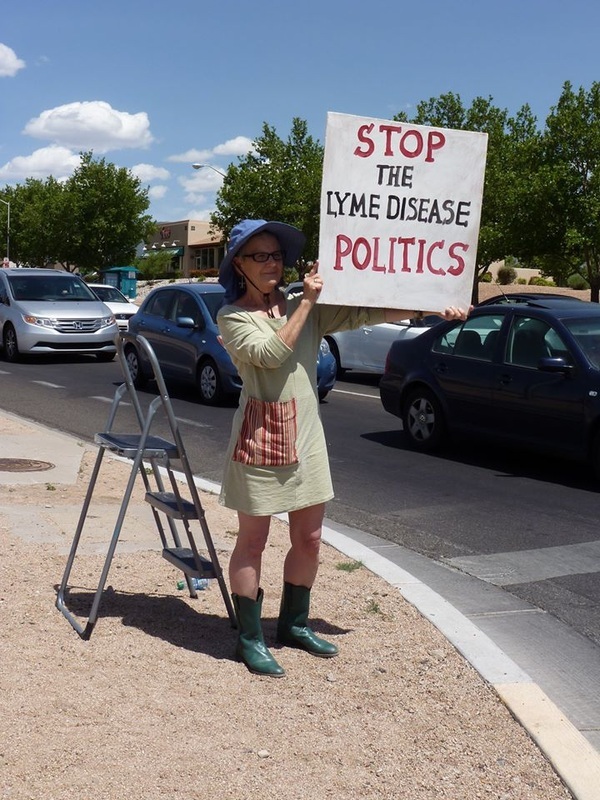 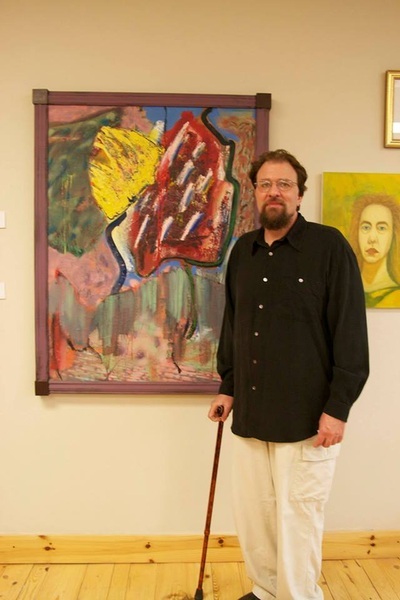 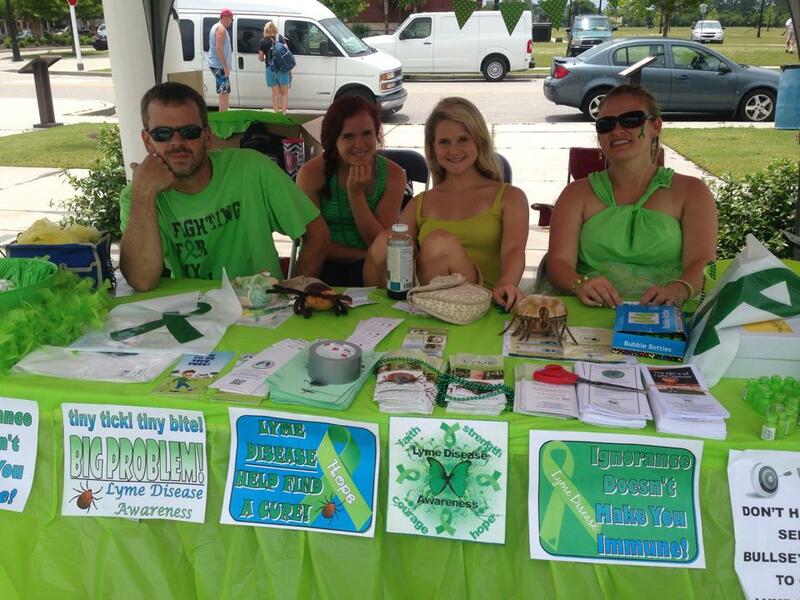 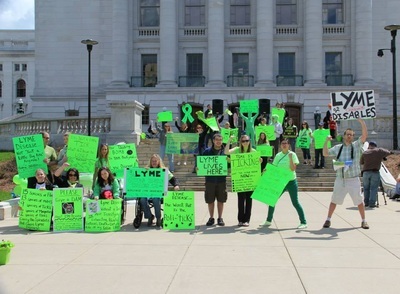 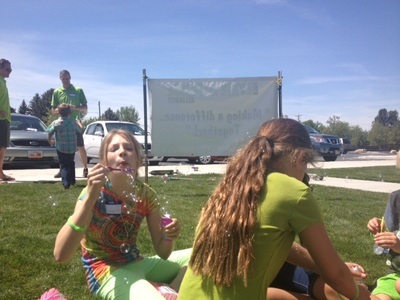 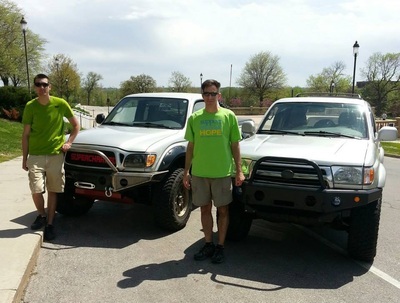 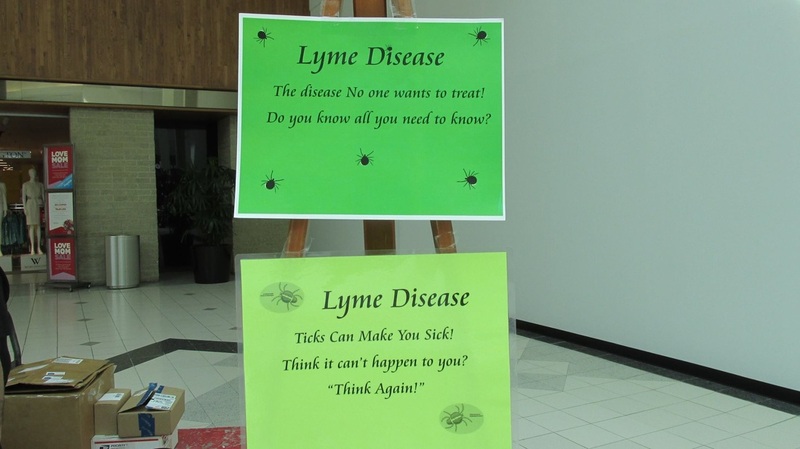 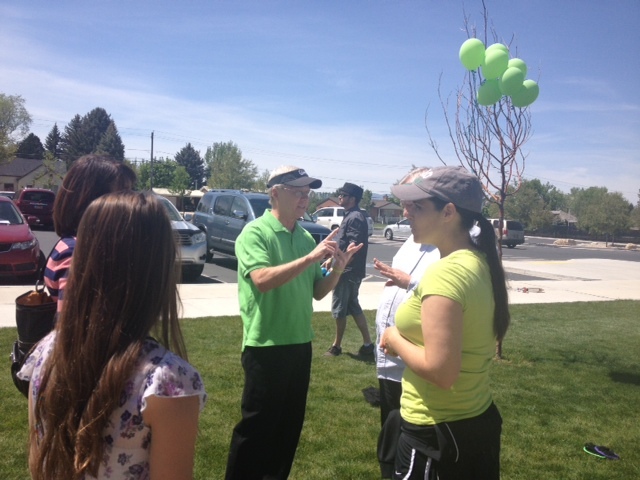 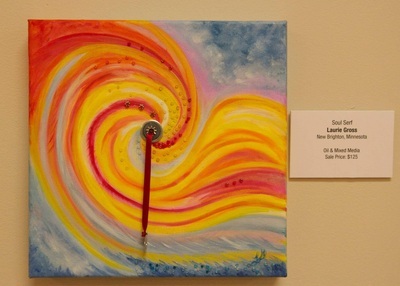 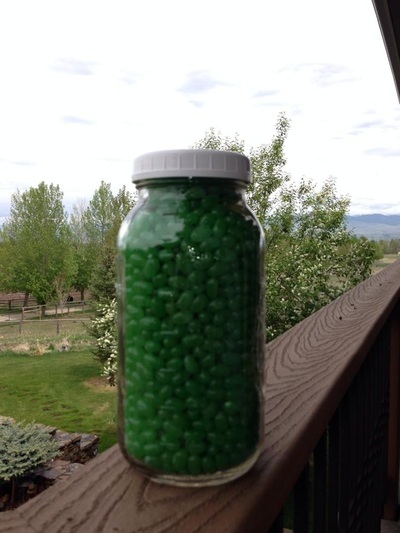 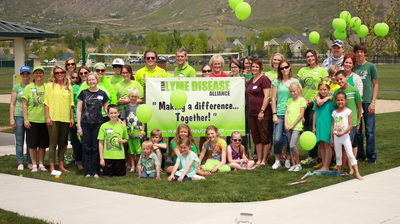 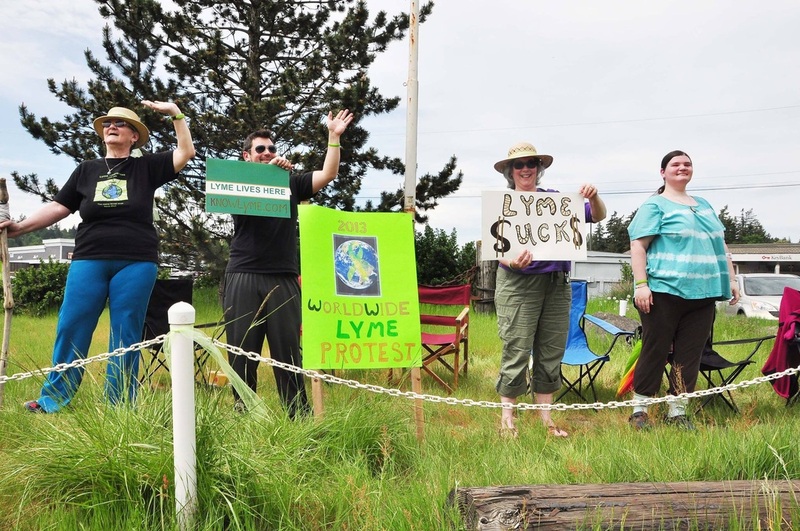 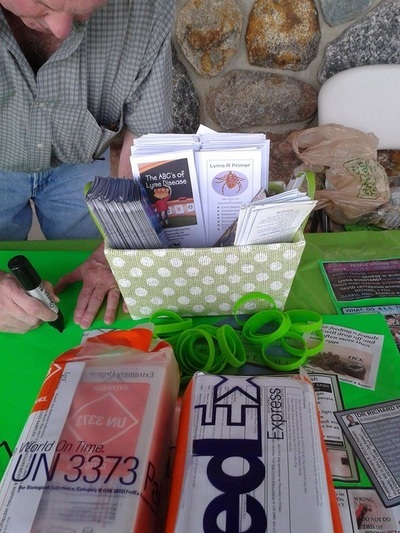 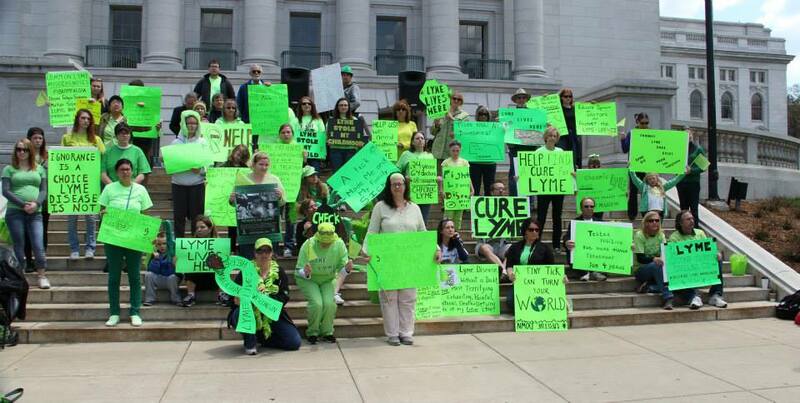 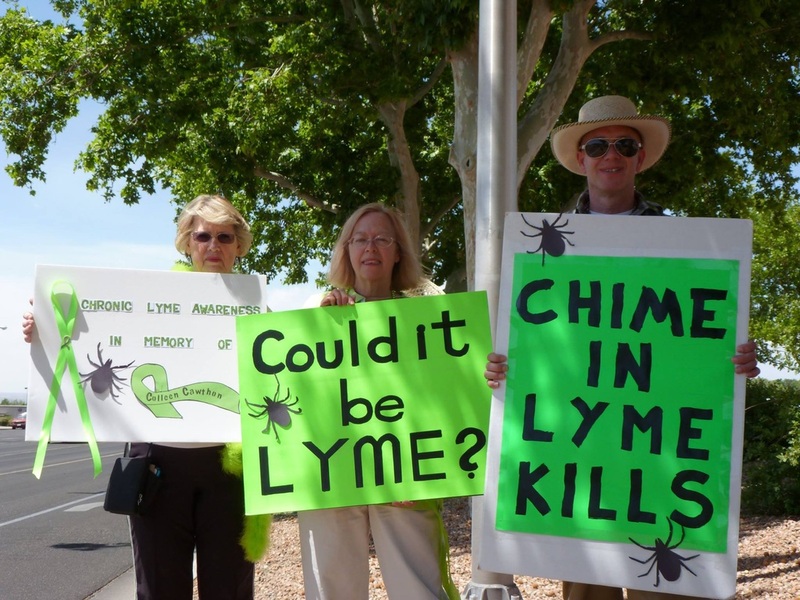 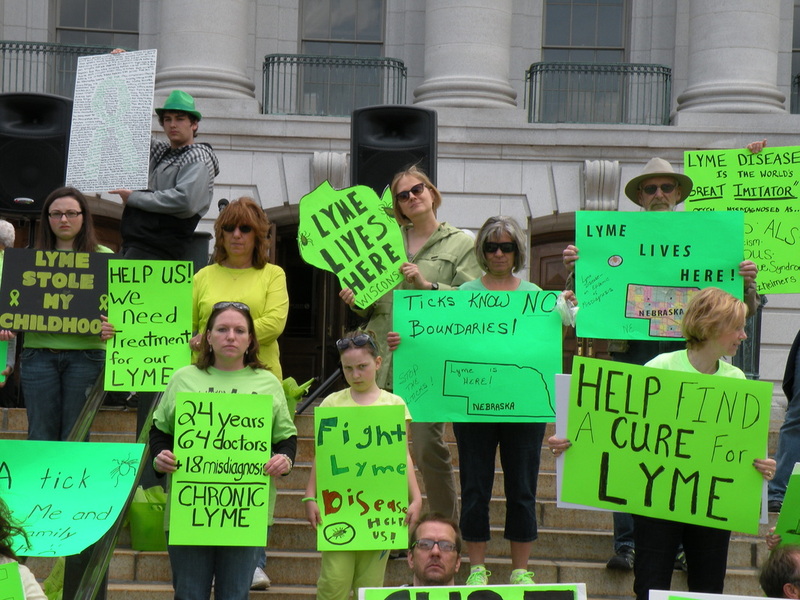 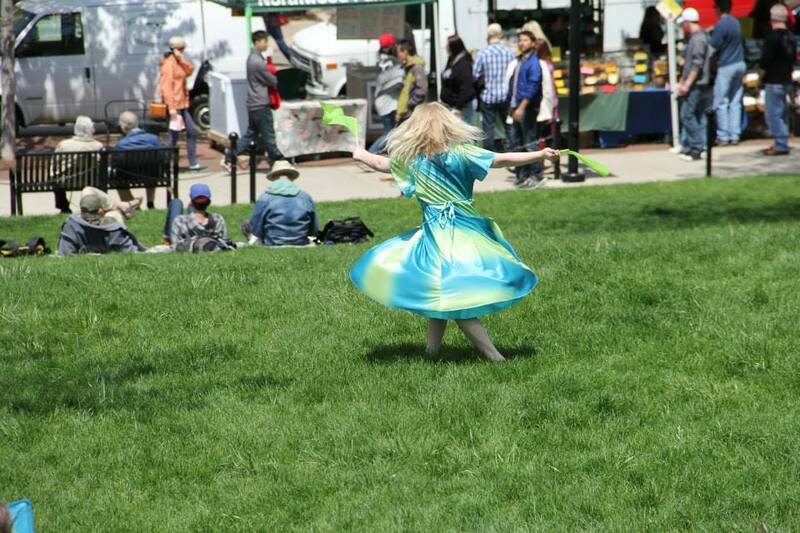 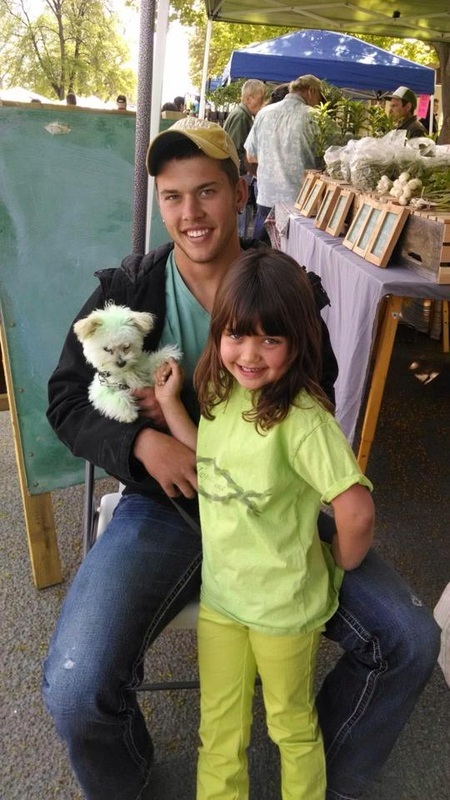 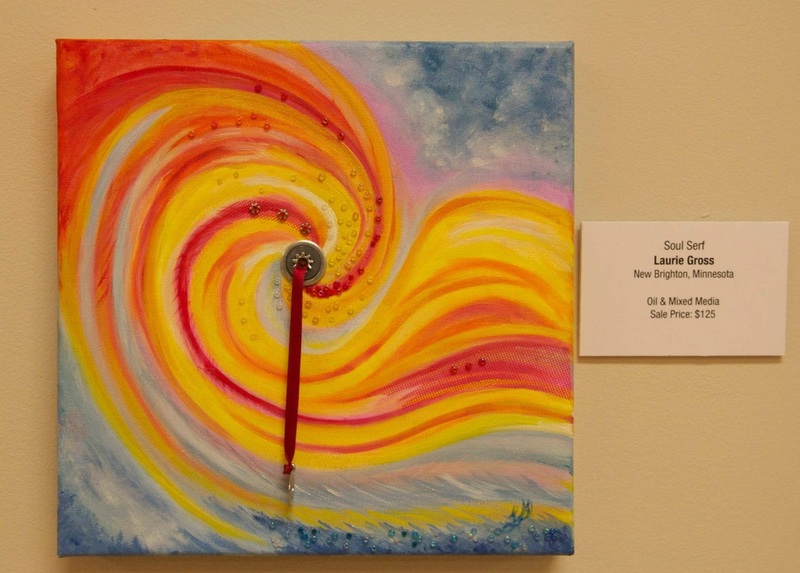 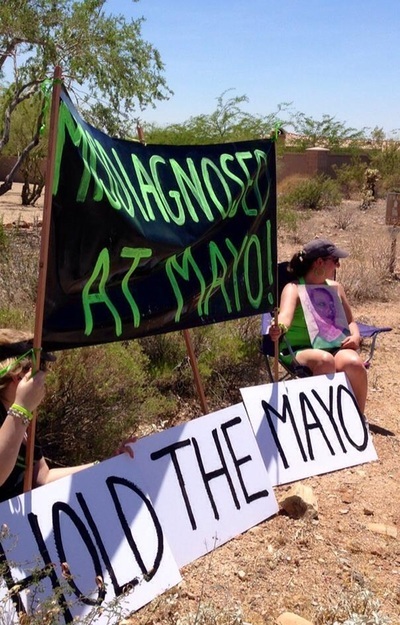 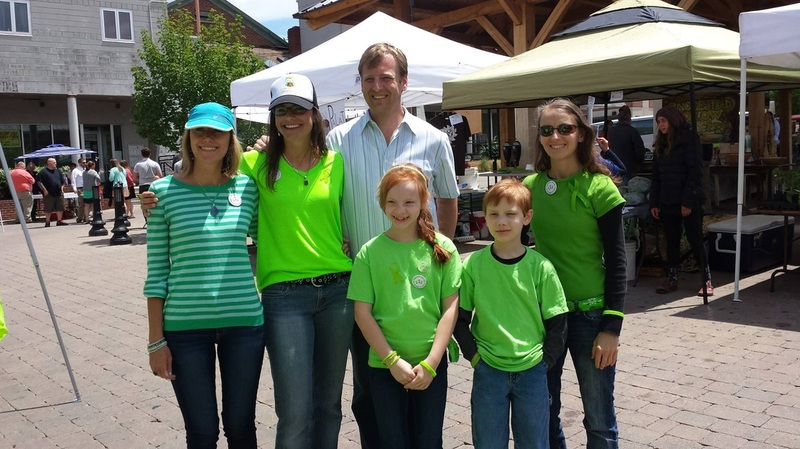 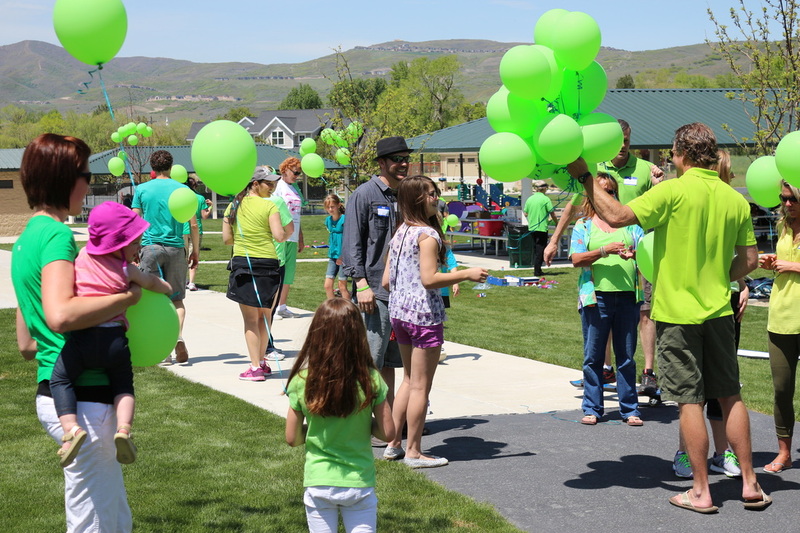 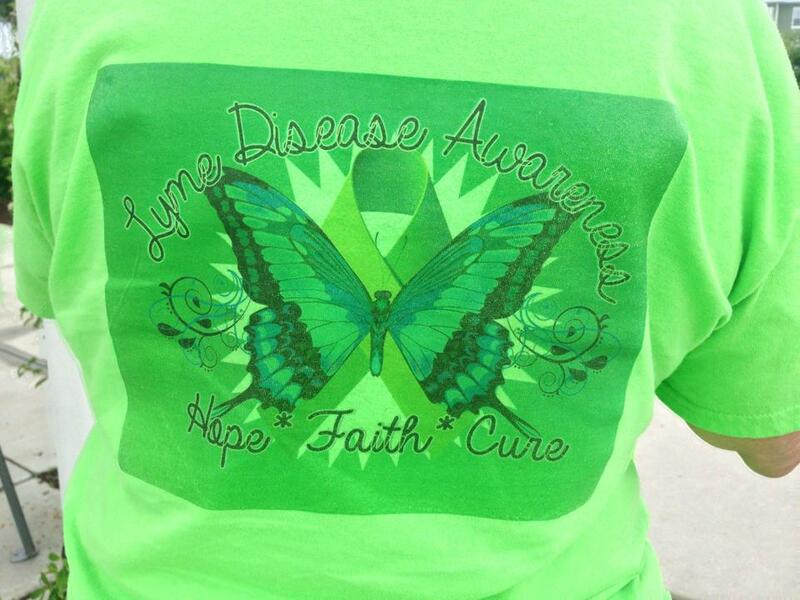 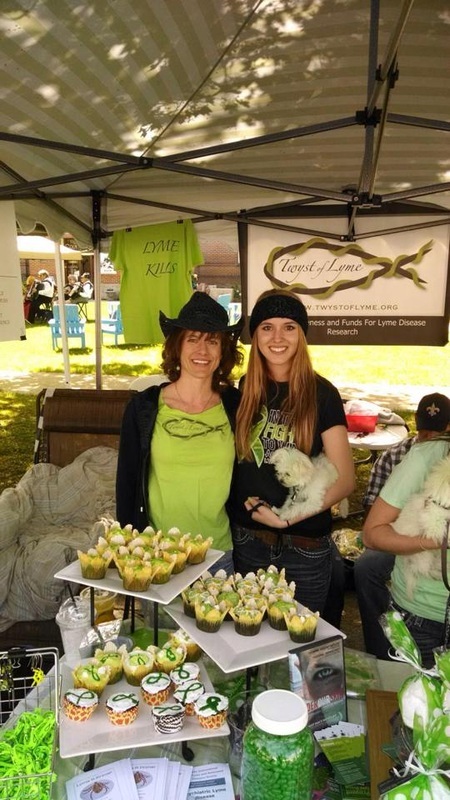 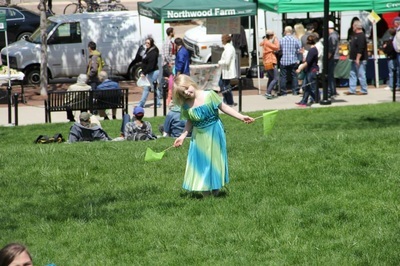 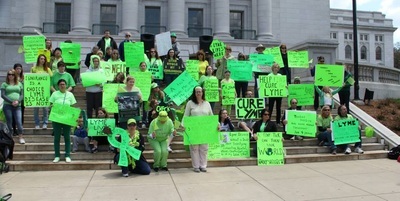 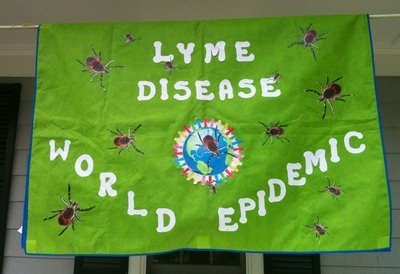 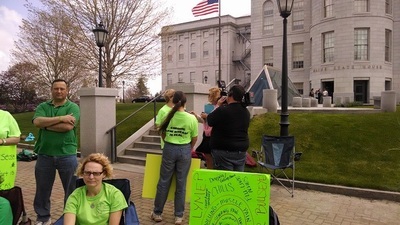 This event was organized to " uplift and unite" the Lyme sufferers in Utah. 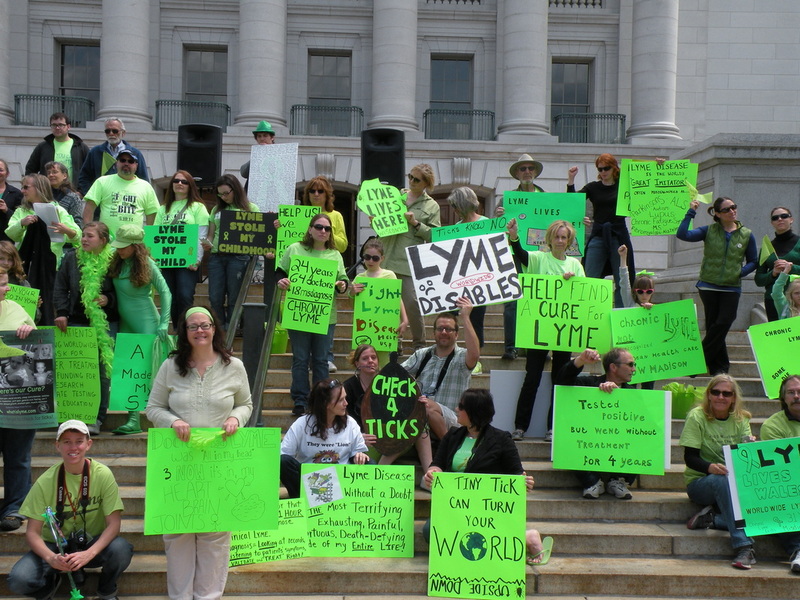 The disease is not well understood or known about in the medical community here in Utah nor the public. 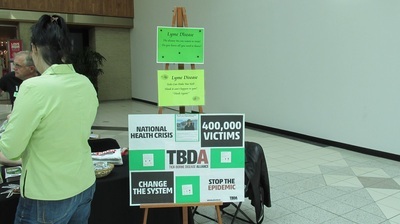 We were able to get a 3 minute news clip regarding the ULDA organization and the disease. 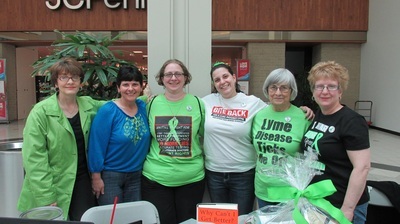 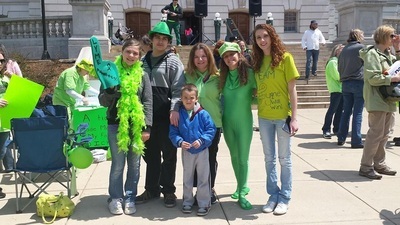 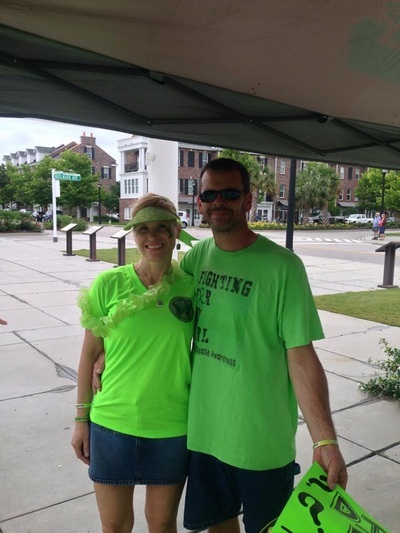 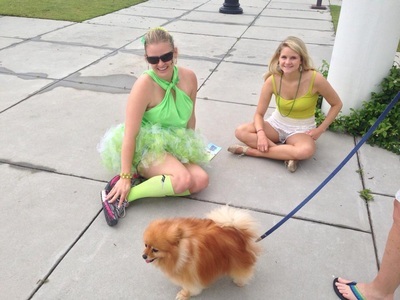 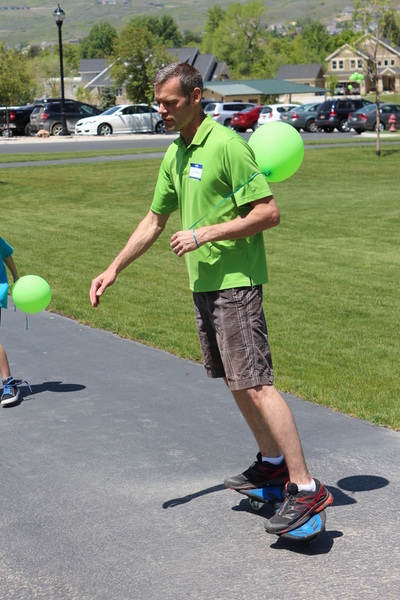 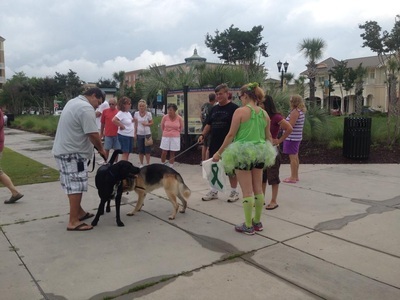 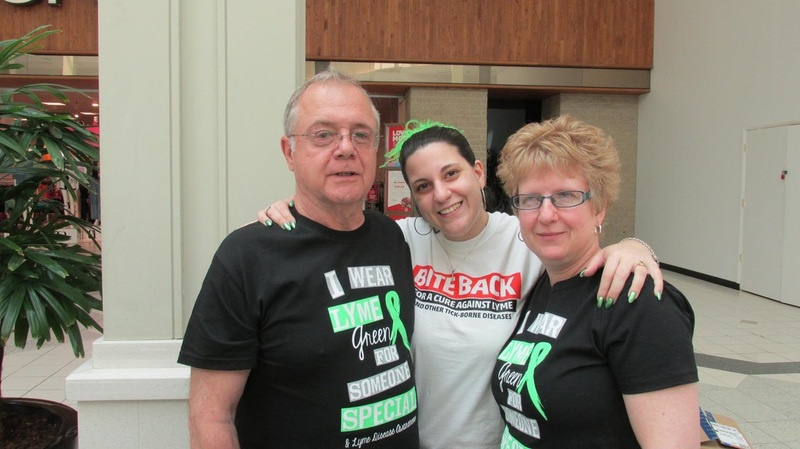 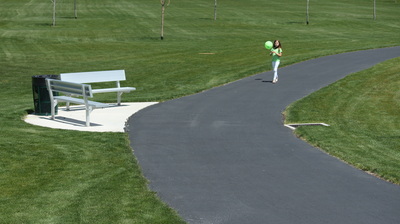 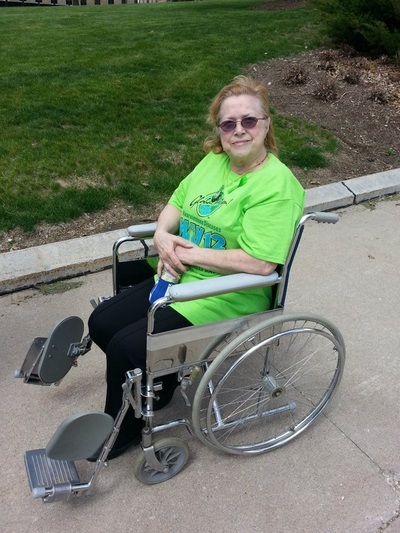 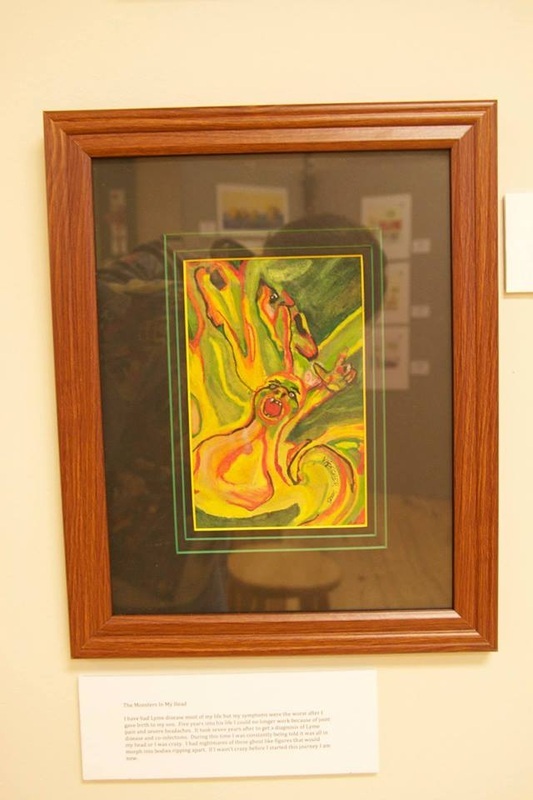 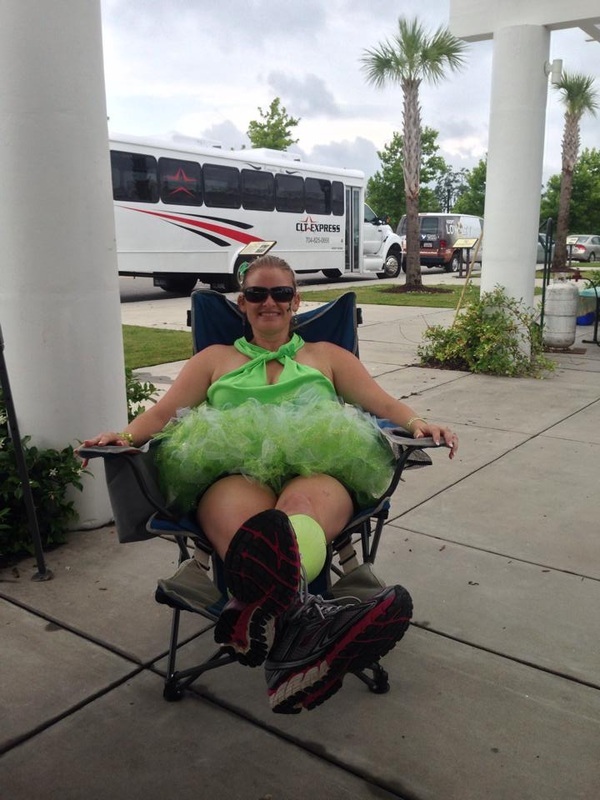 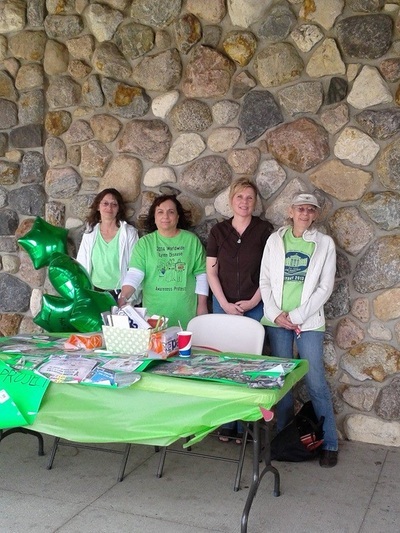 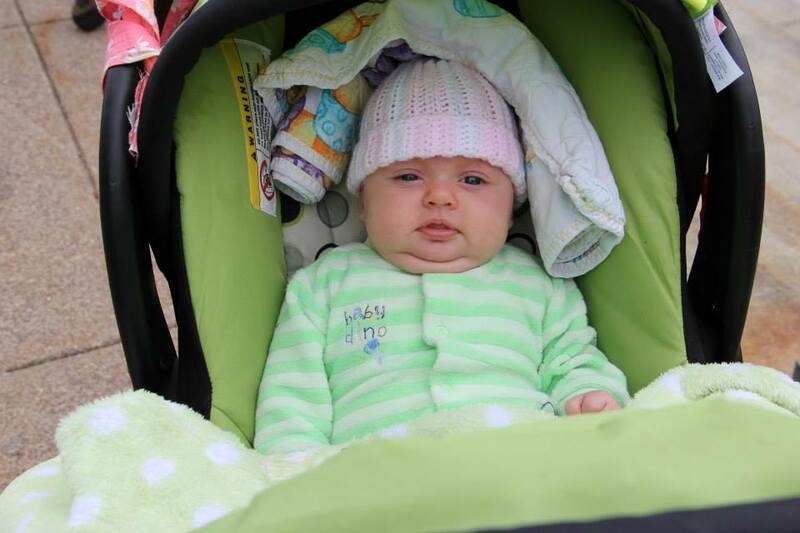 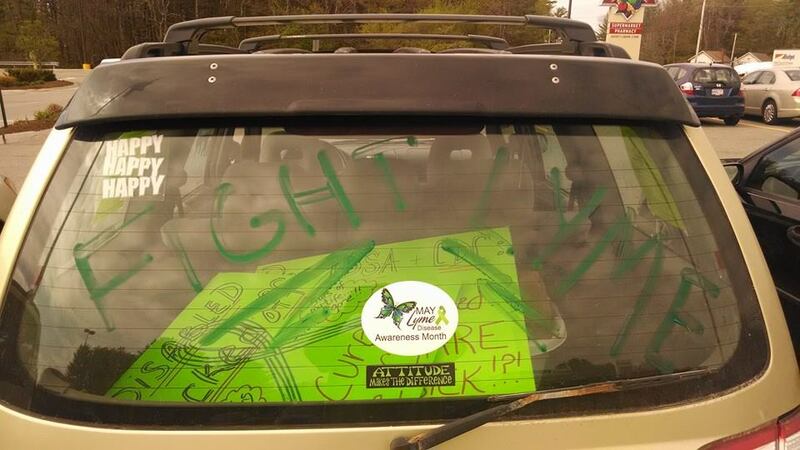 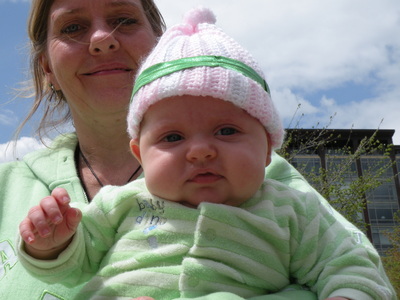 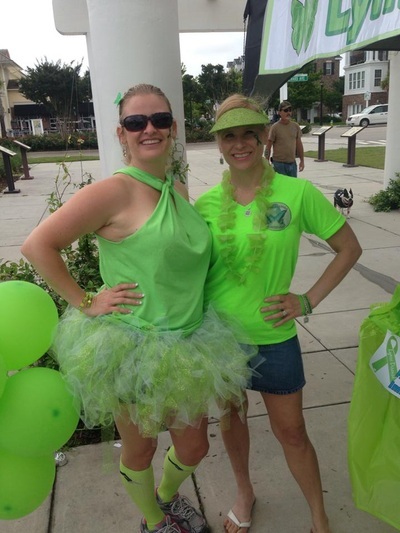 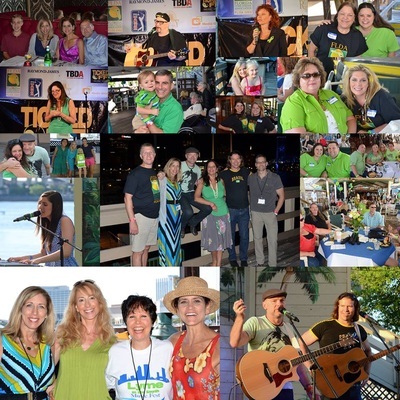 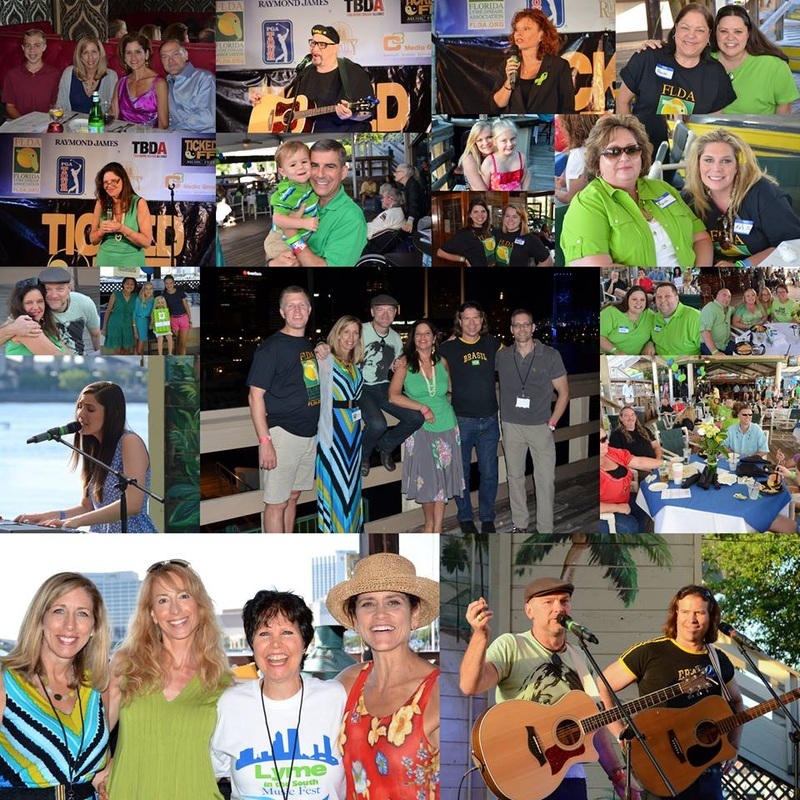 This event allowed Lyme warriors and their families to come together in a pleasant experience with laughter and fun. 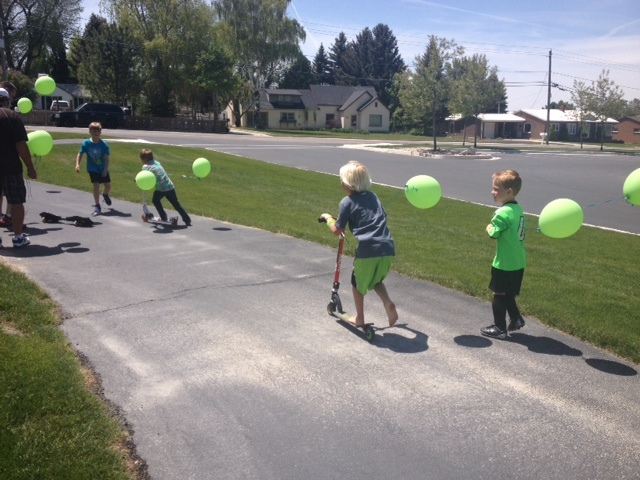 We played volleyball and had tons of kids games and a " Lyme walk". 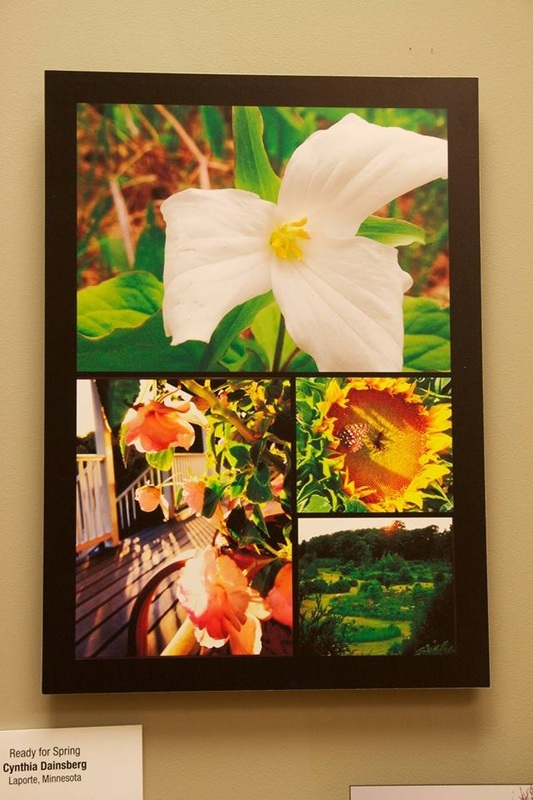 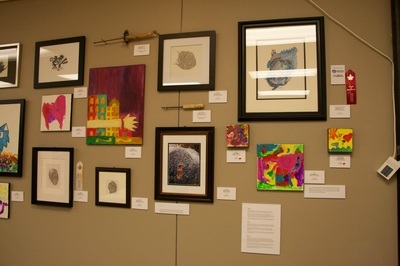 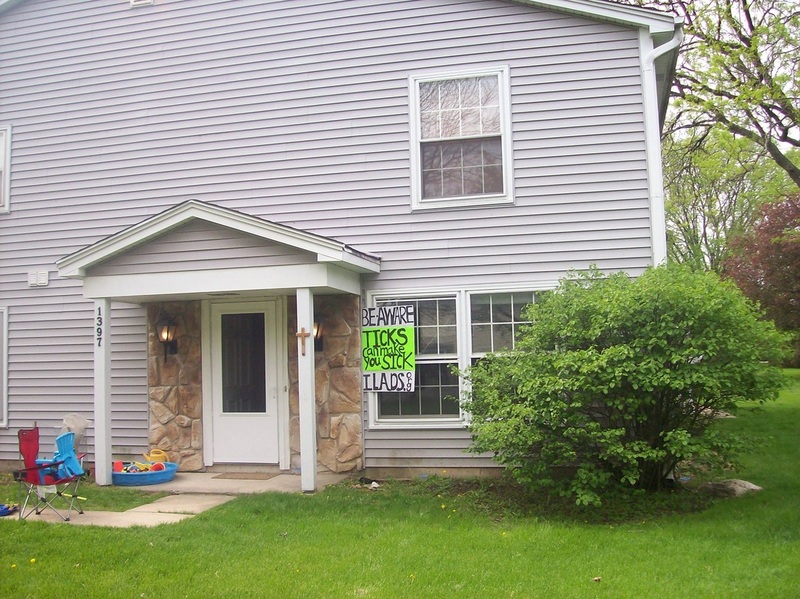 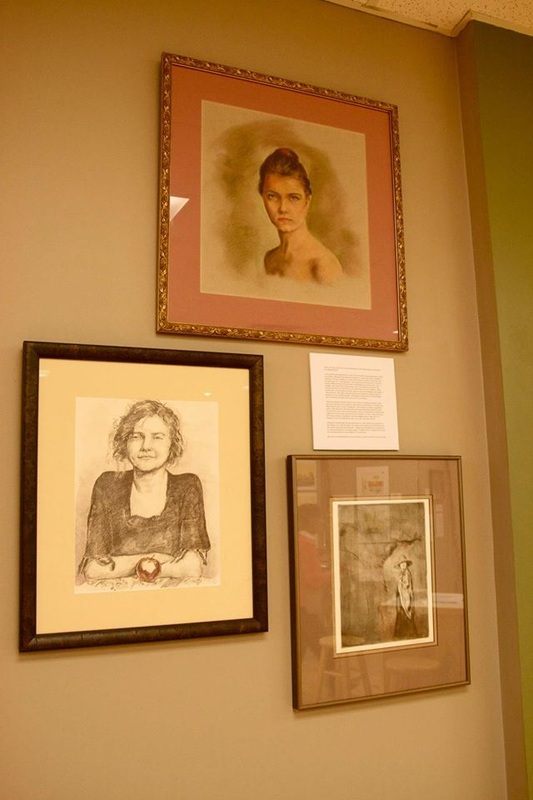 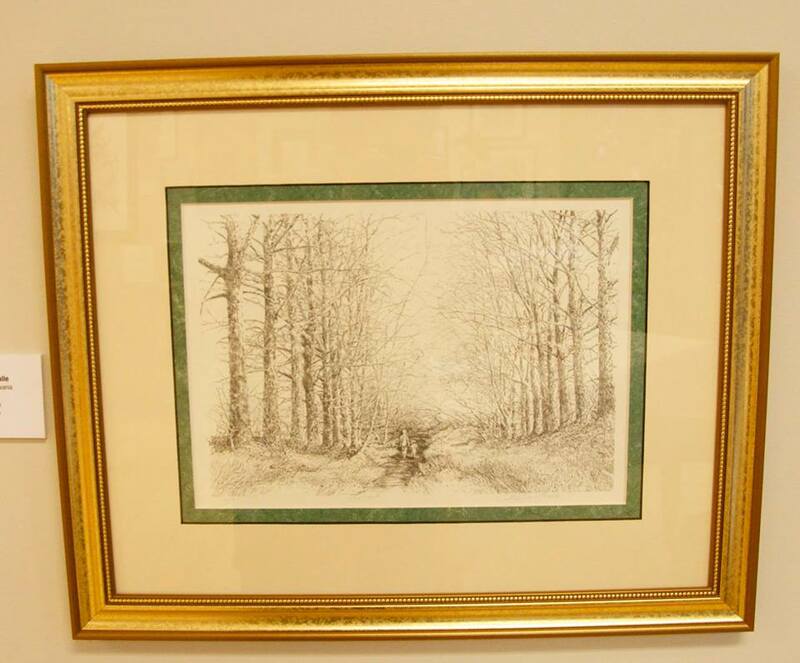 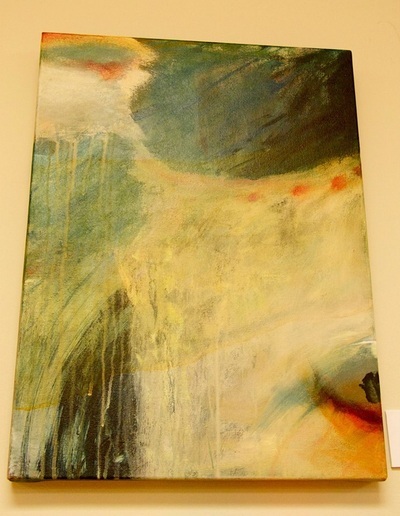 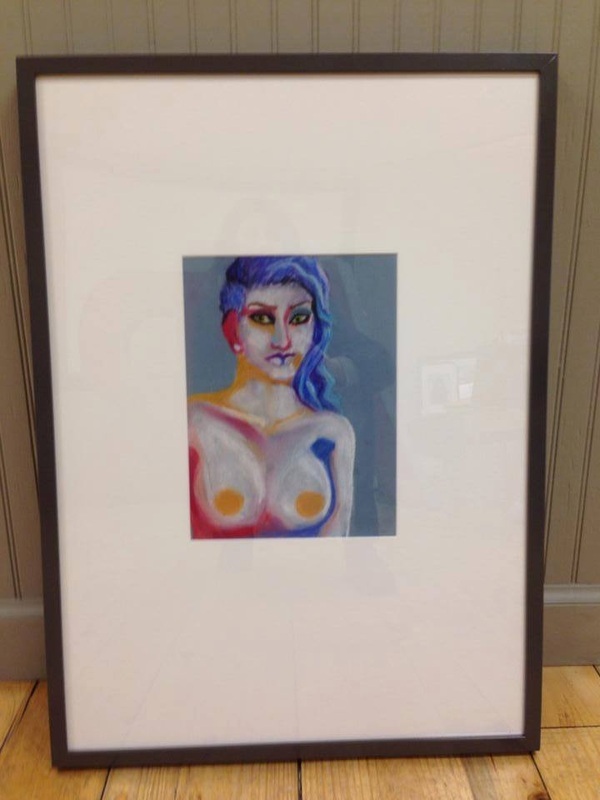 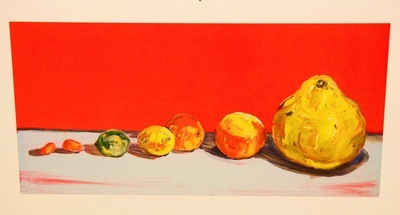 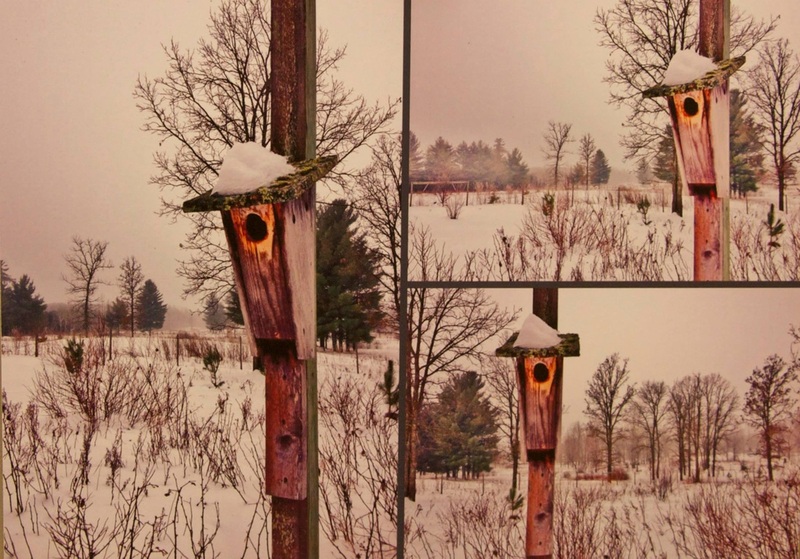 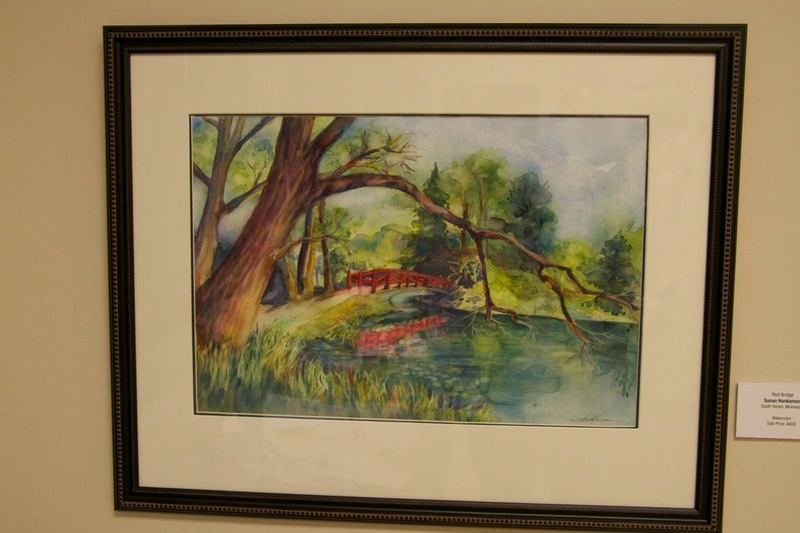 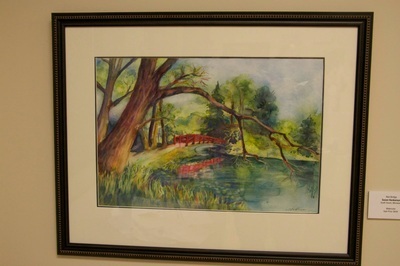 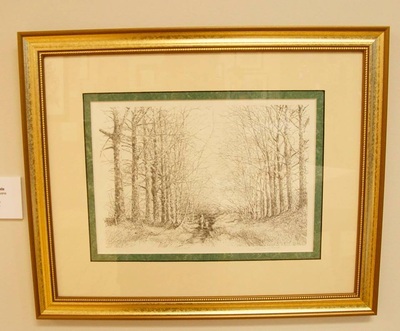 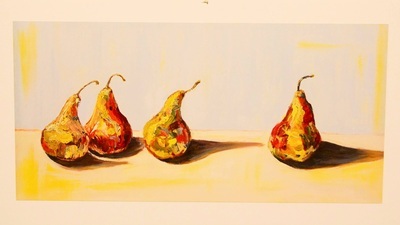 Thak you Deborah Painter for the pictures! 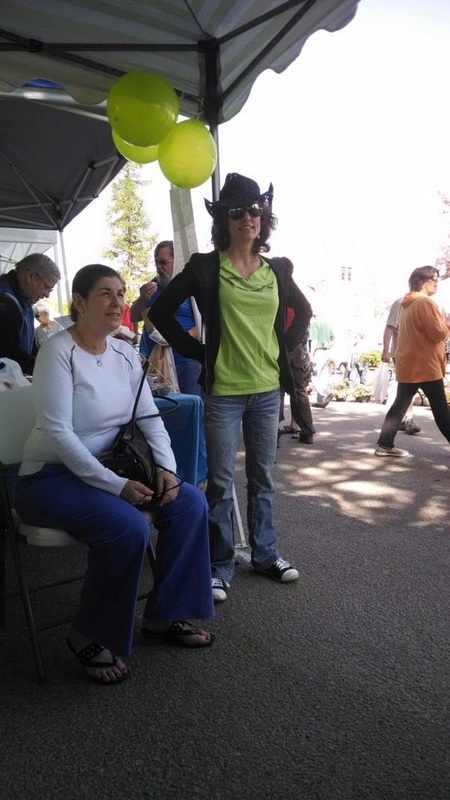 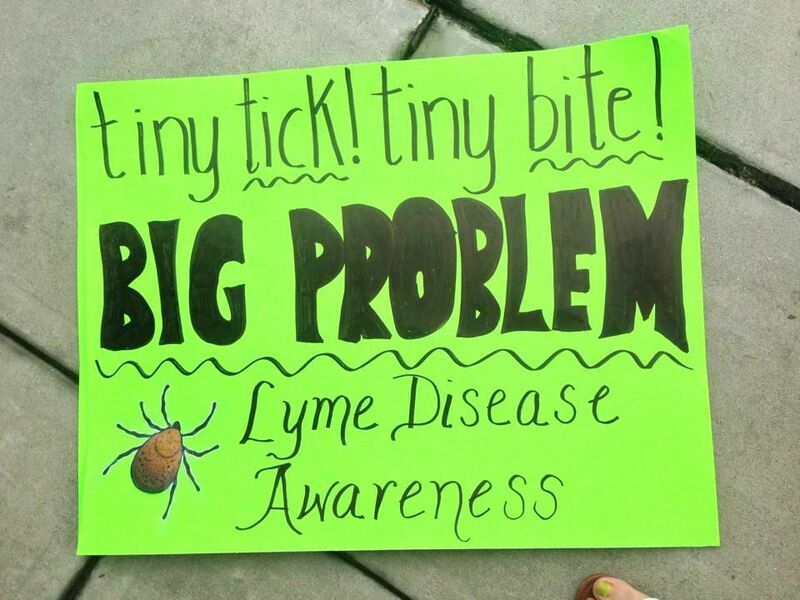 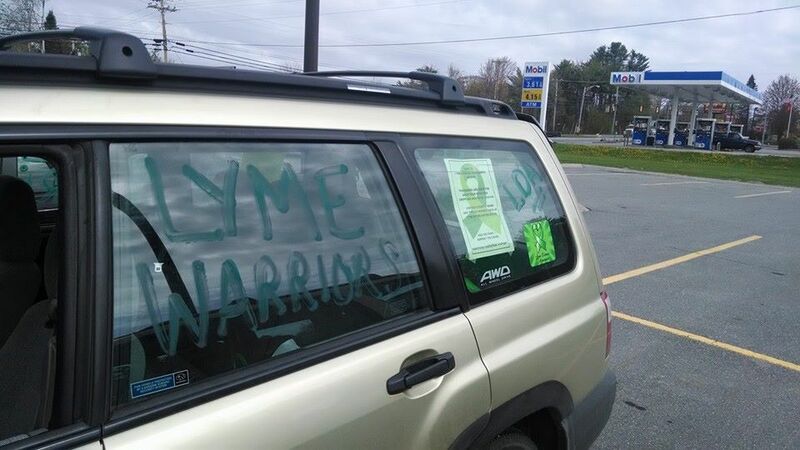 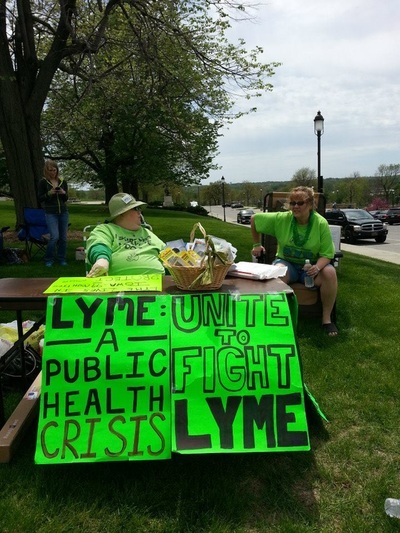 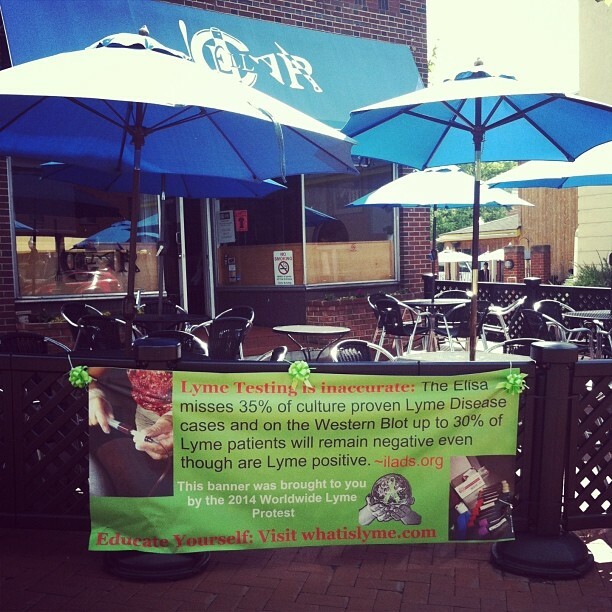 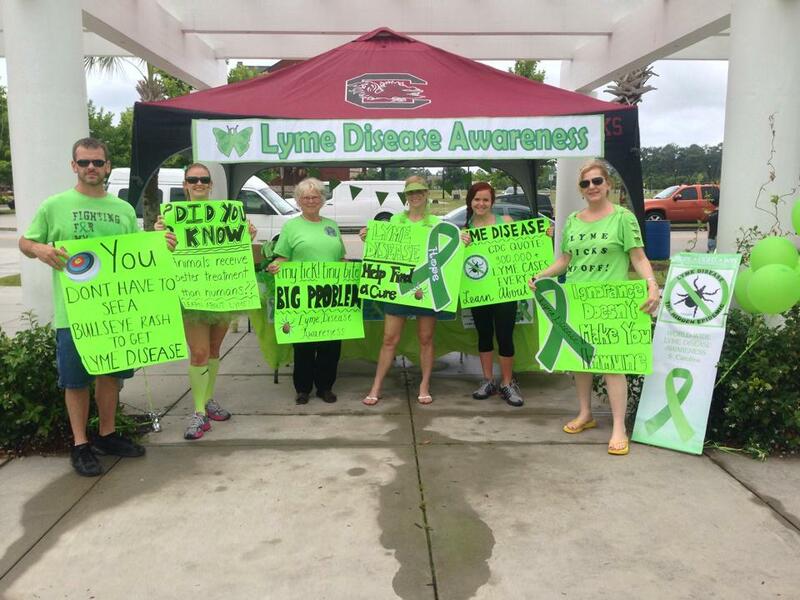 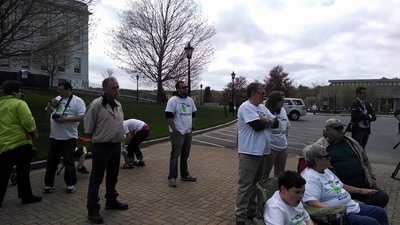 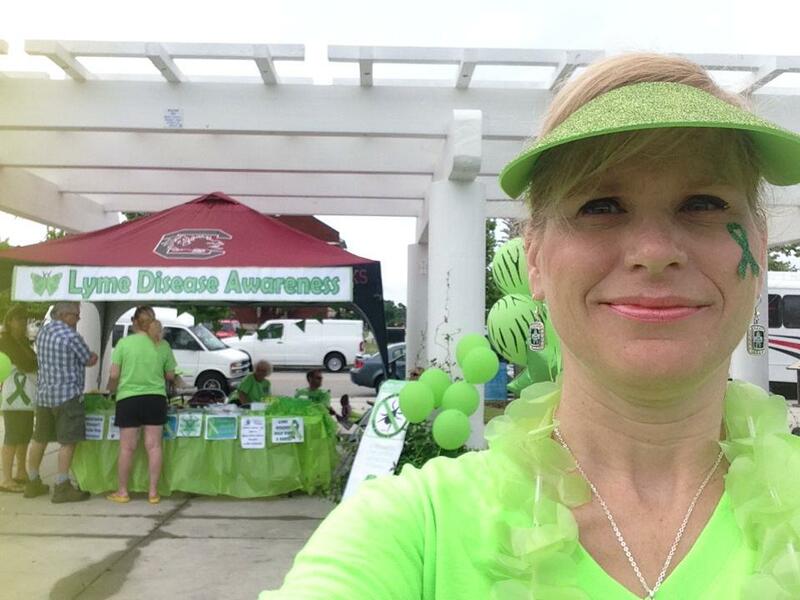 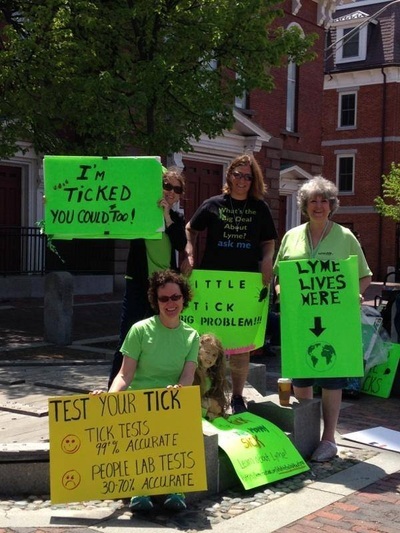 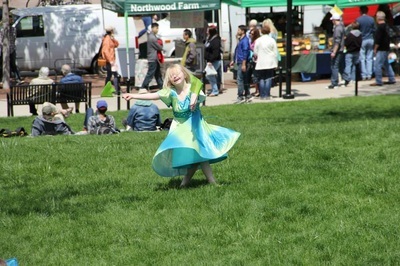 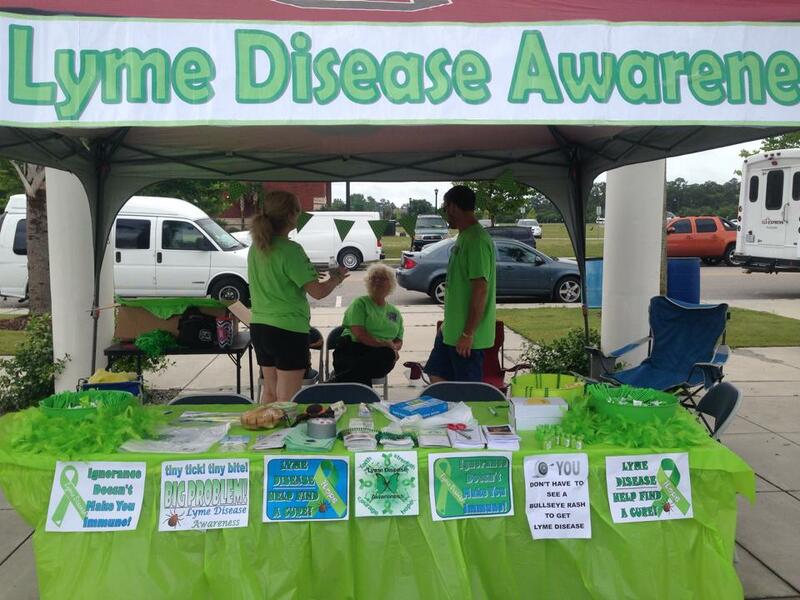 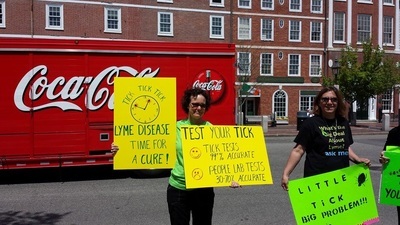 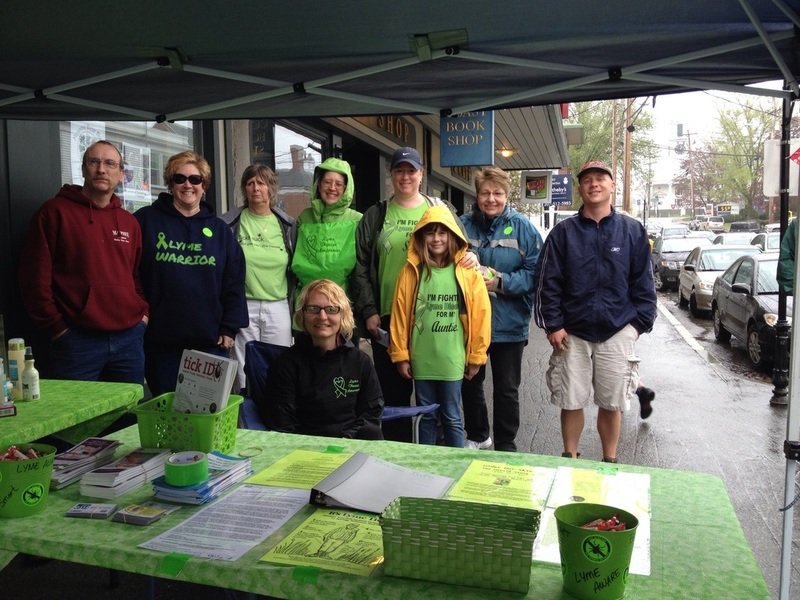 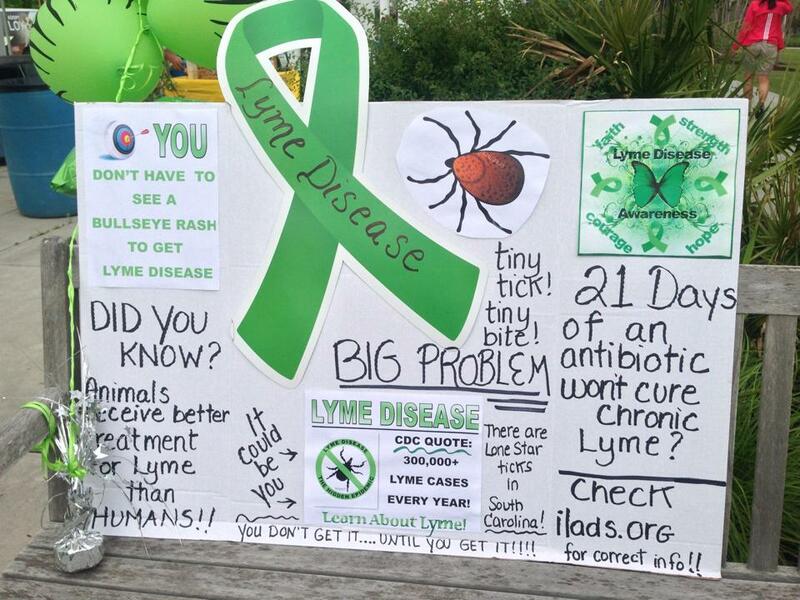 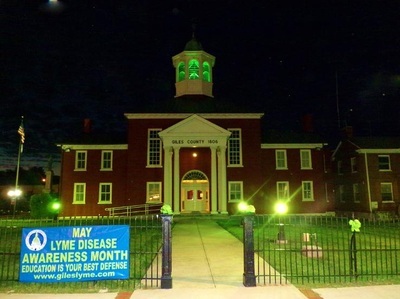 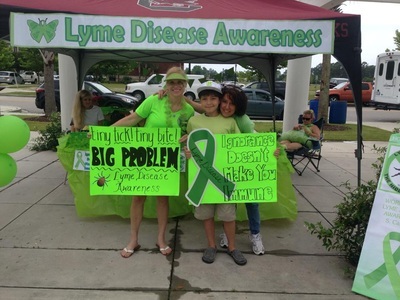 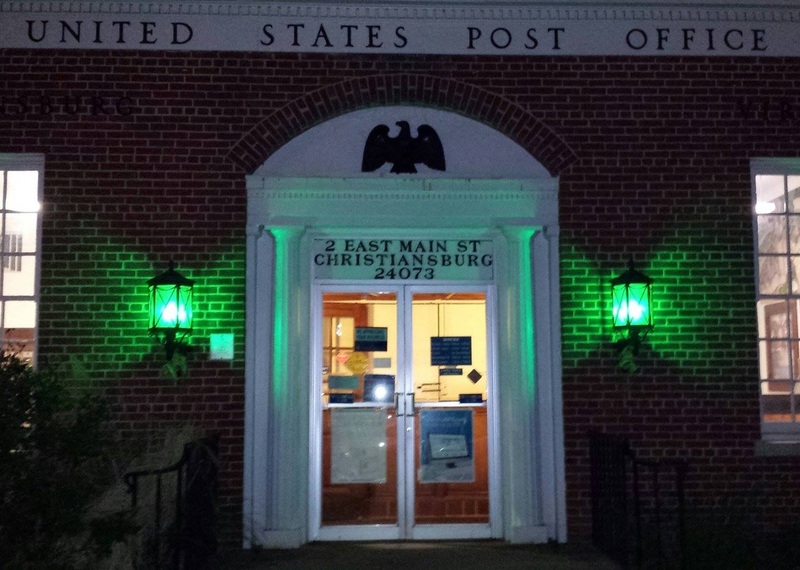 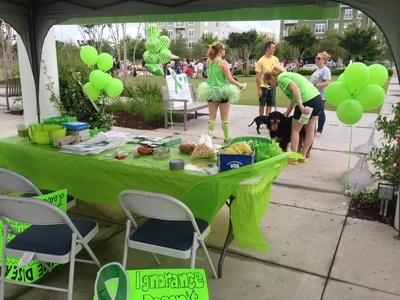 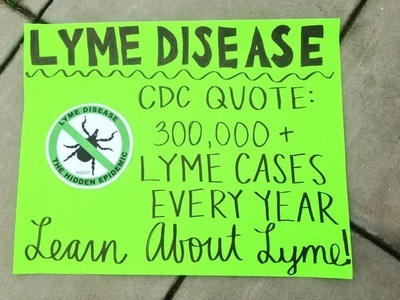 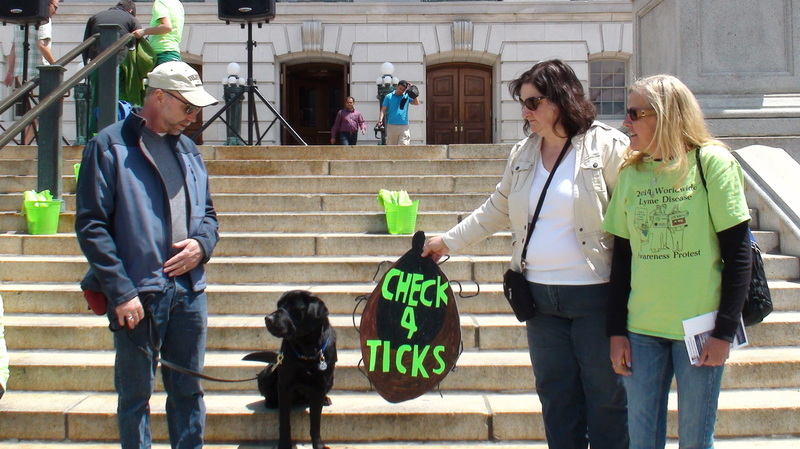 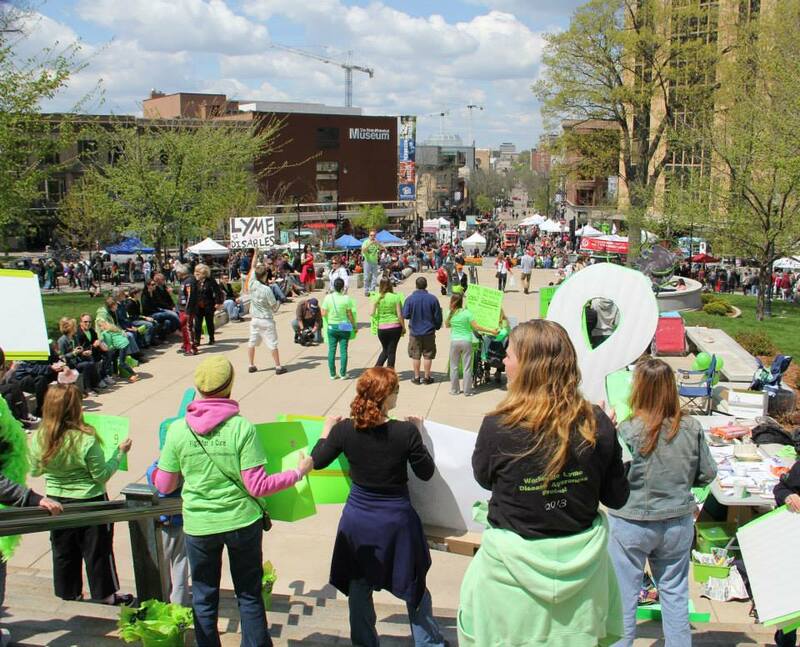 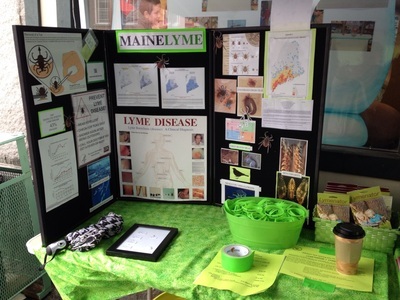 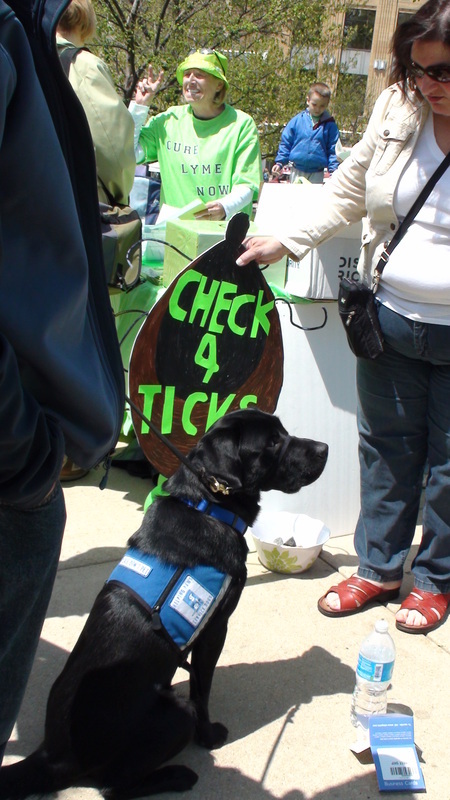 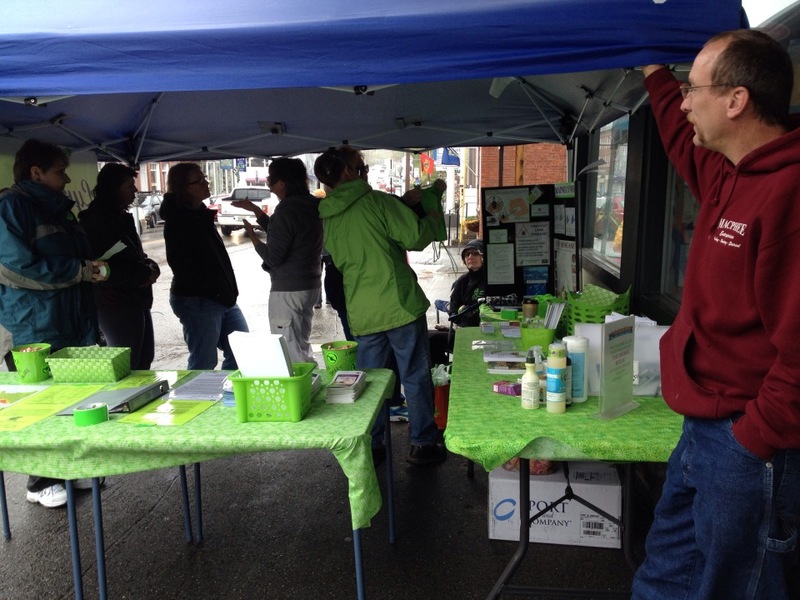 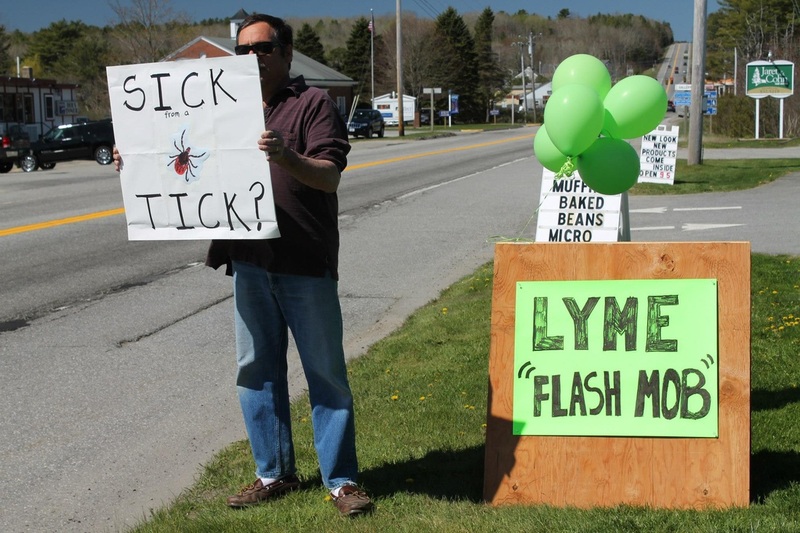 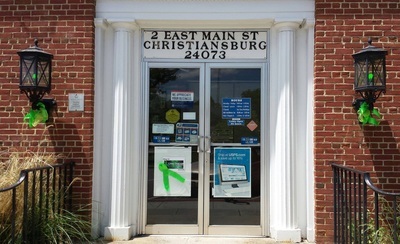 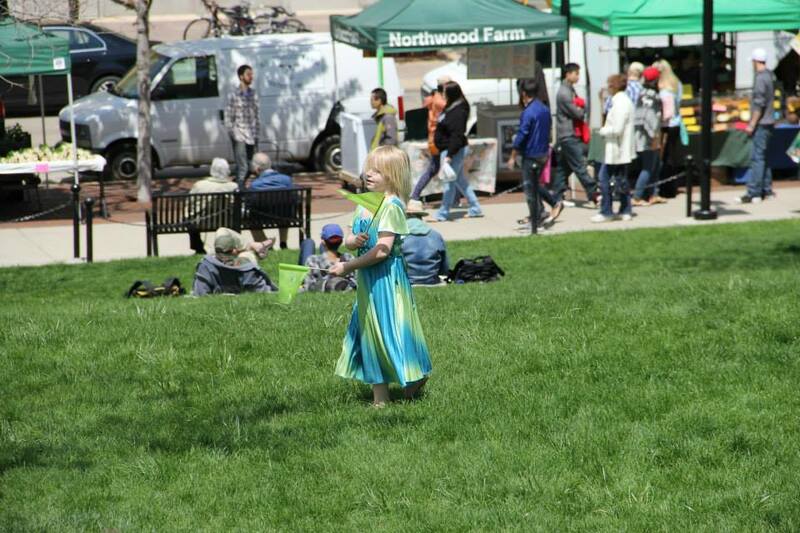 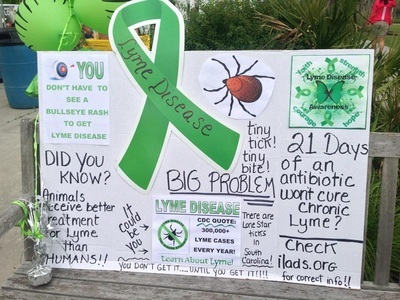 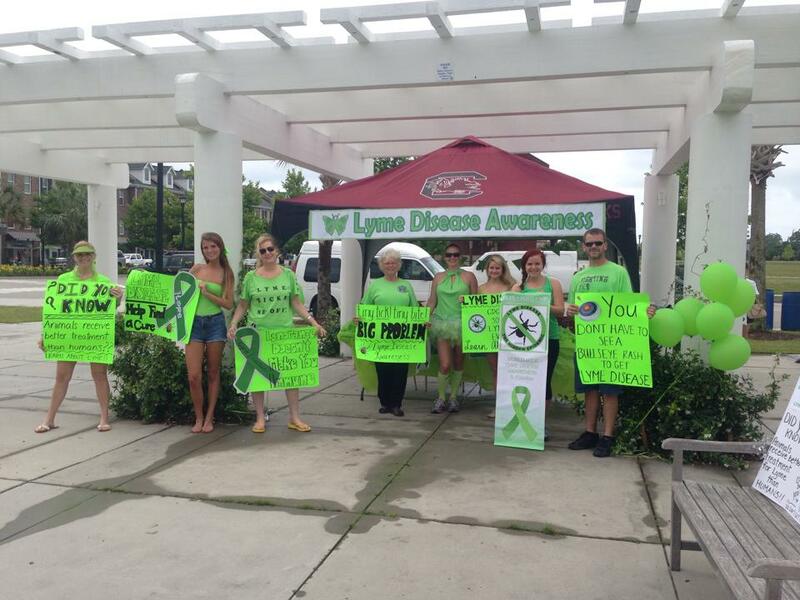 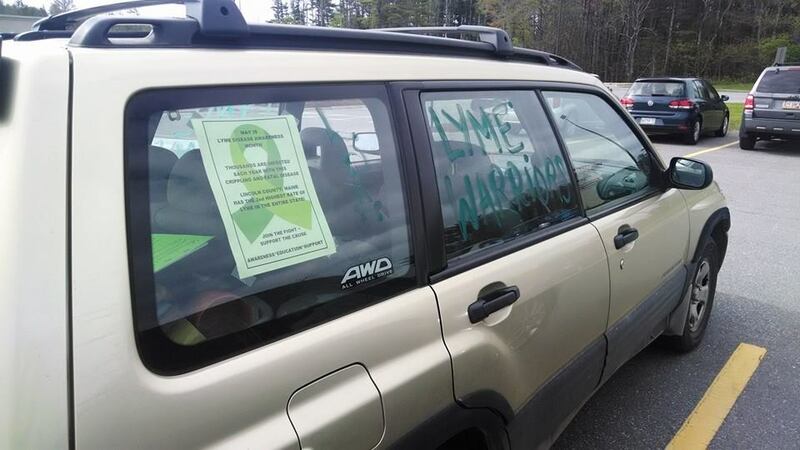 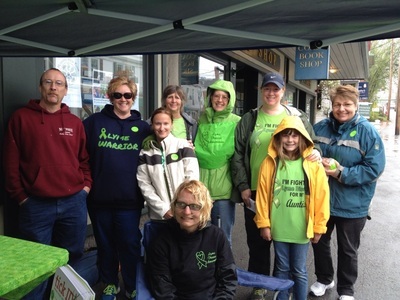 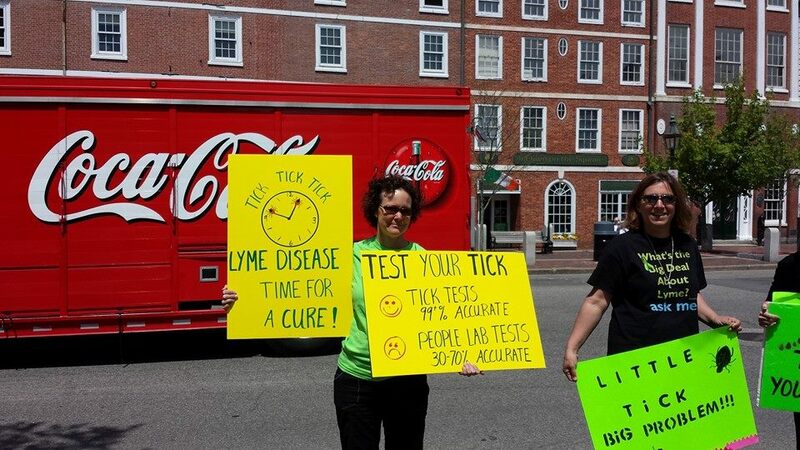 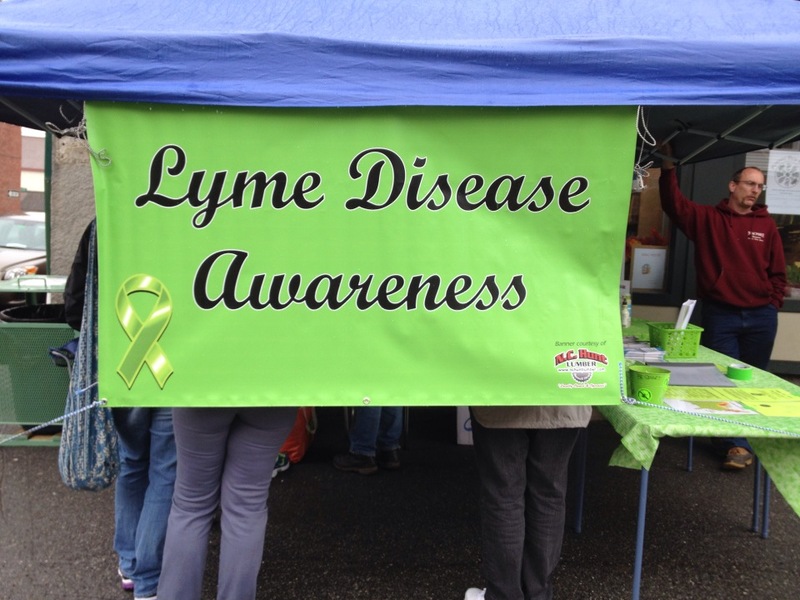 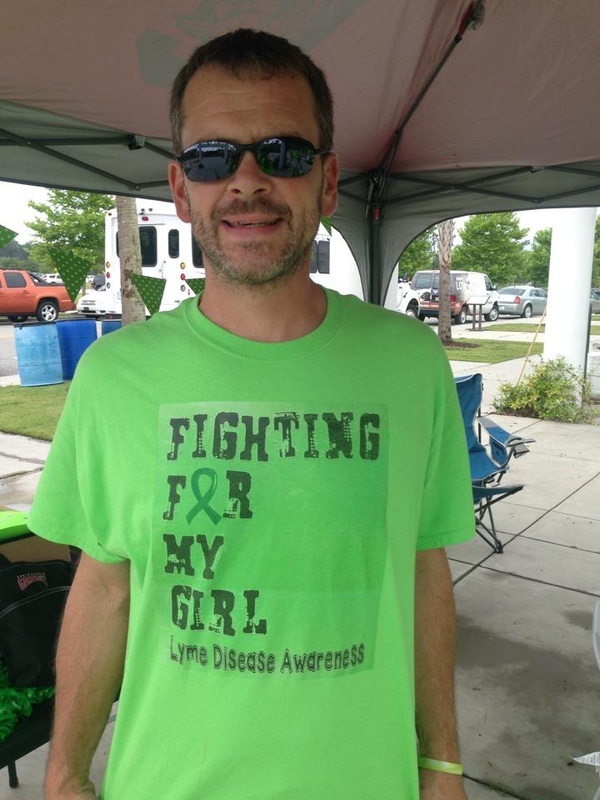 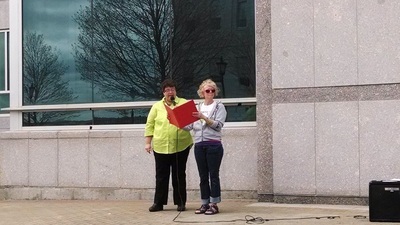 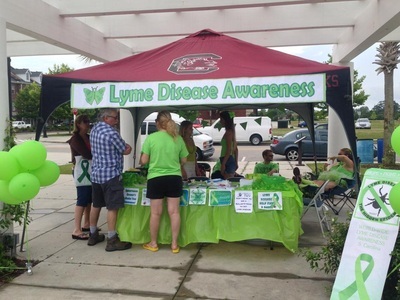 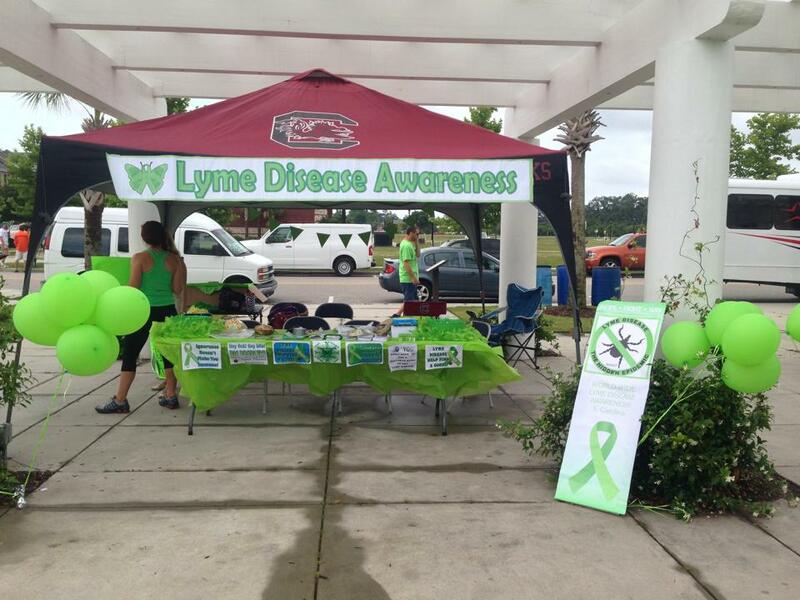 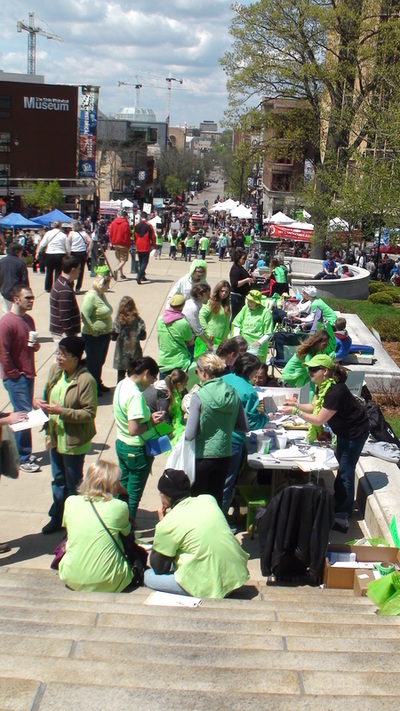 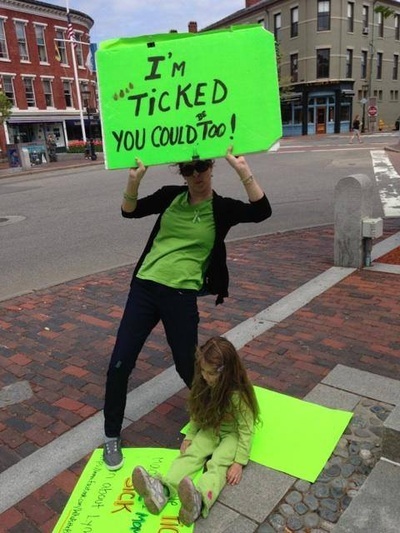 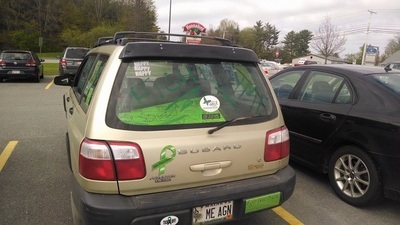 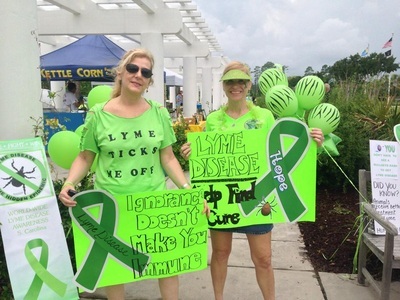 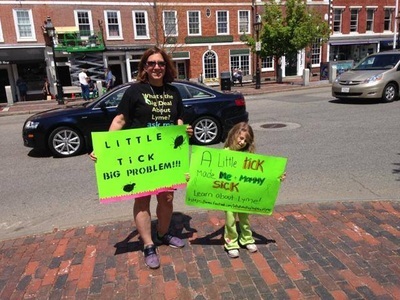 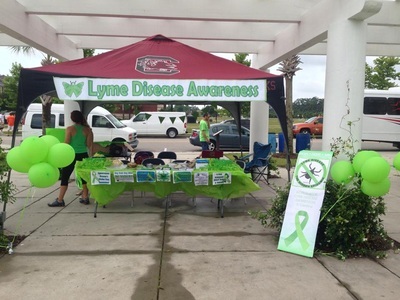 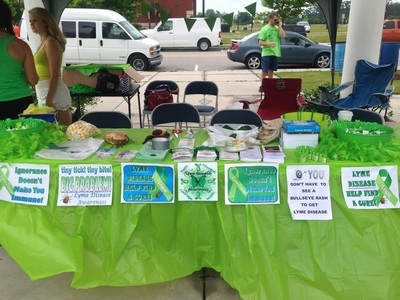 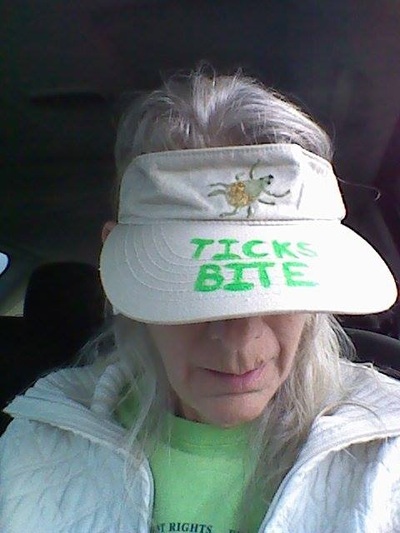 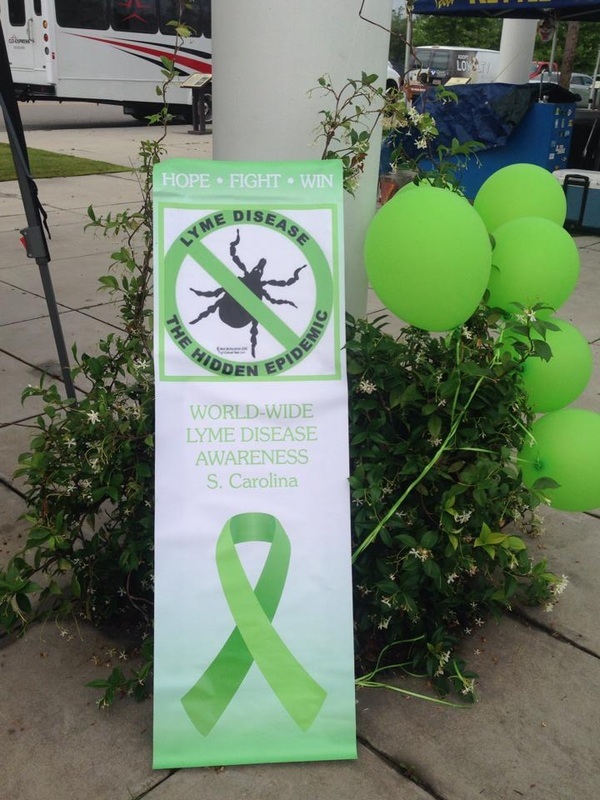 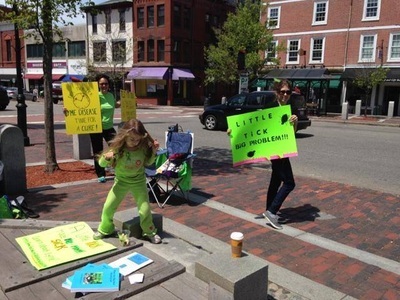 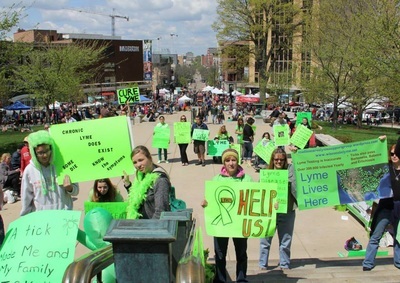 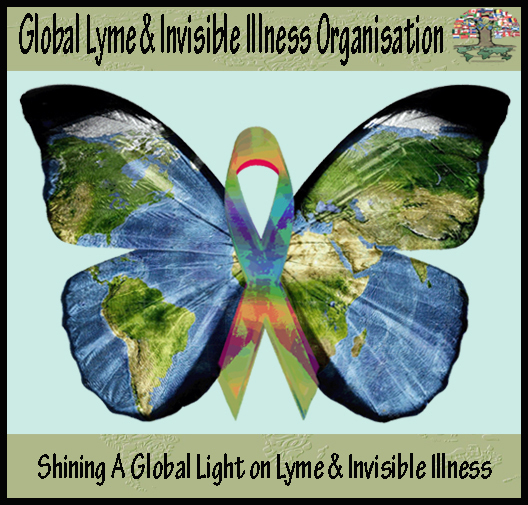 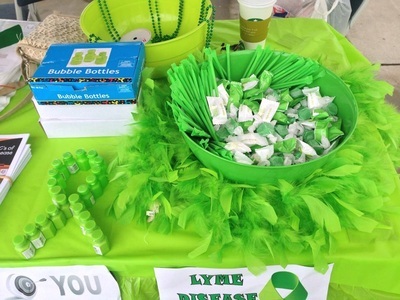 When: Saturday, May 17, 2014 11 a.m. to 2 p.m.
"What a beautifully awesome day for a Worldwide Lyme Disease Awareness Rally at the Blacksburg, Virginia Farmer’s Market on Saturday, May 17, 2014! 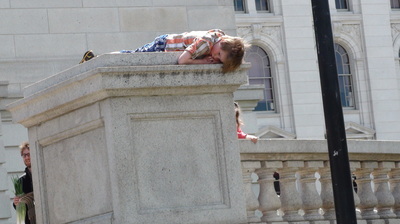 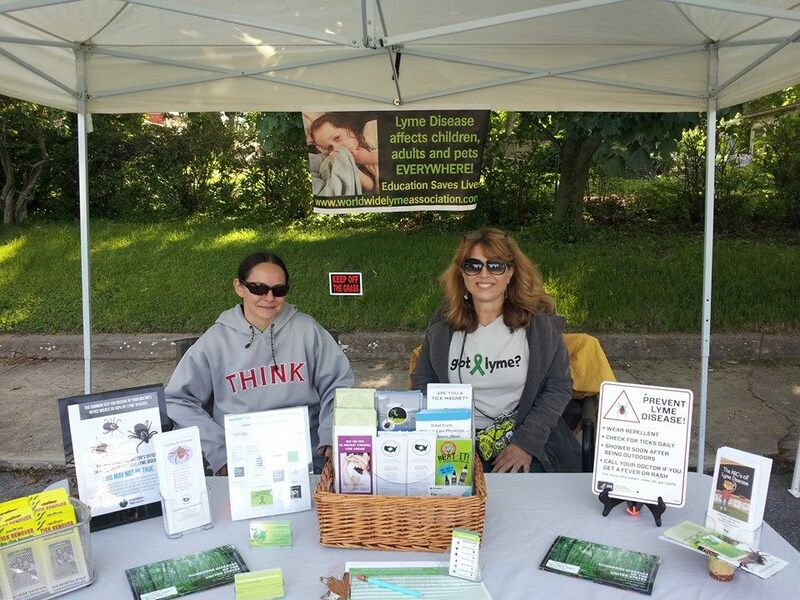 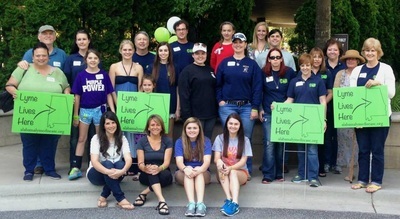 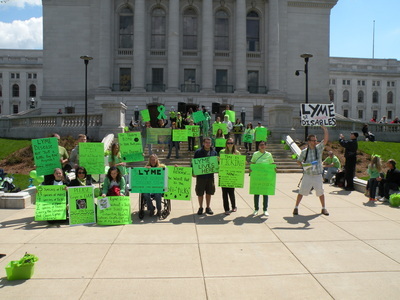 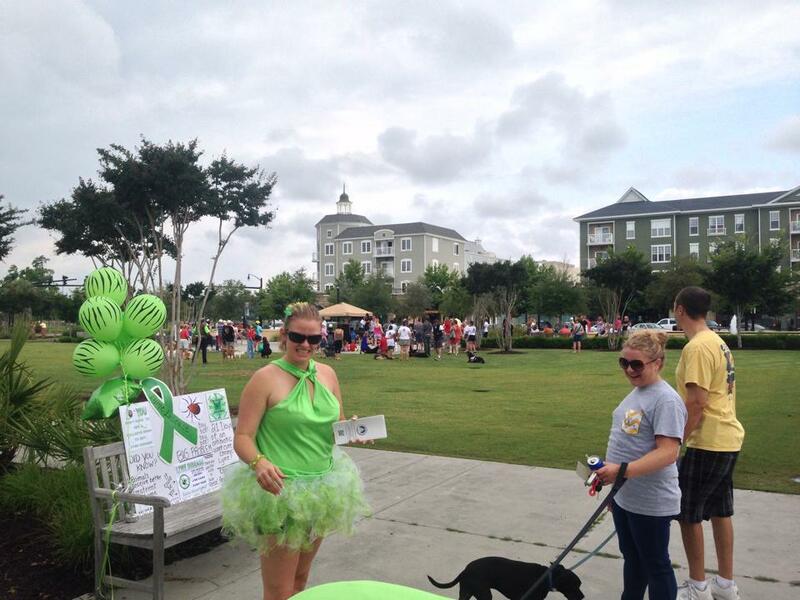 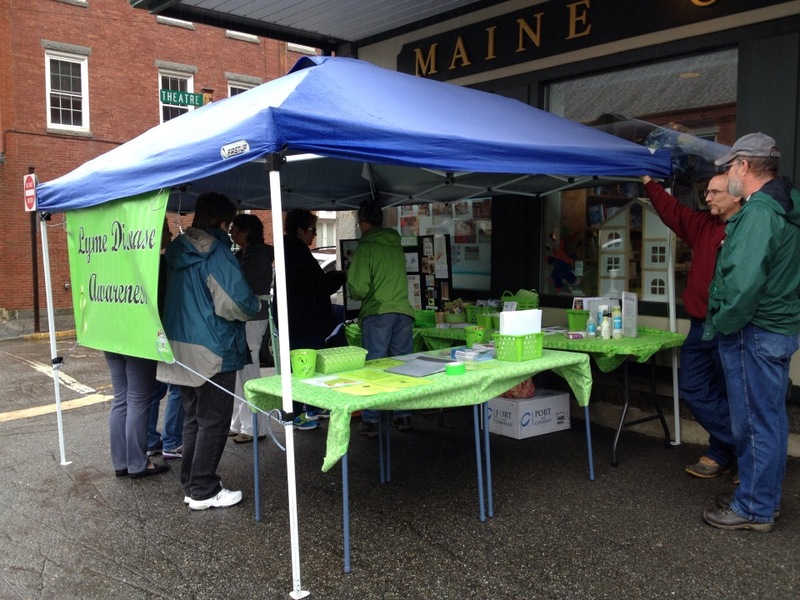 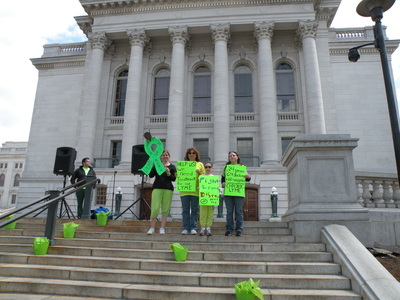 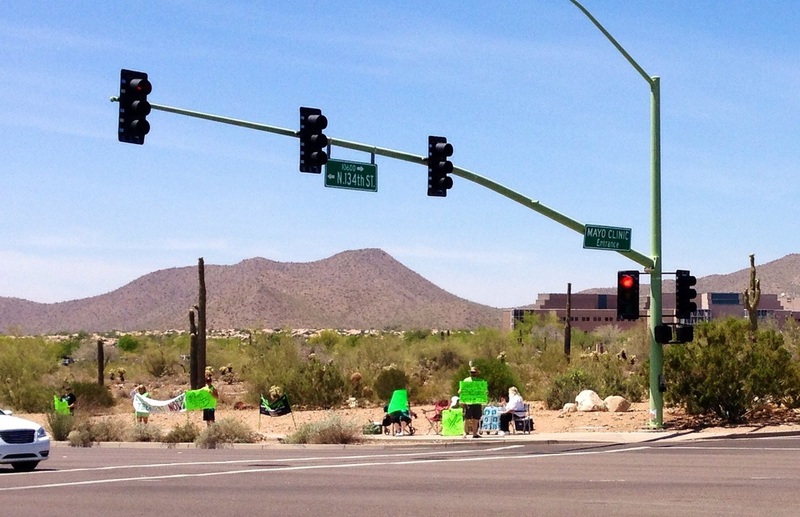 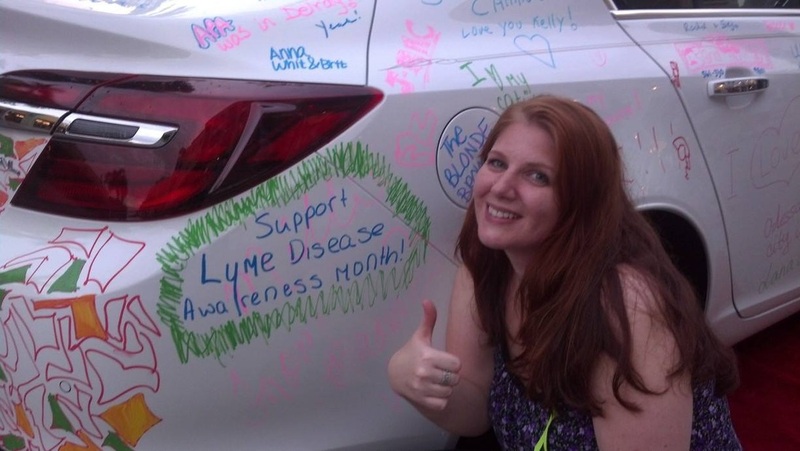 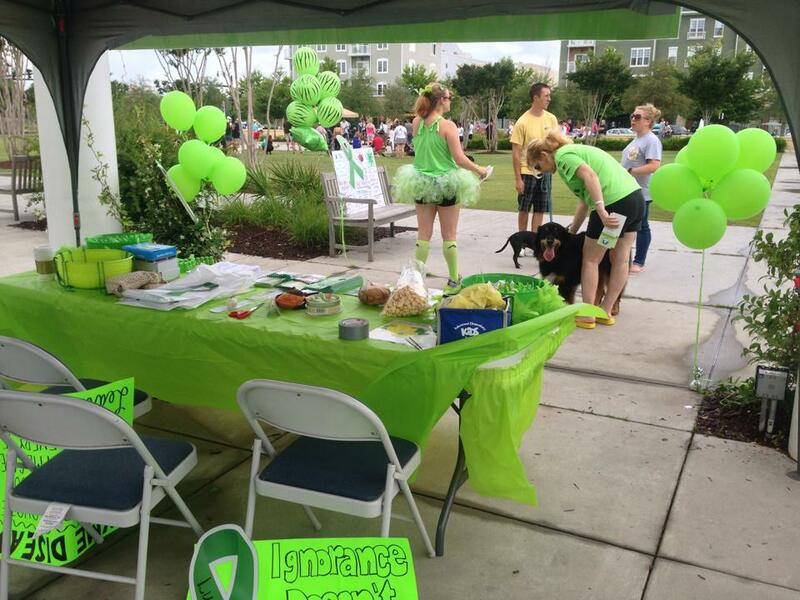 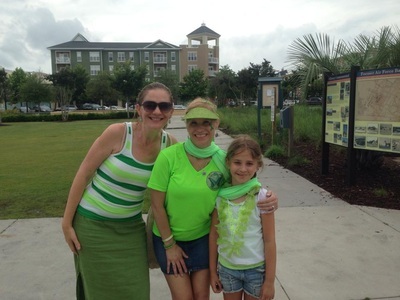 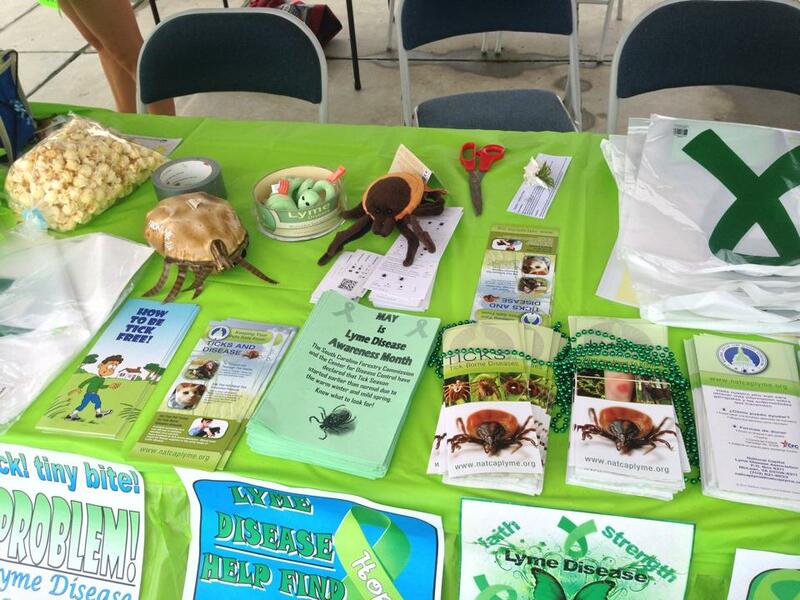 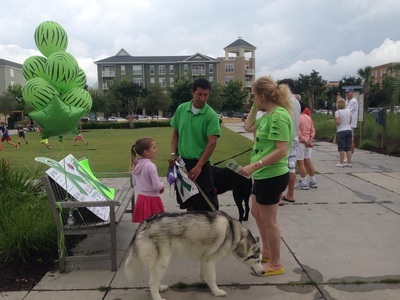 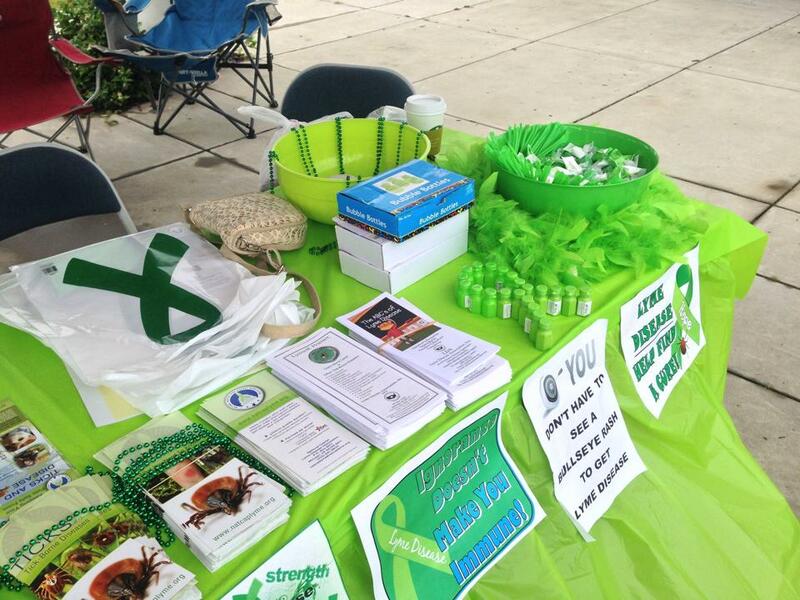 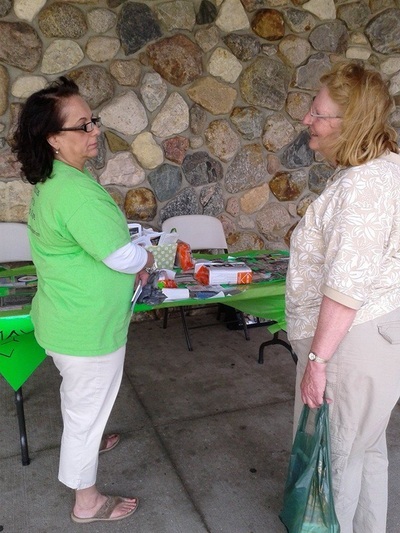 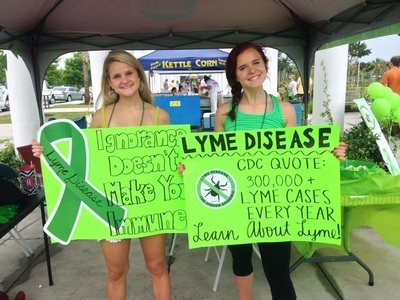 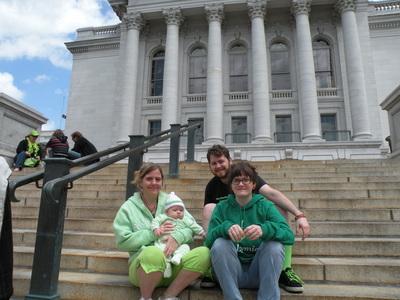 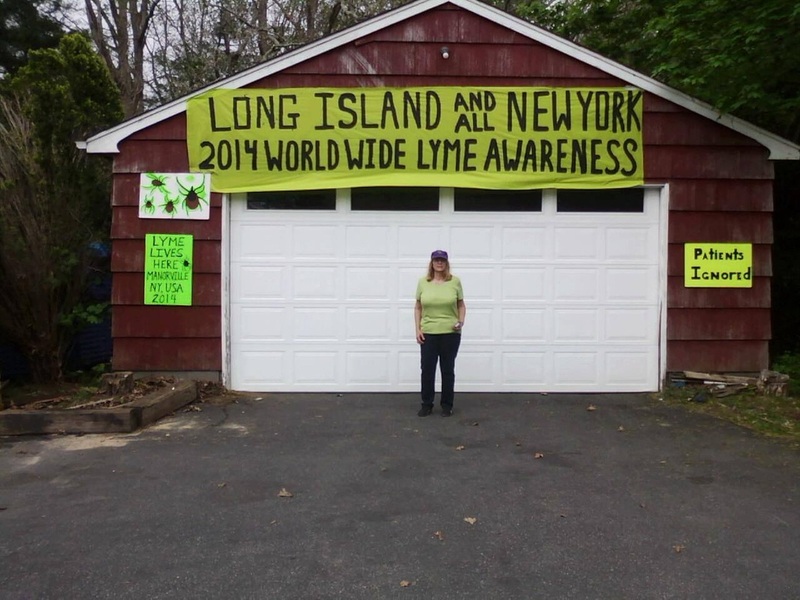 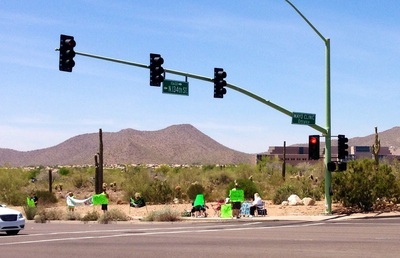 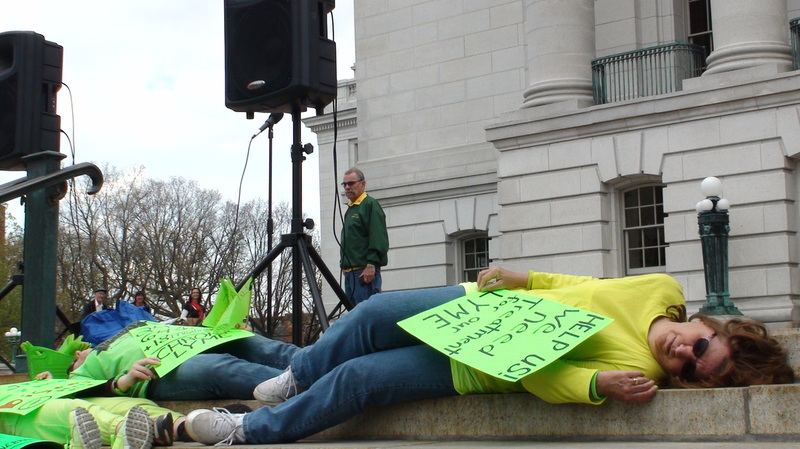 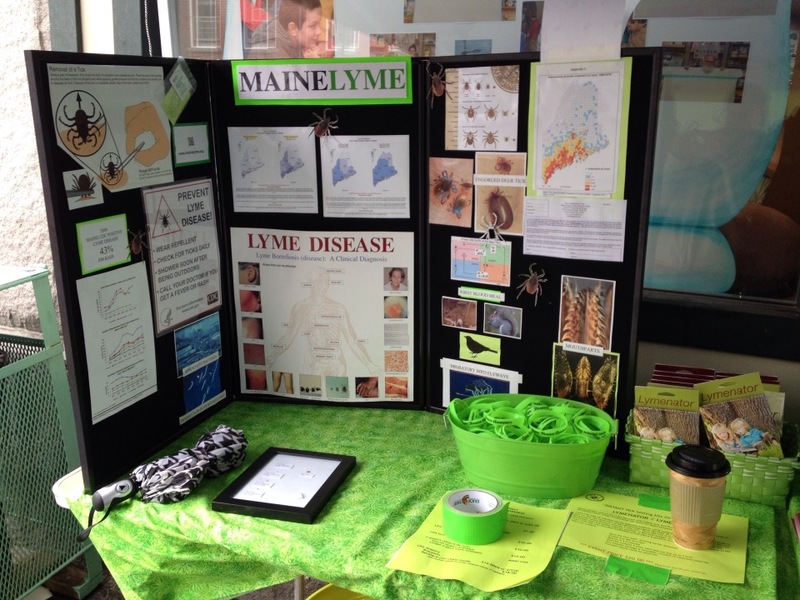 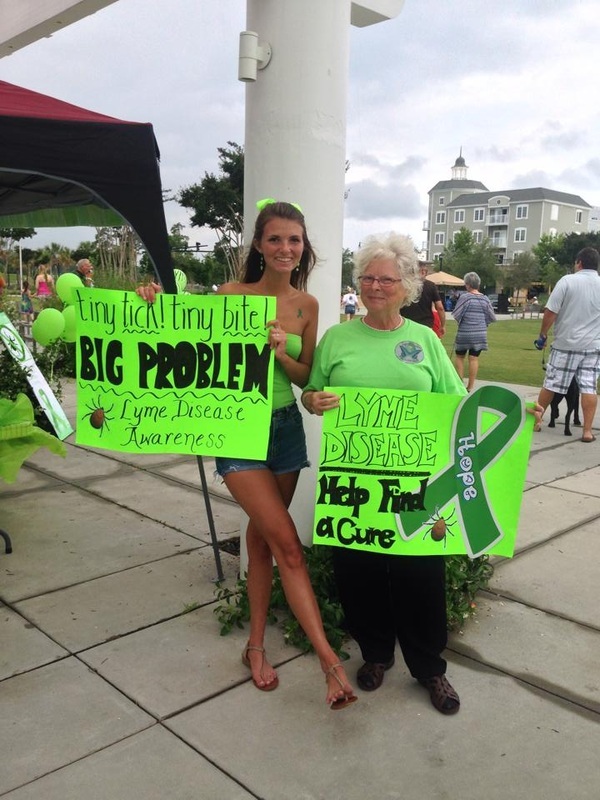 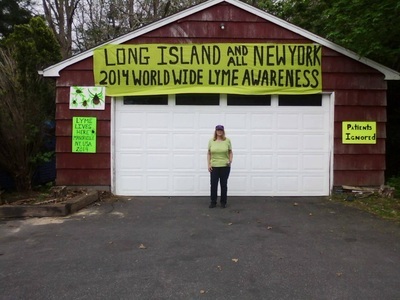 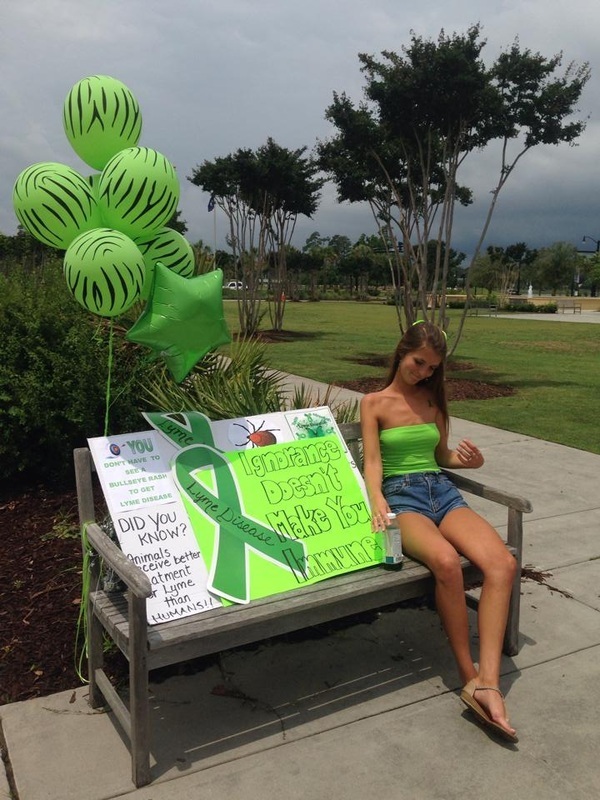 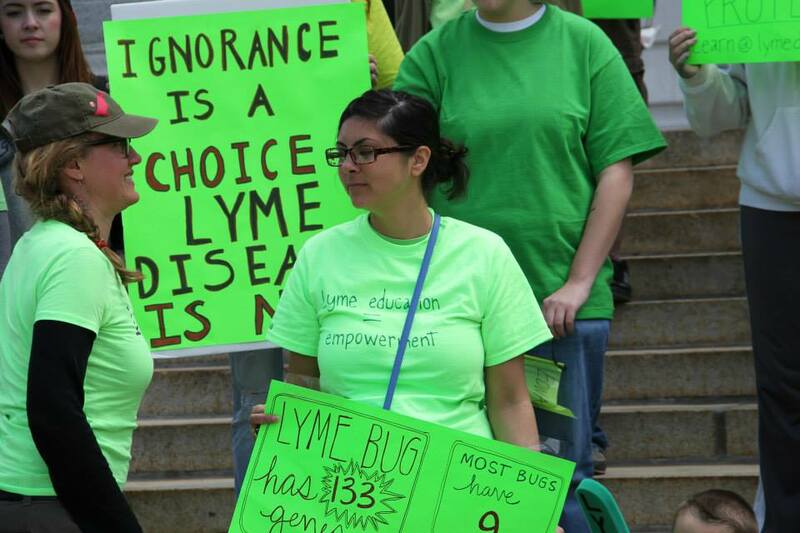 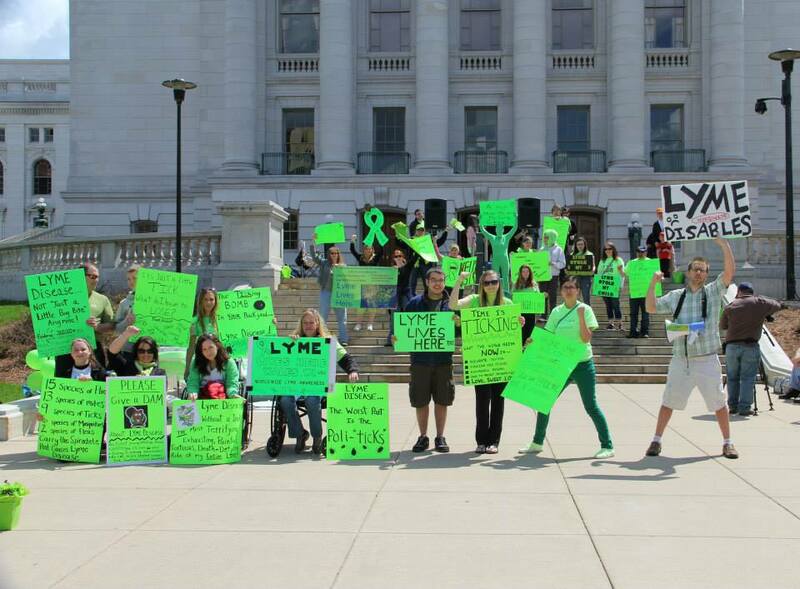 An amazingly successful day of Lyme awareness! 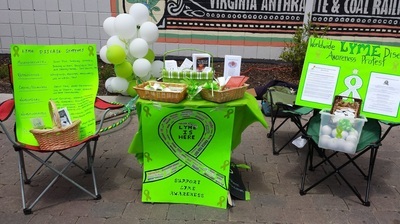 The Burgs newspaper article and mention on WSLS news of our event coupled with Virginia Tech graduation festivities this weekend sure made our event a hit downtown! 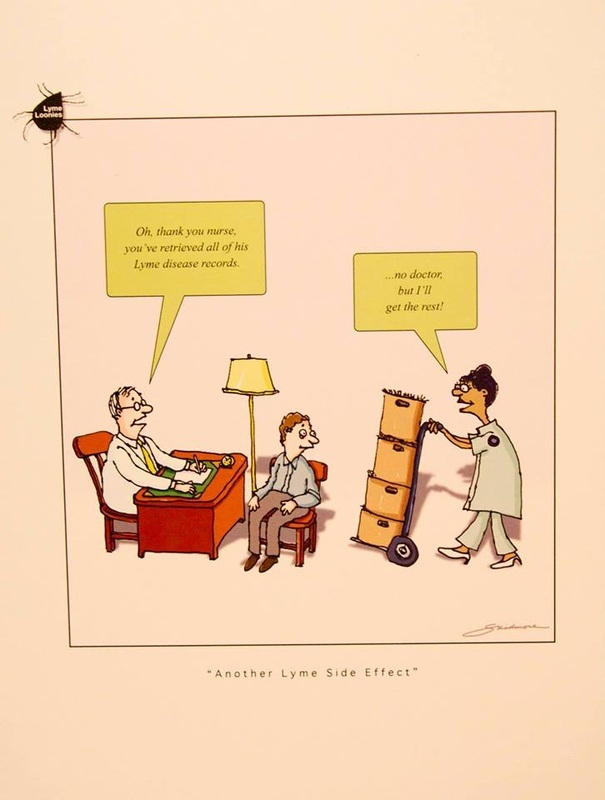 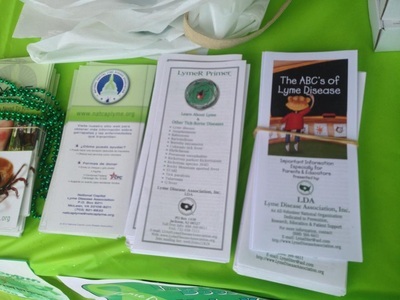 Gratitude to ILADS, LDA, and National Cap Lyme for your informative brochures. The LDA tick id cards were popular, and very helpful for answering questions on how to properly remove a tick and identify it. 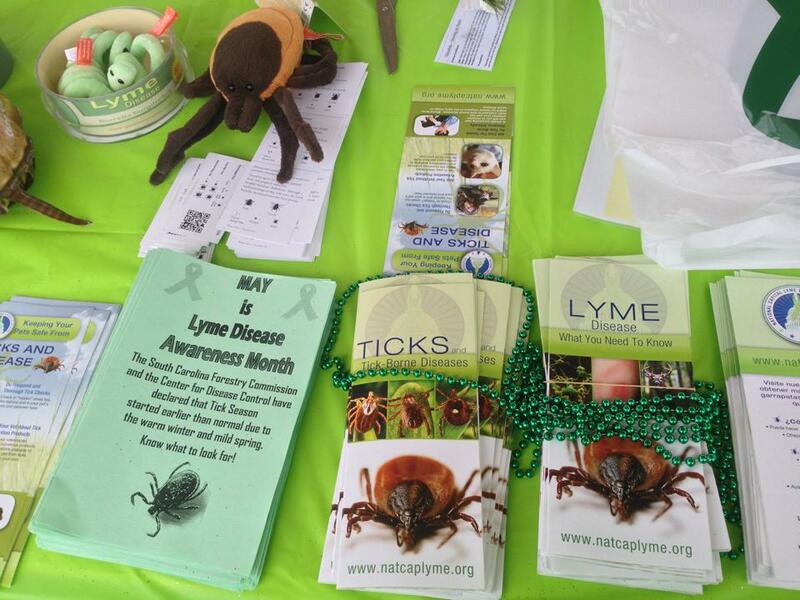 What a joy to share these cards with farmer’s market vendors too, who encounter ticks regularly. 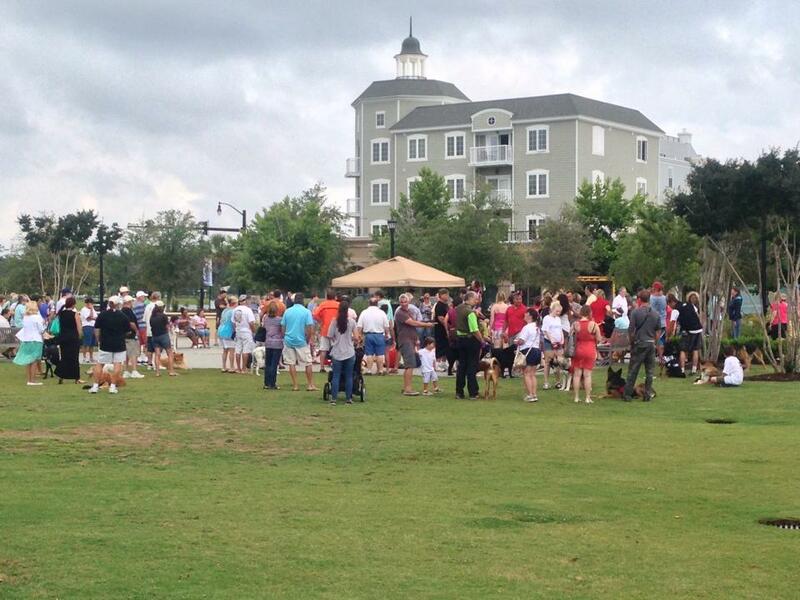 People wanted to know more about tick prevention naturally. 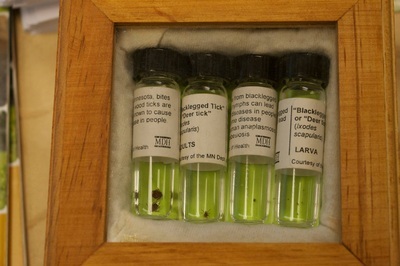 Bird Song Farm vendor was fully stocked on Don’t Bug Me! 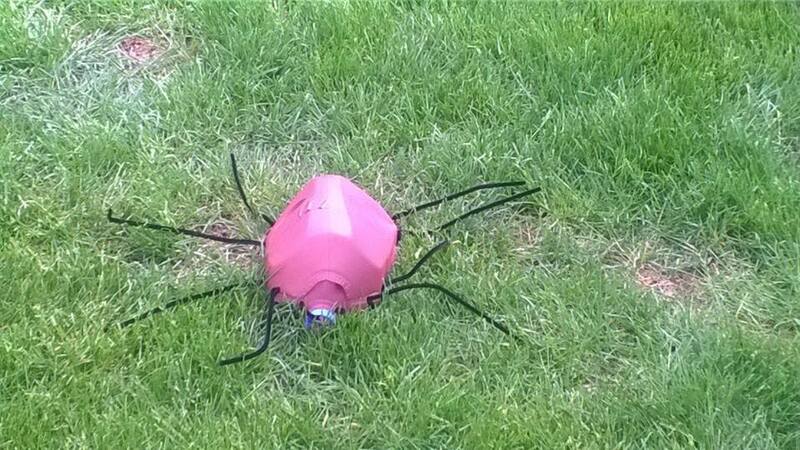 natural insect repellent and made some new customers. 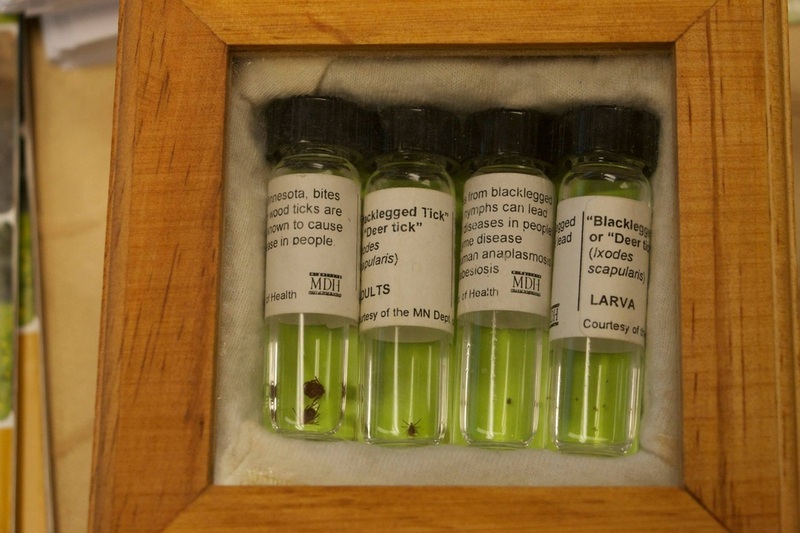 Most popular question - What to do with a tick once removed and where to send it? Thanks to Affiniton for donating Lymenator & Lymealyzer tick testing kit cards, as this answered this question effectively. A most gracious thank you to Mary Lisk for her generous and kind donation of Lyme awareness balloons, pens, pencils, stress balls, stickers, bracelets, and buttons! Kids loved the balloons! 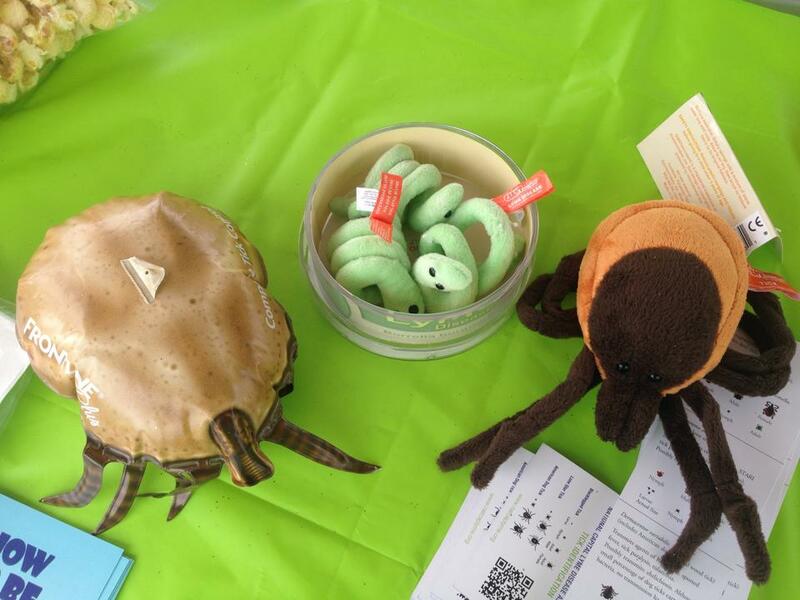 These fun goodies made our event interactively awesome and a smashing success! 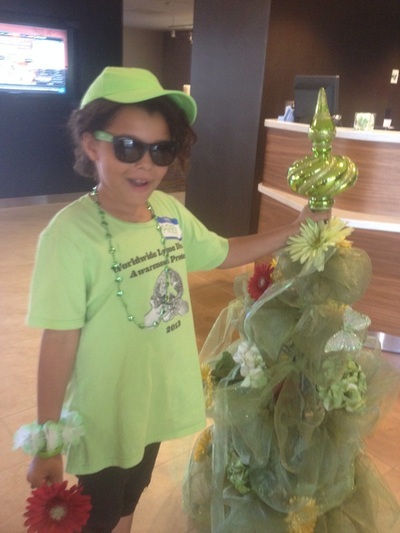 Thank you to both our Kroger locations in town for your donation of helium. Lovely and inspiring to meet and hear new Lyme warrior stories! 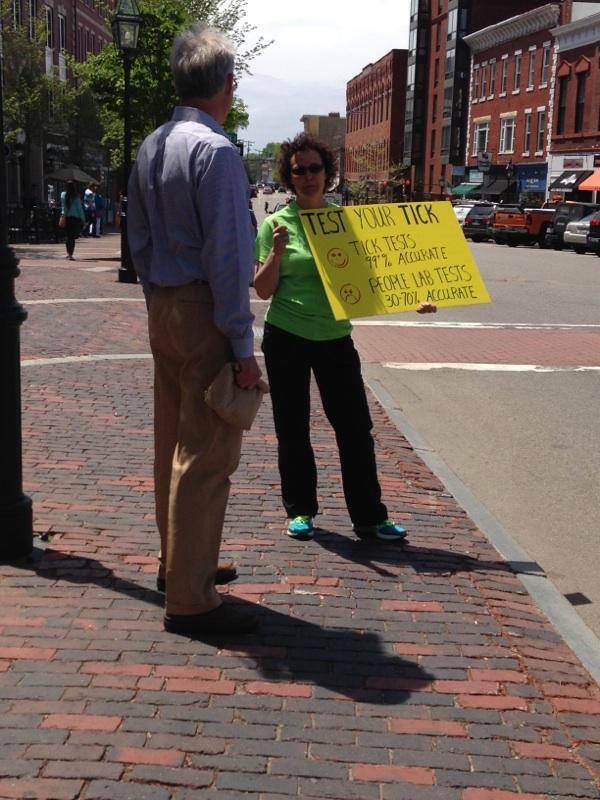 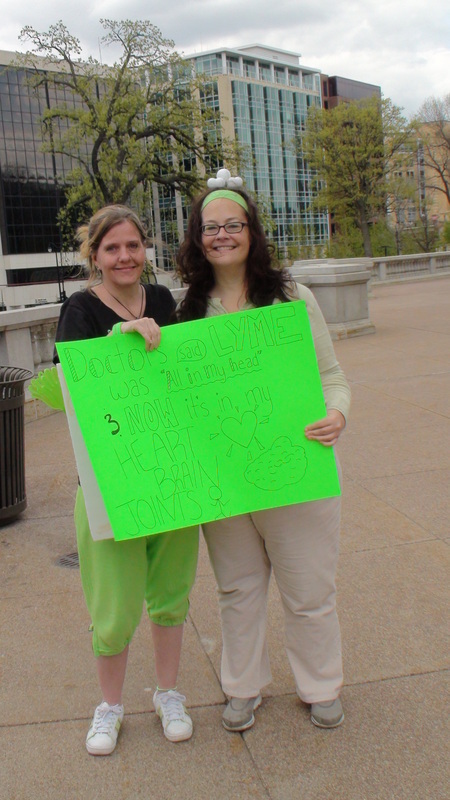 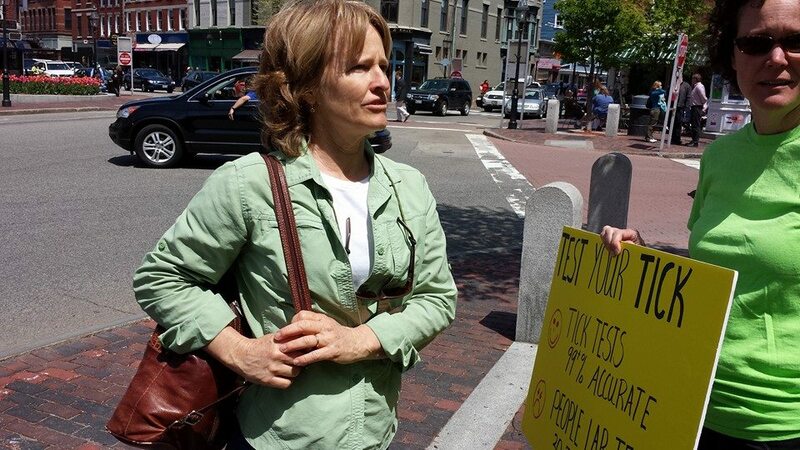 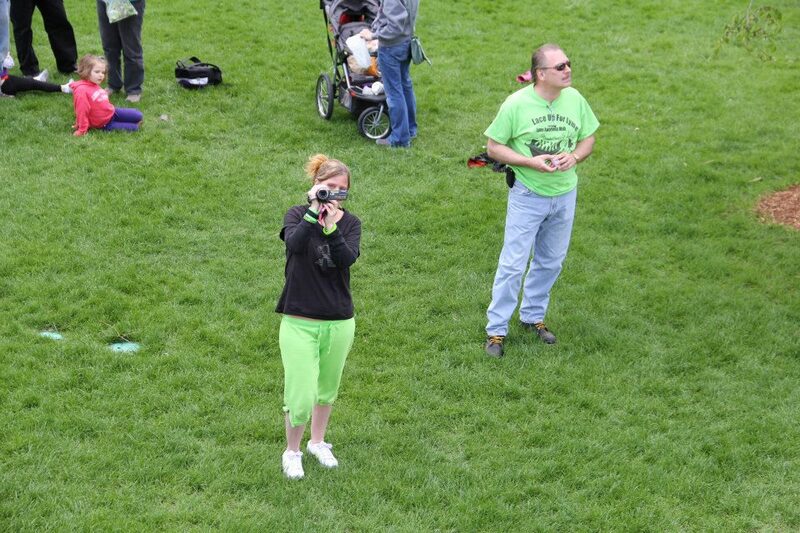 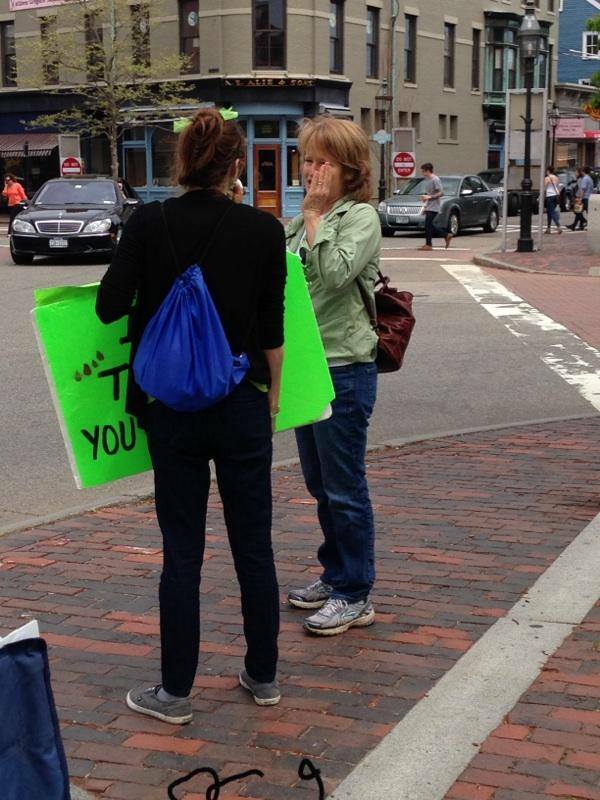 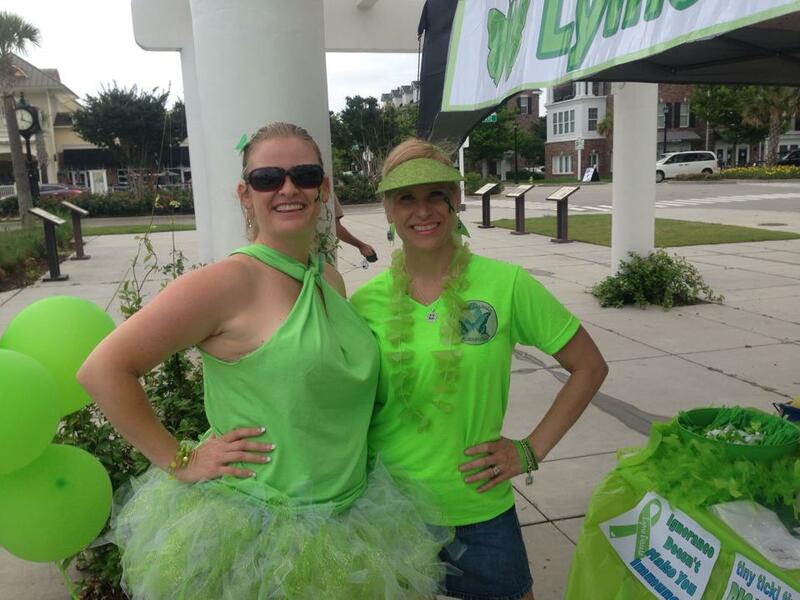 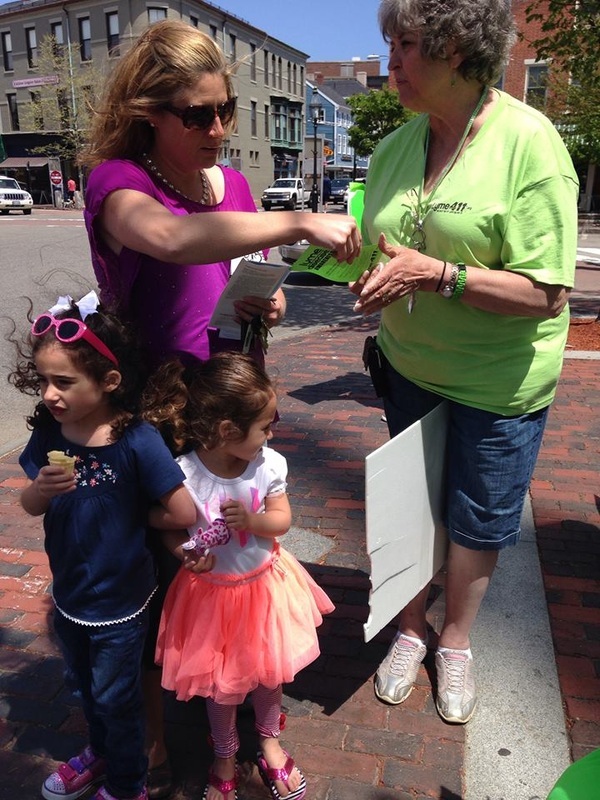 Abundant cheers of thanks to Lynn Price for helping me put this event together and share Lyme awareness all day! 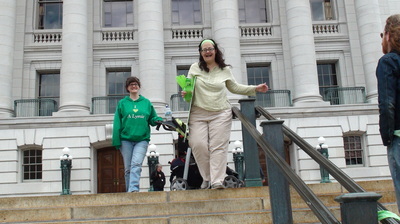 We met at this event last year, bonded over Lyme, and have become the best of friends. 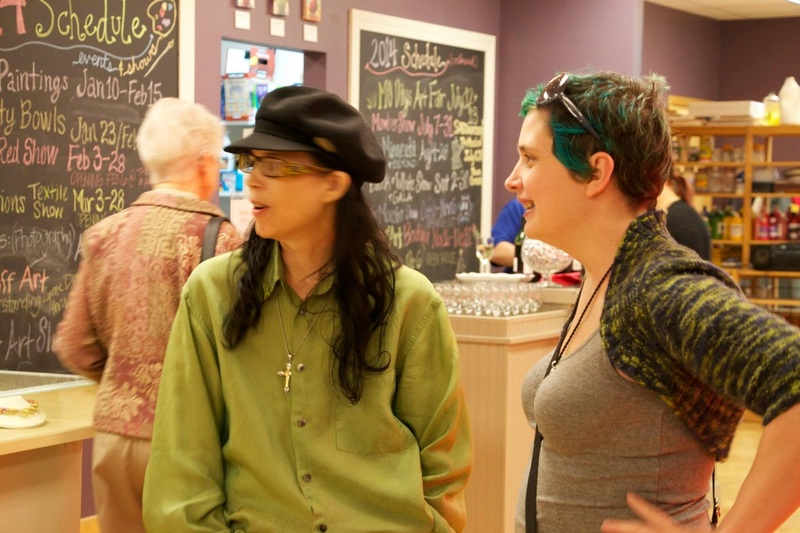 Gratitude to my healer Violet Kraft for her uplifting energy and helpful support at the event all day. 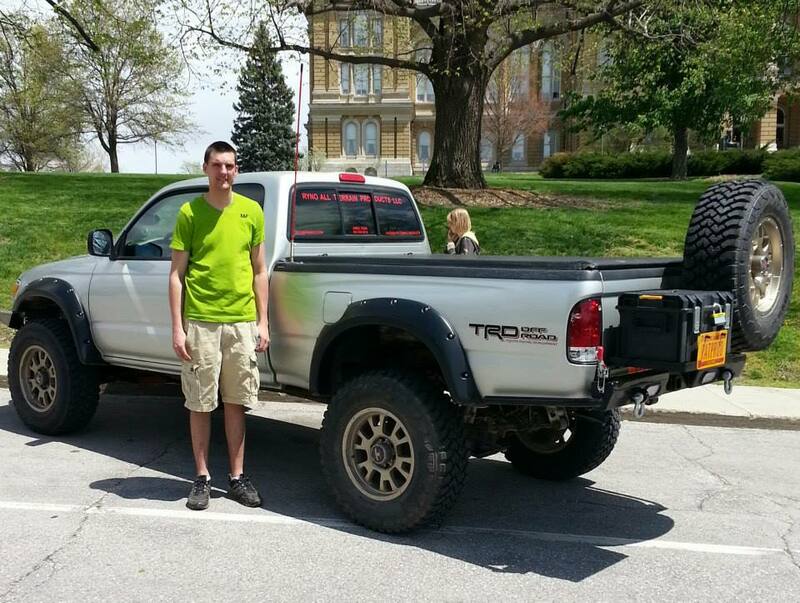 Thank you Ryan Senger for taking pictures and so much more! 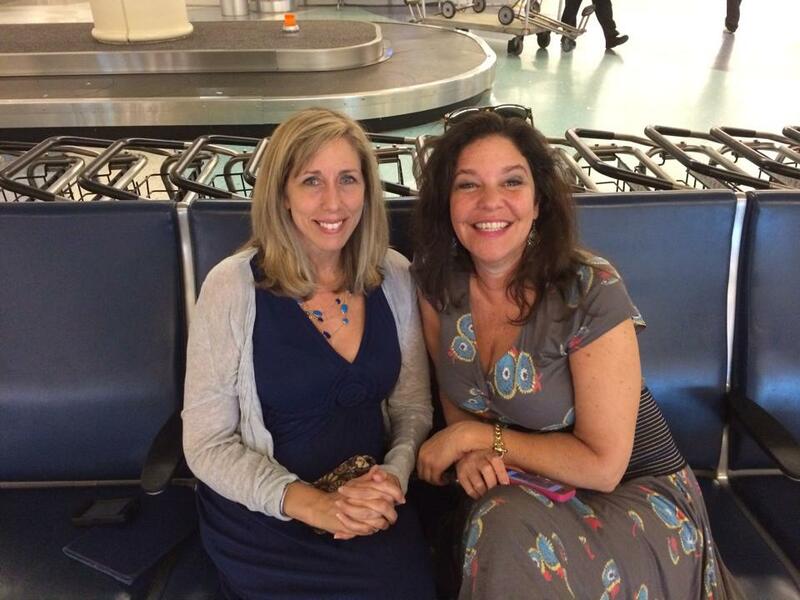 ABUNDANT GRATITUDE for Lisa Hilton and for this amazing opportunity to be Virginia state coordinator again this year! 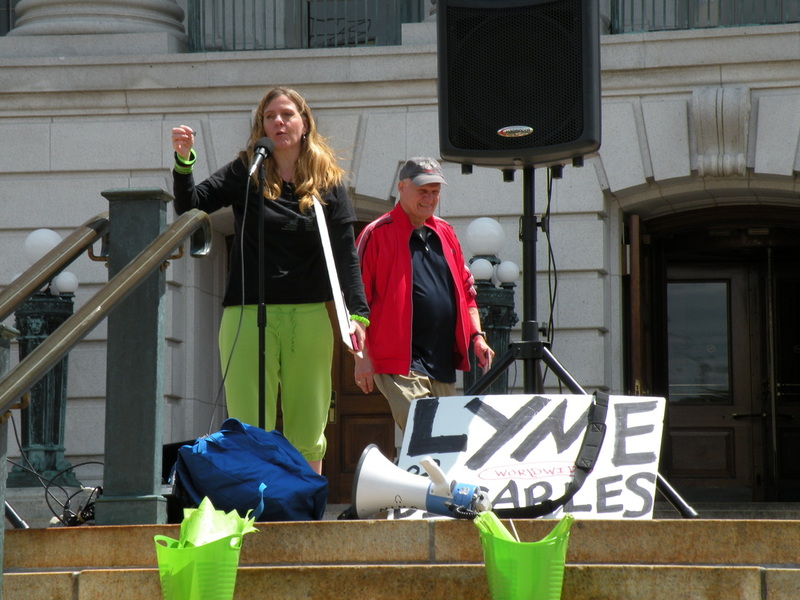 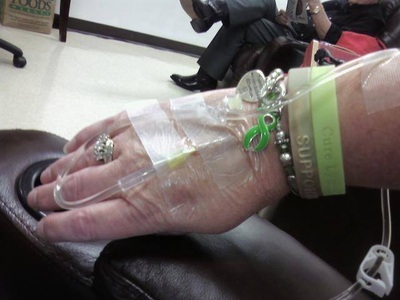 Finding Lisa Hilton linked to Lyme advocacy last year brightened my Lyme healing journey. 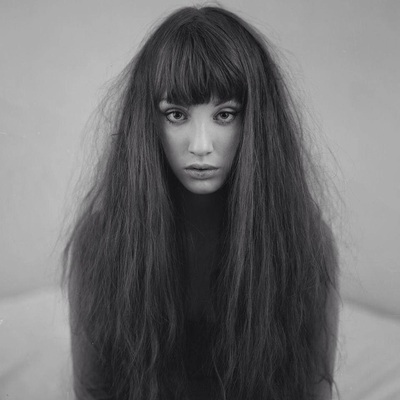 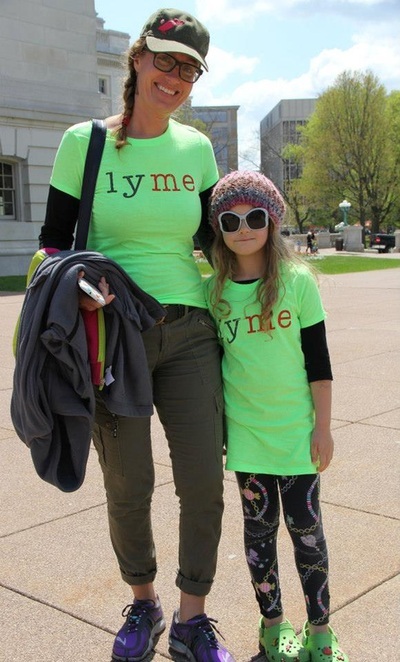 You are an amazing woman and Lyme warrior. 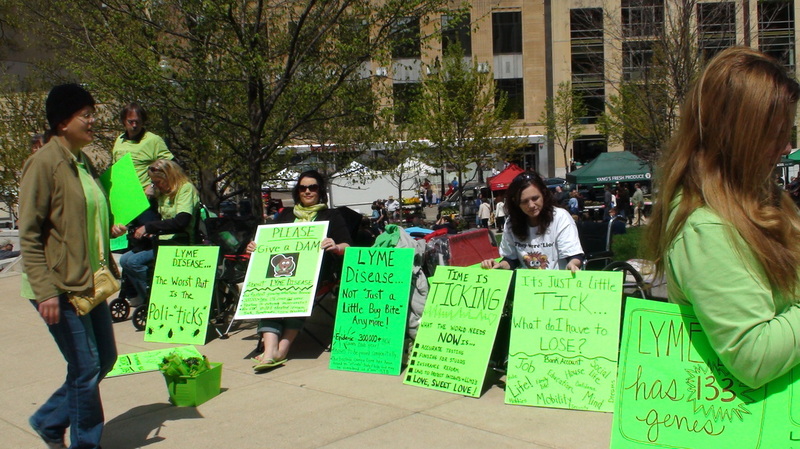 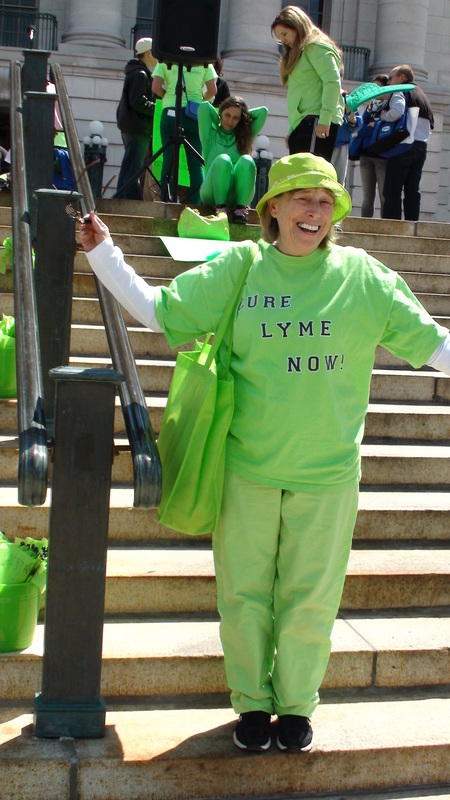 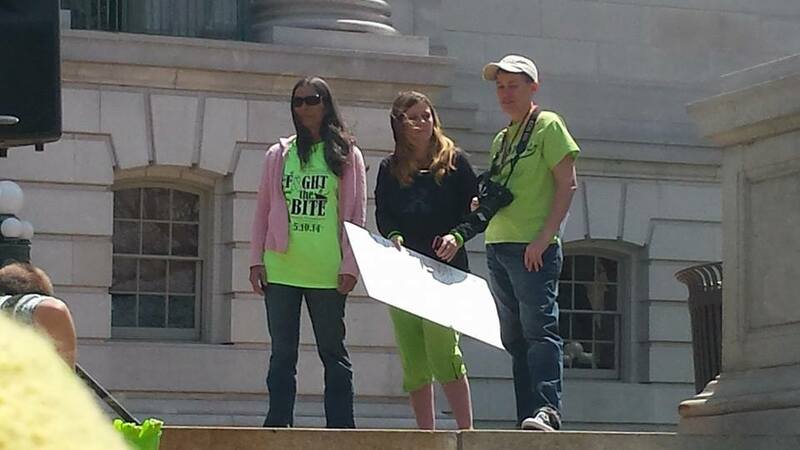 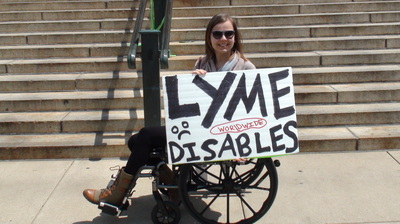 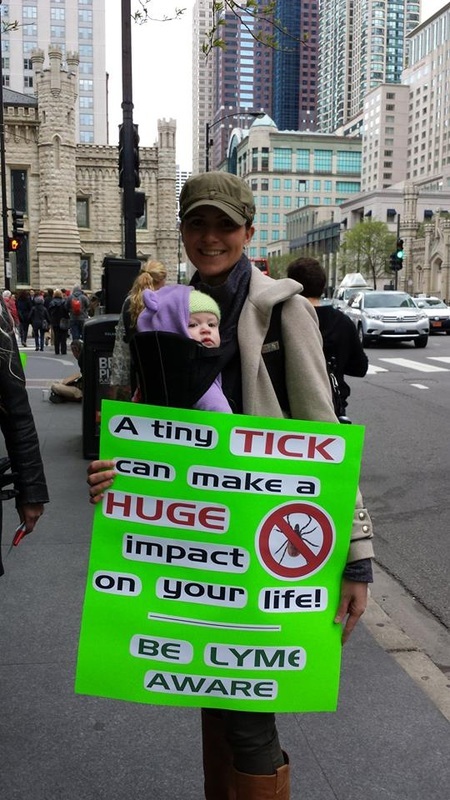 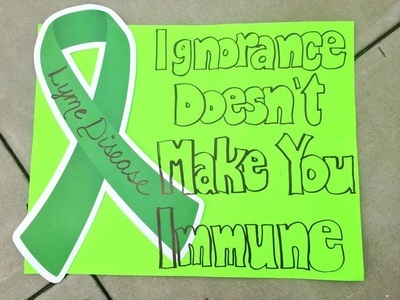 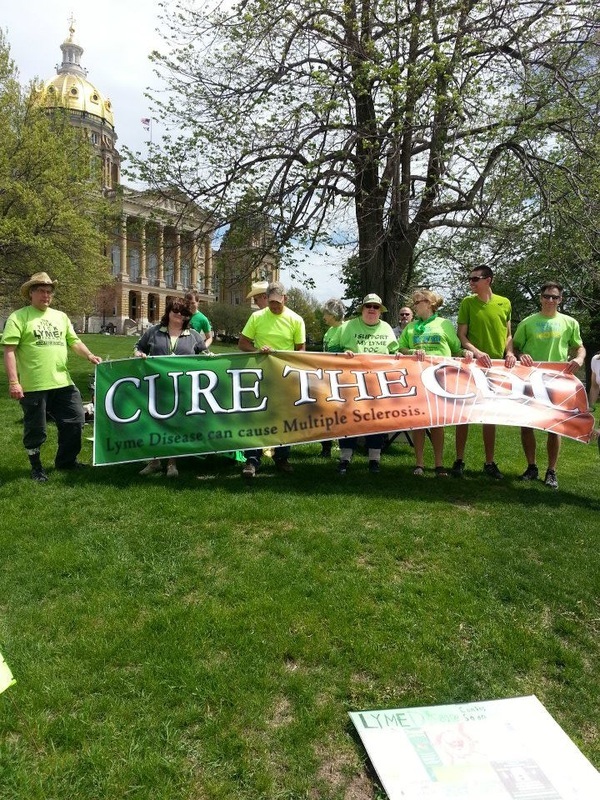 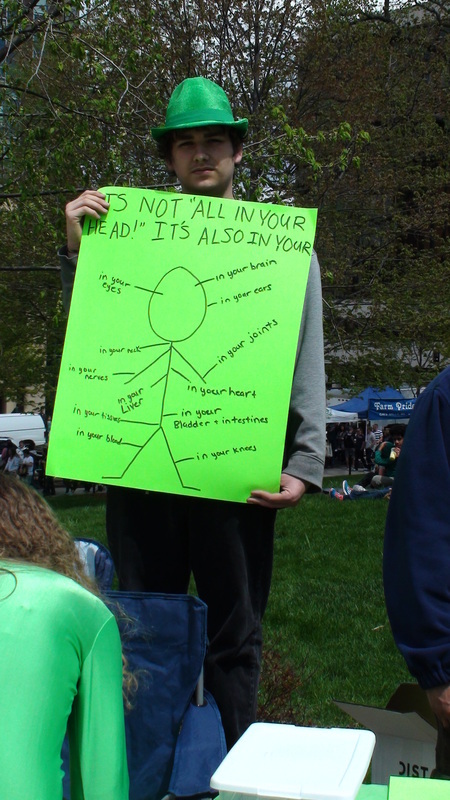 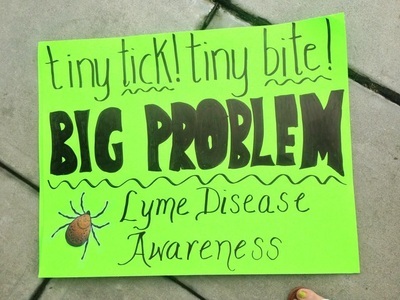 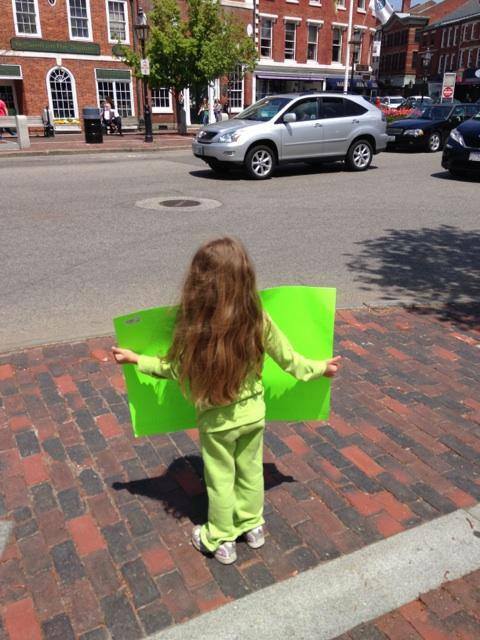 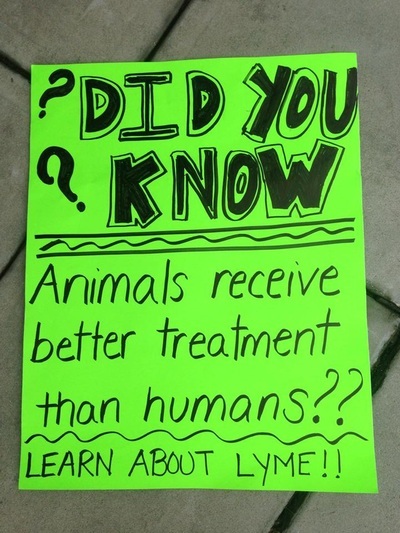 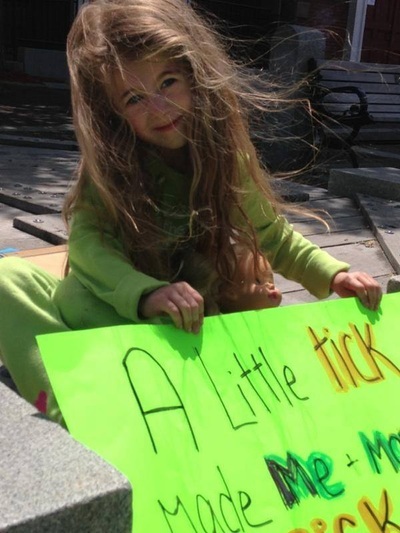 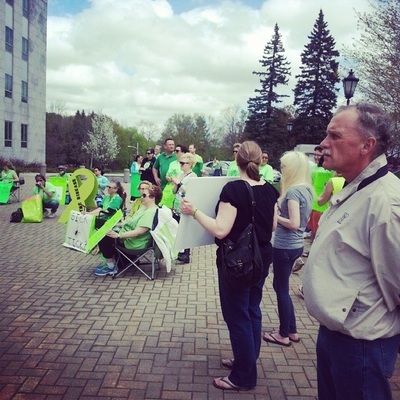 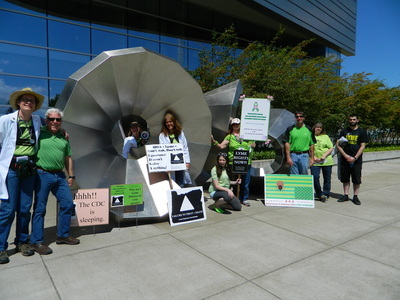 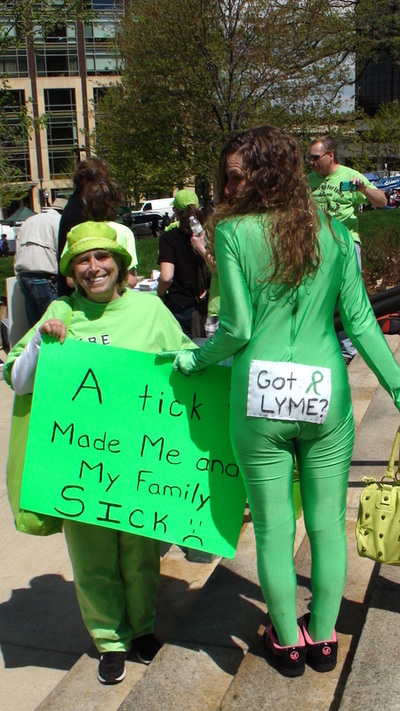 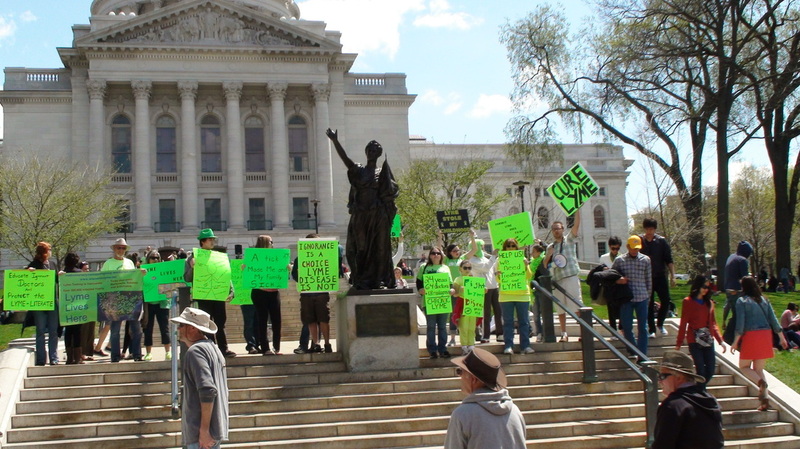 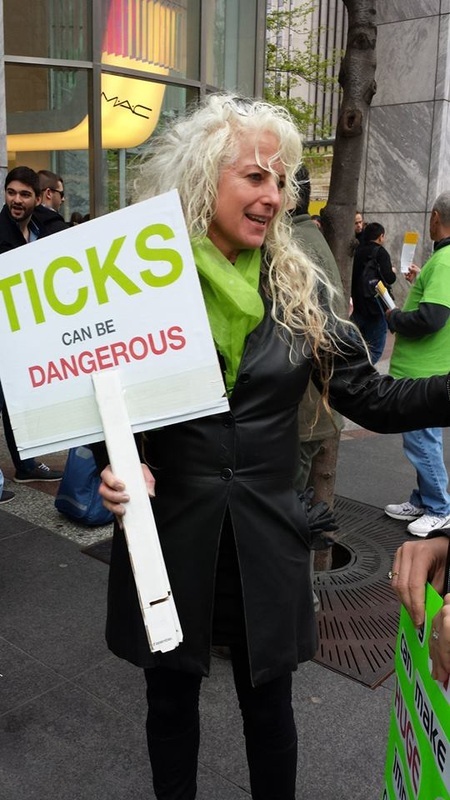 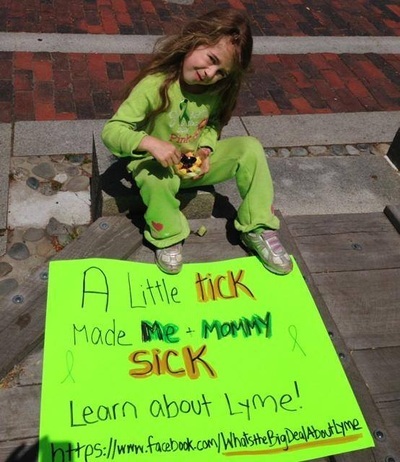 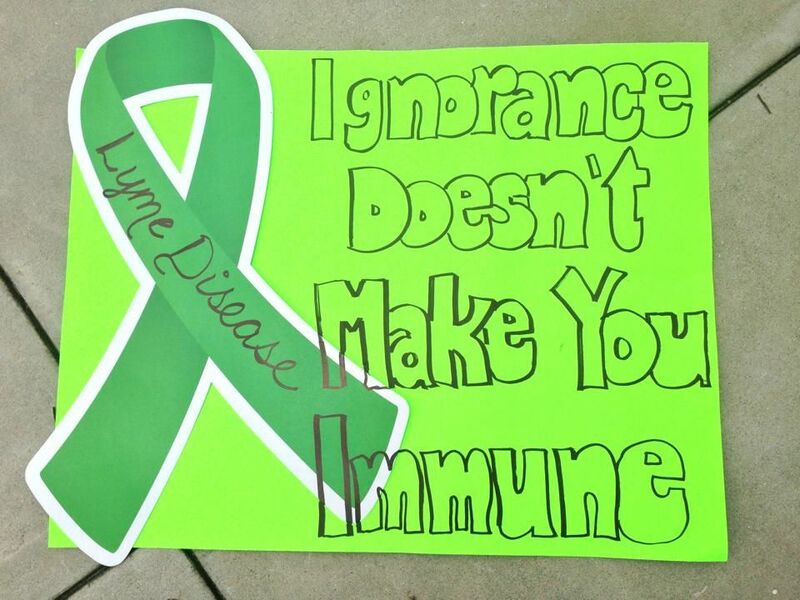 Thank you for all that you do for Lyme awareness and the Worldwide Lyme Disease Awareness Protest! 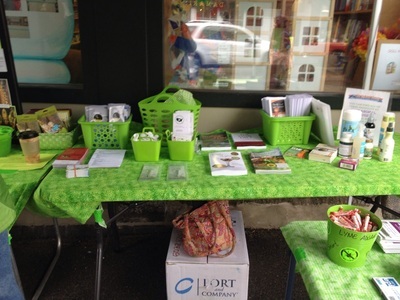 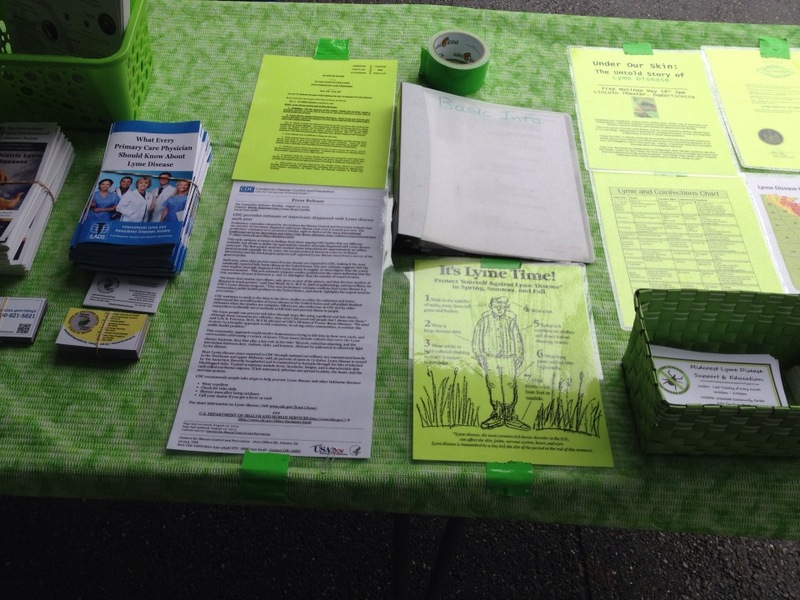 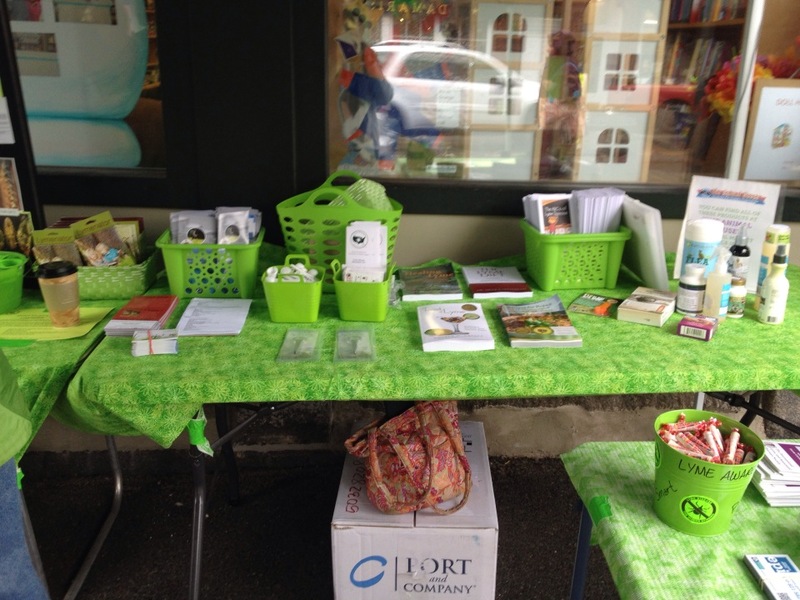 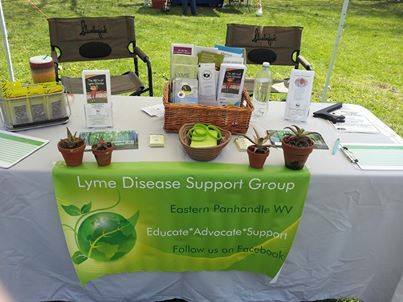 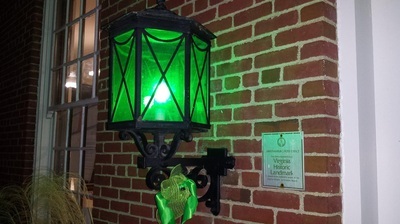 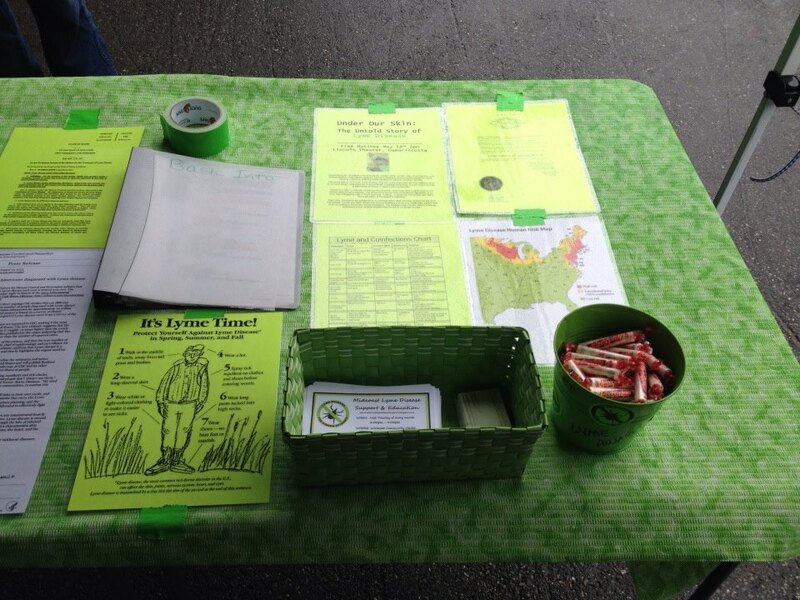 Lastly, Gratitude to the Blacksburg Farmer’s Market for allowing us to set up our goodies and brochures to protect and inform our community about Lyme disease and the WWLDAP 2014!" 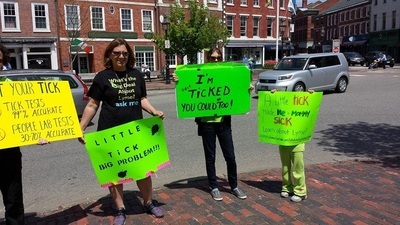 "We're ready to go rock the Spit this afternoon, joining 30 countries around the world, to open people's eyes to the FASTEST-GROWING infectious disease in America today. 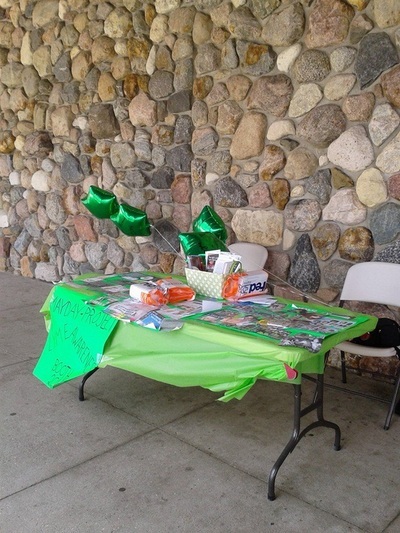 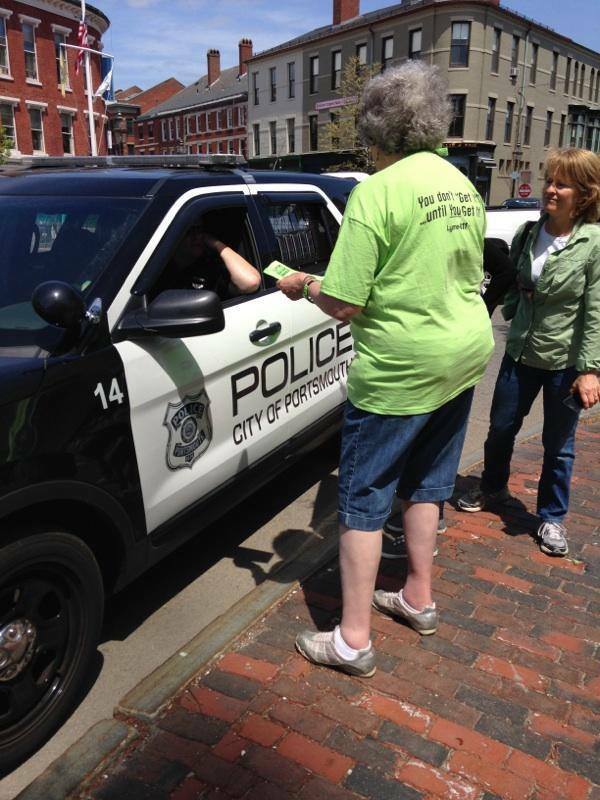 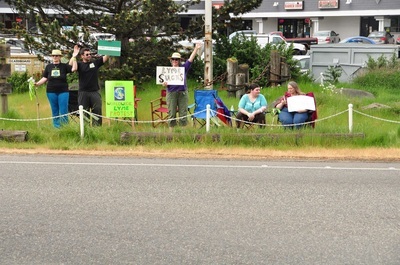 Come by, wave, honk, or stop in the parking lot and get information to keep you and your family as safe as possible. 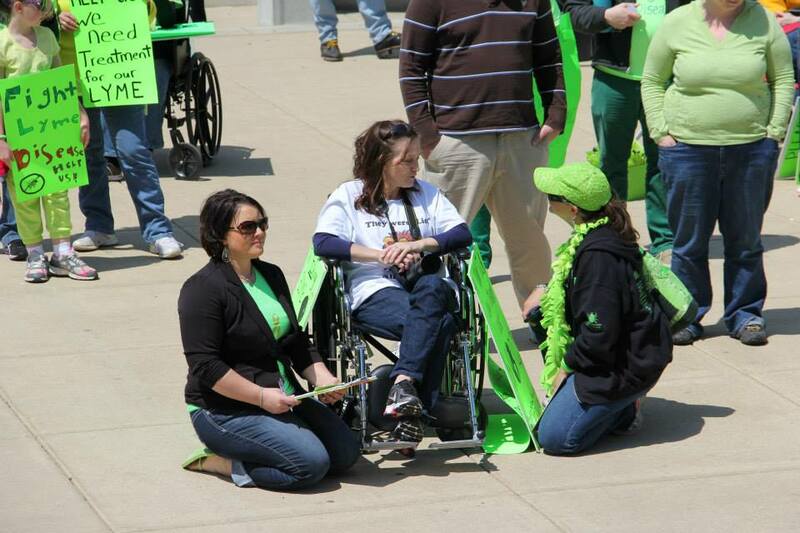 We strive for meaning in this journey...and strive to keep you from this journey. Peace...oh yes, photo is by the lovely Dale Goodvin!"